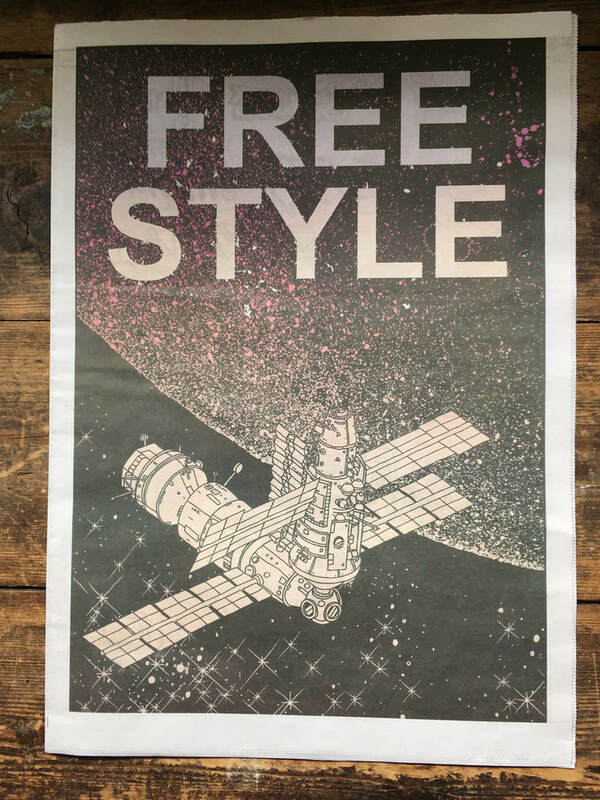 Free Style available FREE with any purchase from our online store or in person at the storeroom. For this exhibition we invited friends from print studios around the world to design a poster for an imaginary science fiction movie. 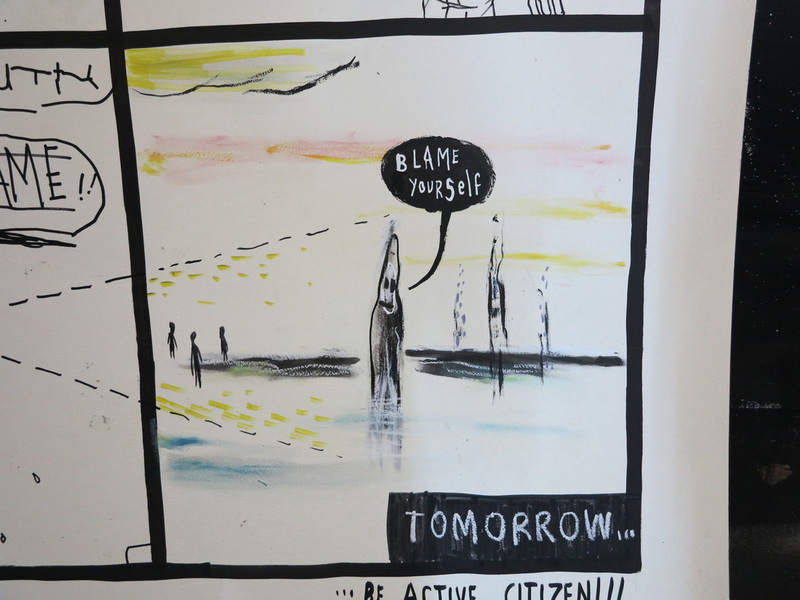 They interpreted the theme in all sorts of ways; some explored how contemporary global politics is unfolding: do we have hope for the future? 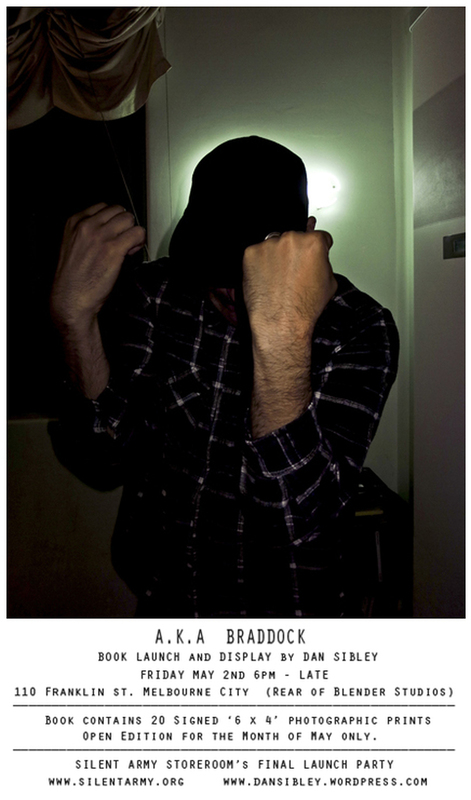 Or is resistance futile? 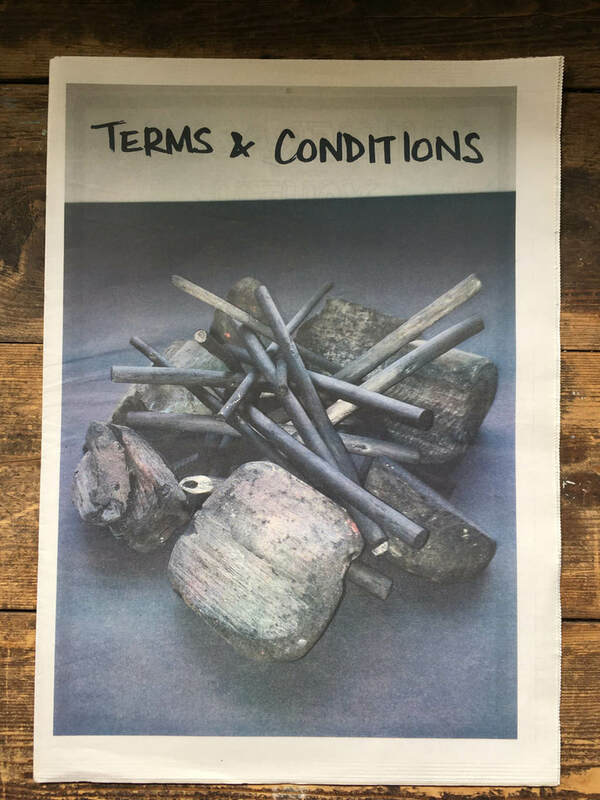 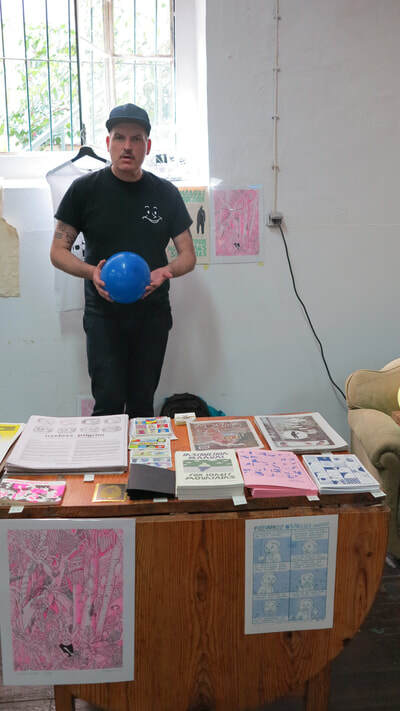 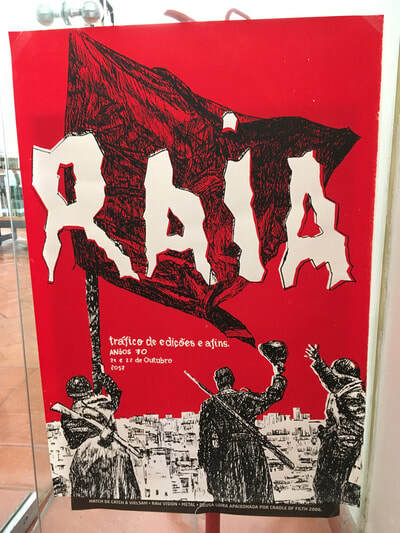 Others explored the medium of screenprint itself: is the screenprinted poster still a medium for resistance movements, or has it become a luxury commodity for the Art market? 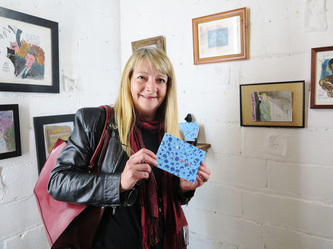 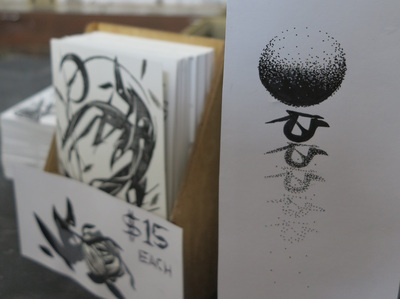 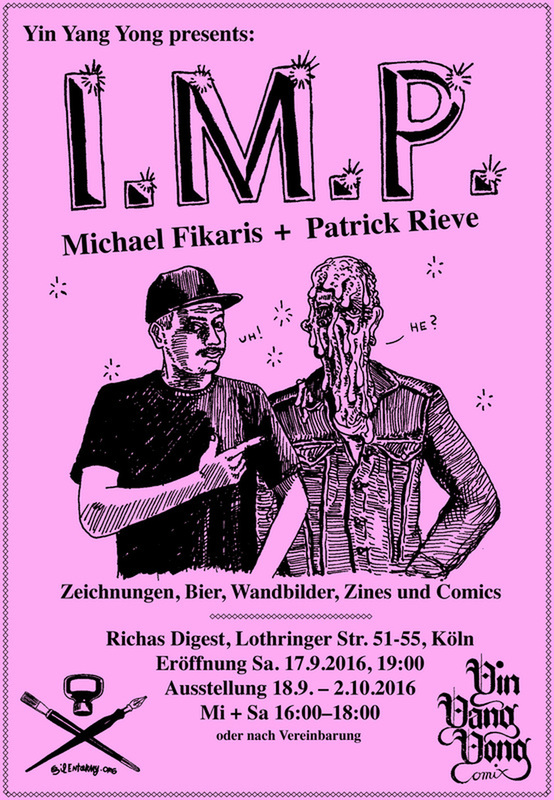 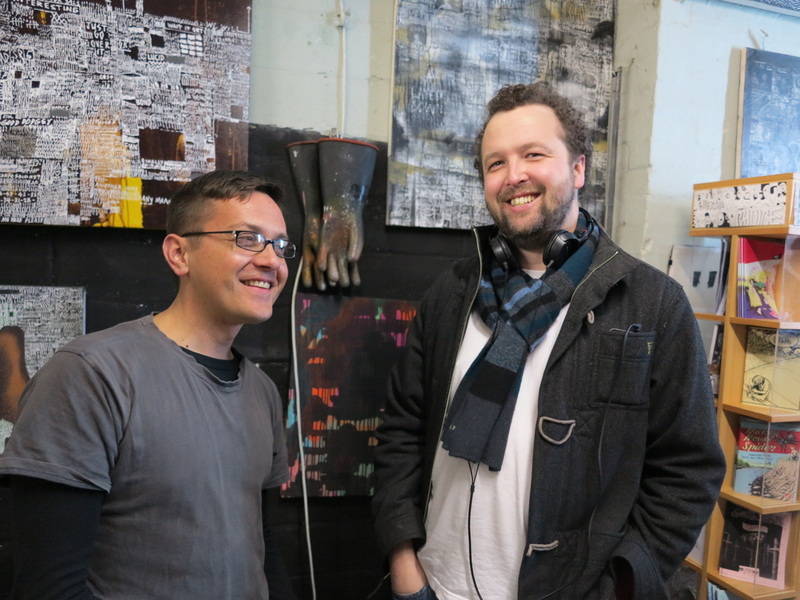 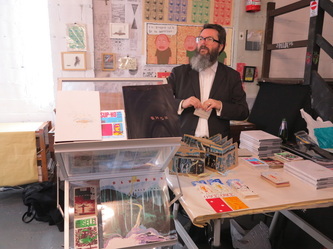 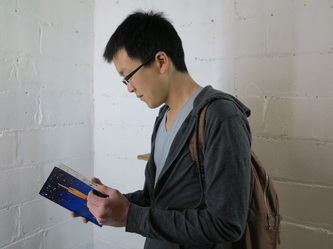 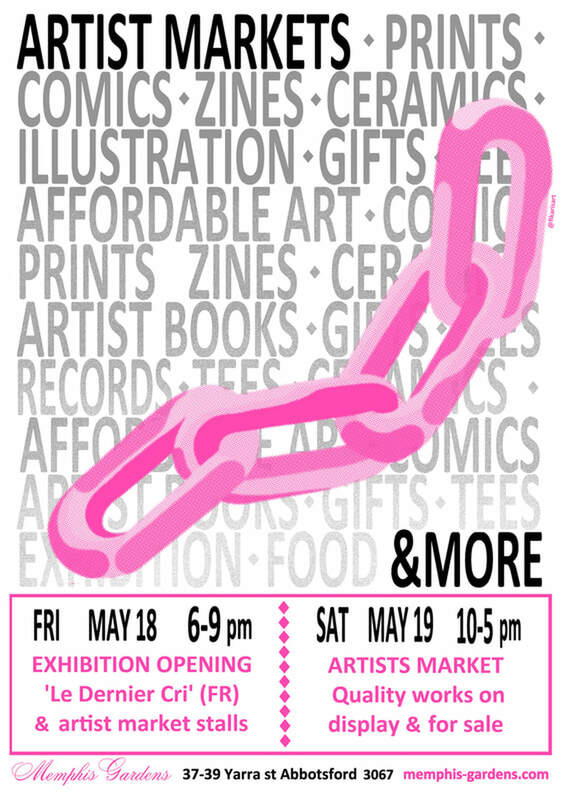 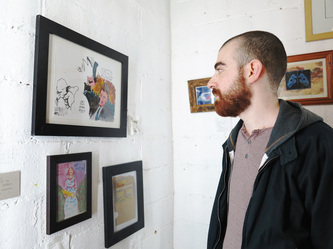 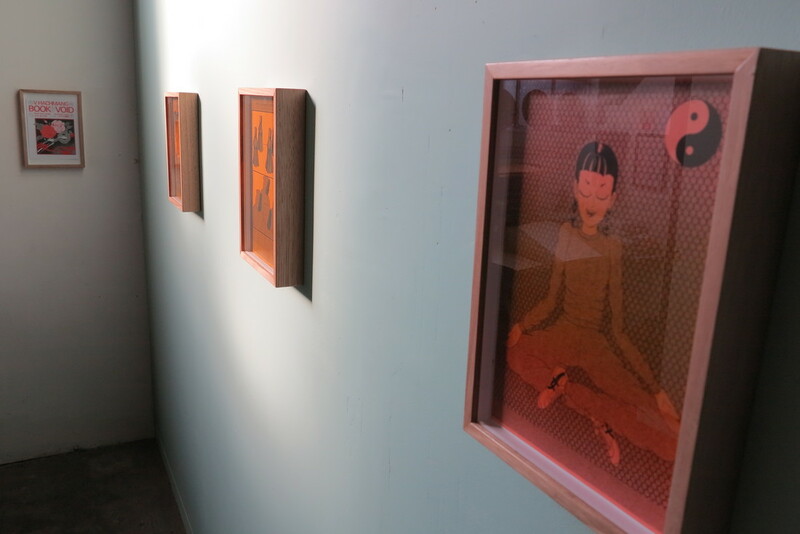 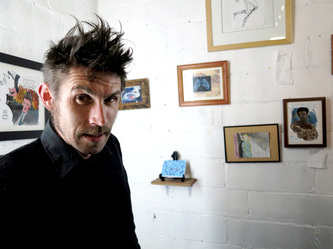 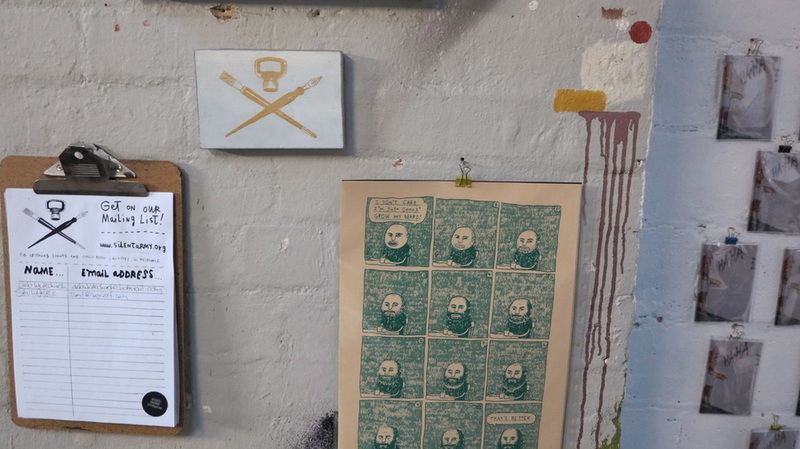 All the works have been screenprinted at Krack in eye-popping sci-fi detail. 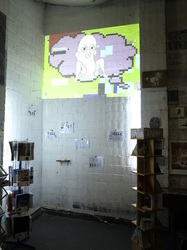 The future awaits you at Krack! 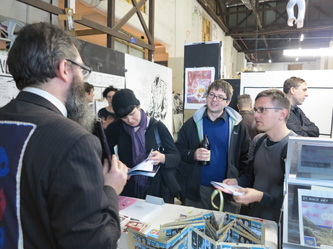 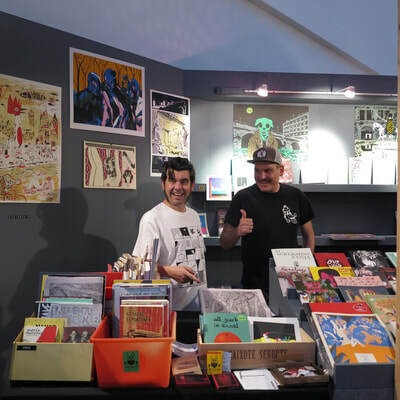 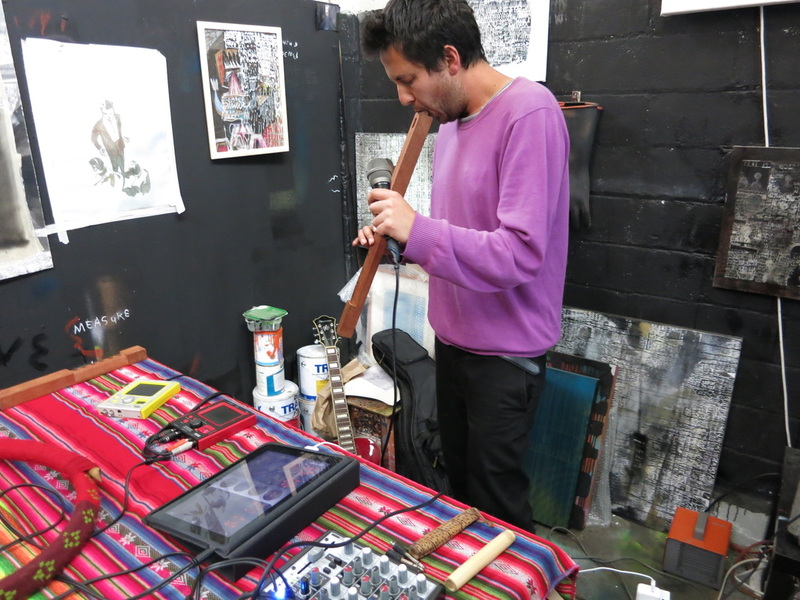 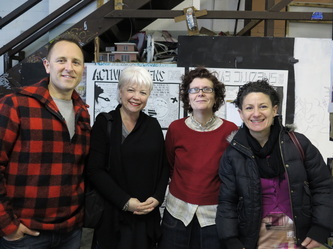 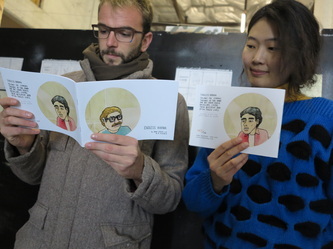 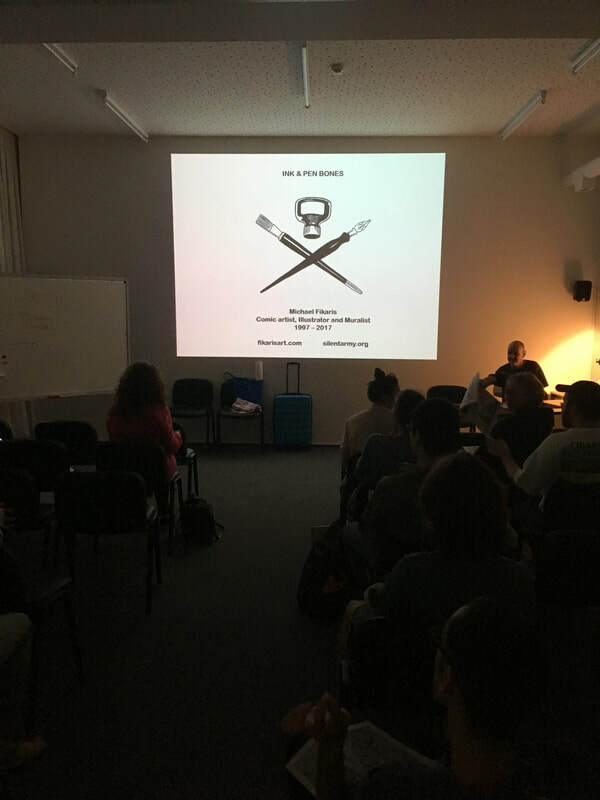 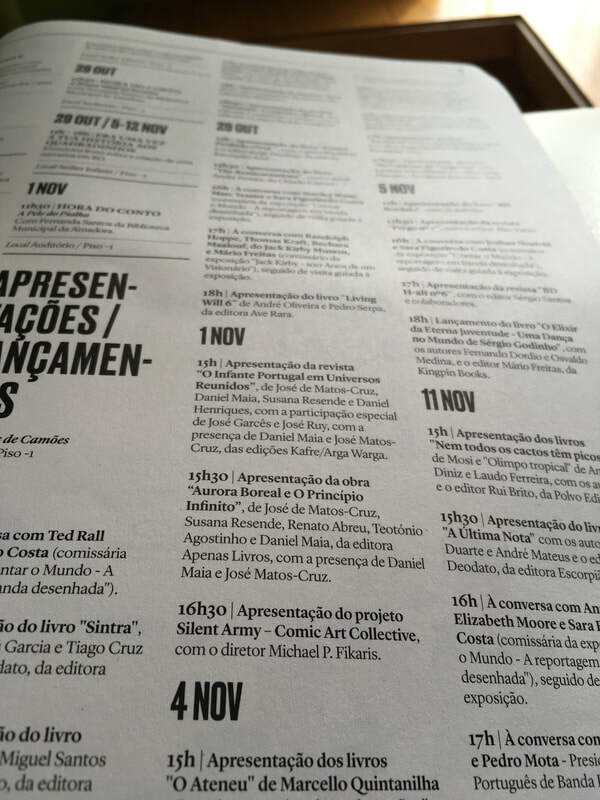 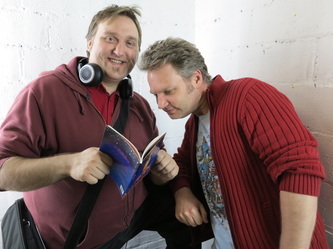 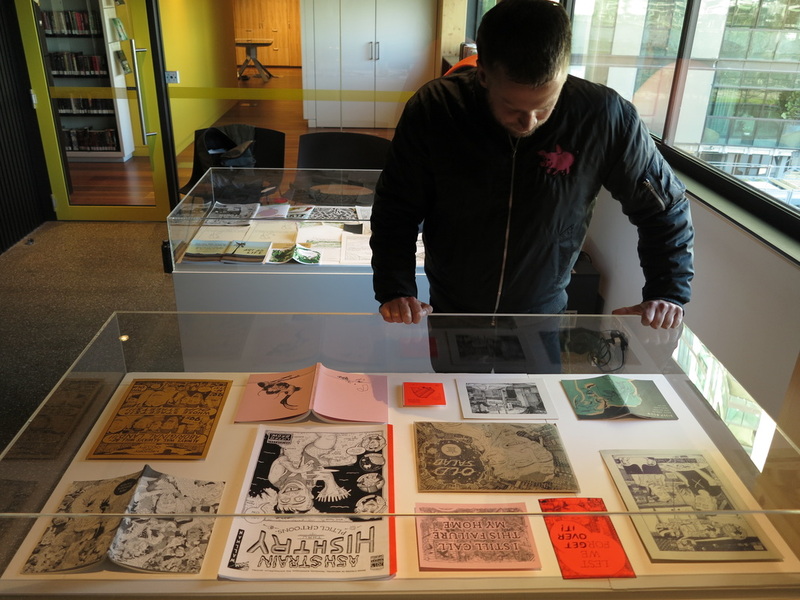 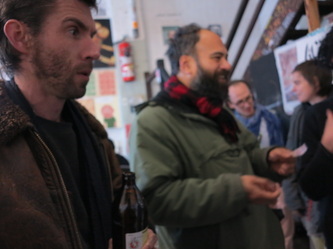 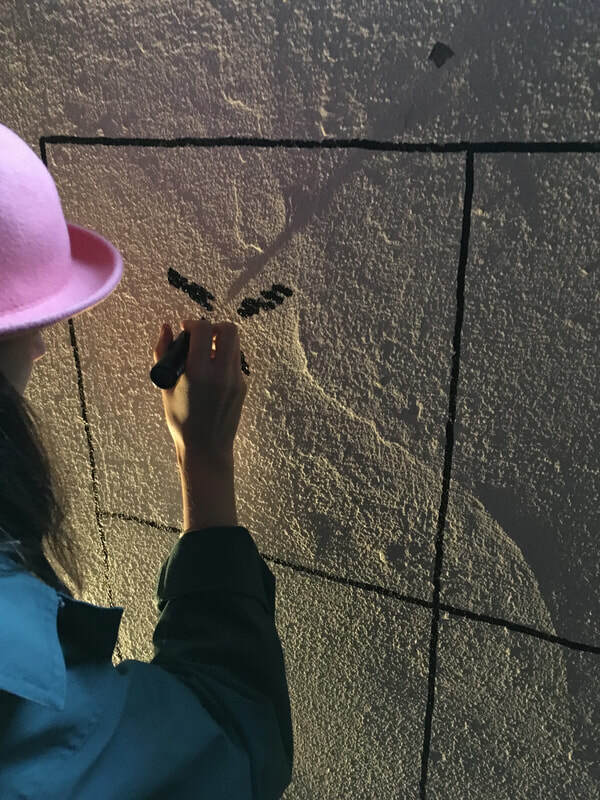 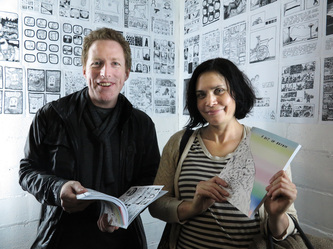 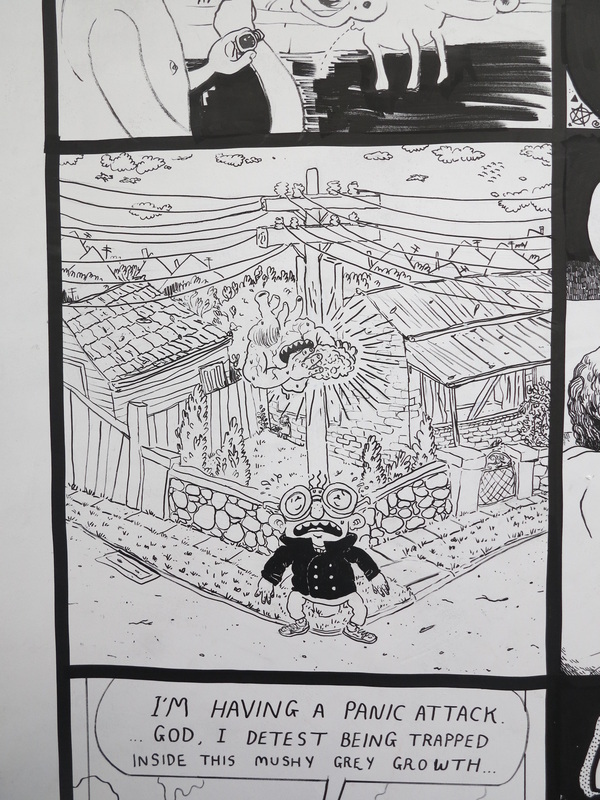 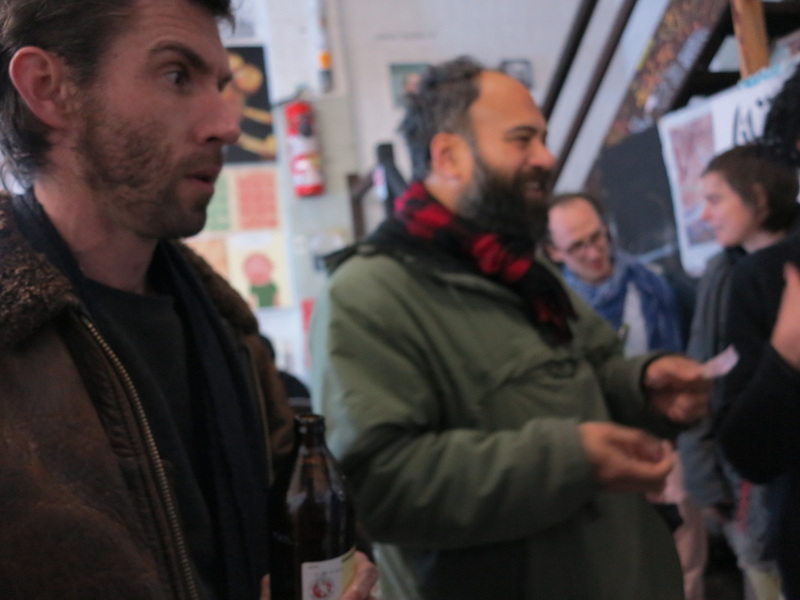 We were recently in Europe promoting Silent Army in Germany and worked for a month with Yin Yang Yong Comix on a show and met likeminded collectives from France, Spain, England and Portugal thanks to Australia Council for the Arts. 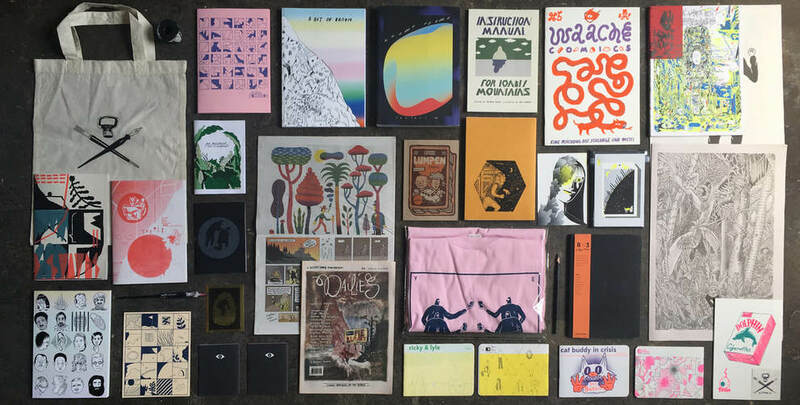 More collaborations to follow in 2017. 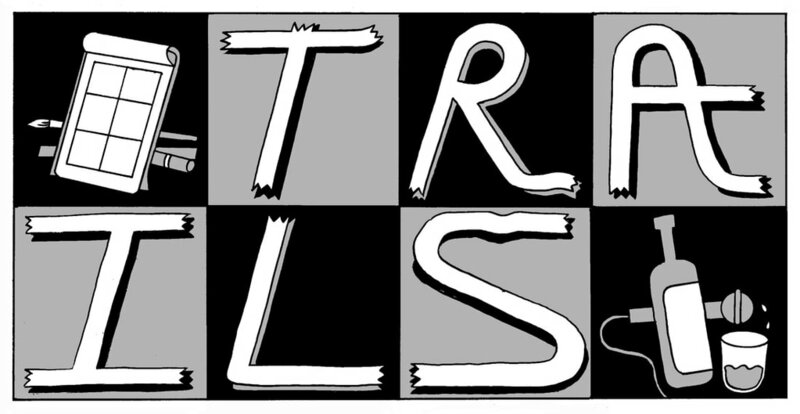 Trails drawing session 9/7/16. 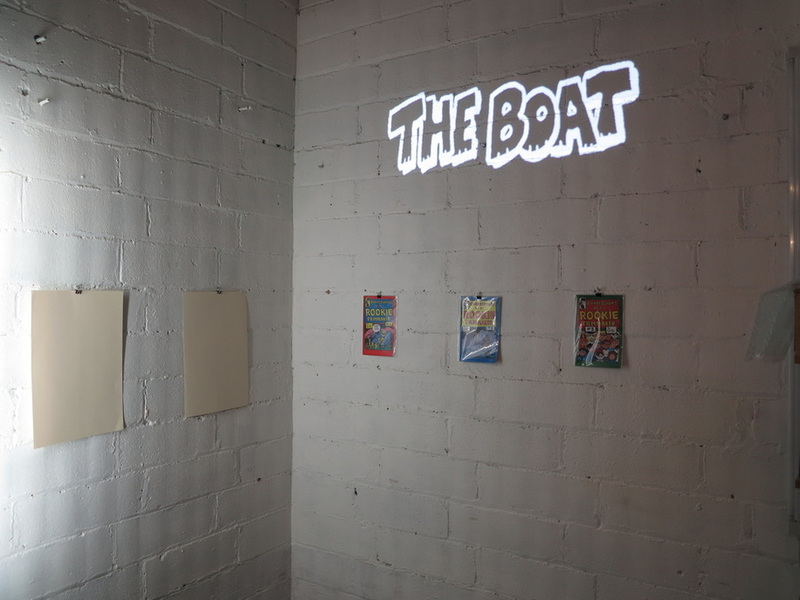 Photos by Sealegs Imagery. 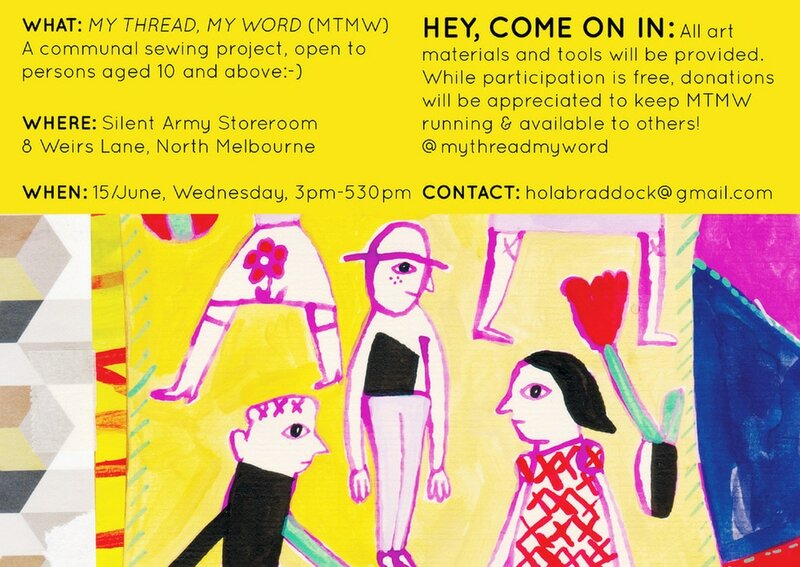 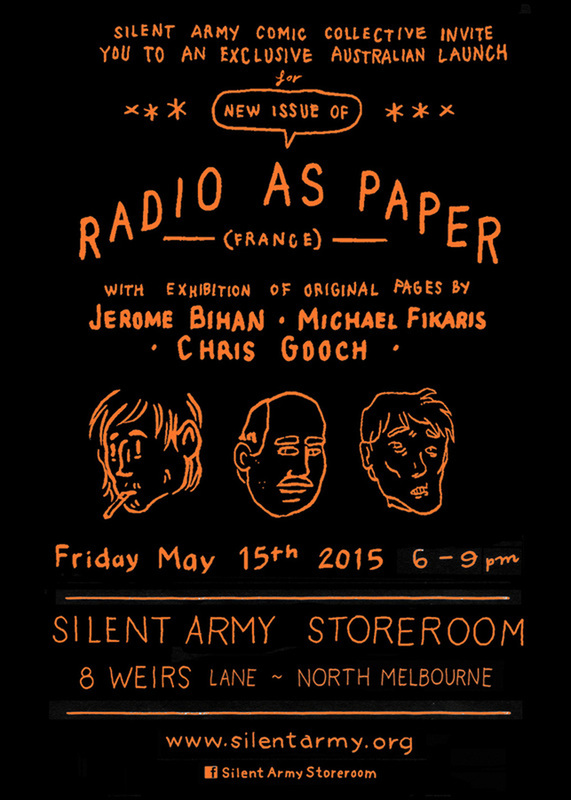 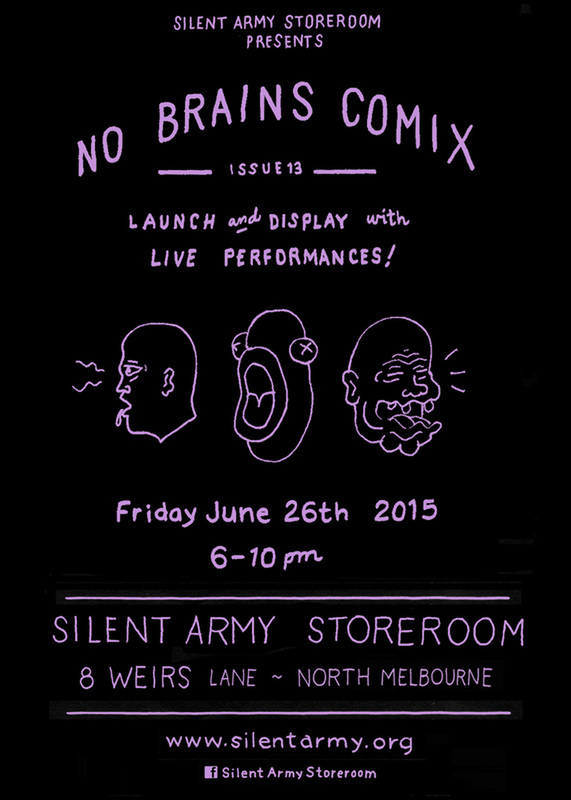 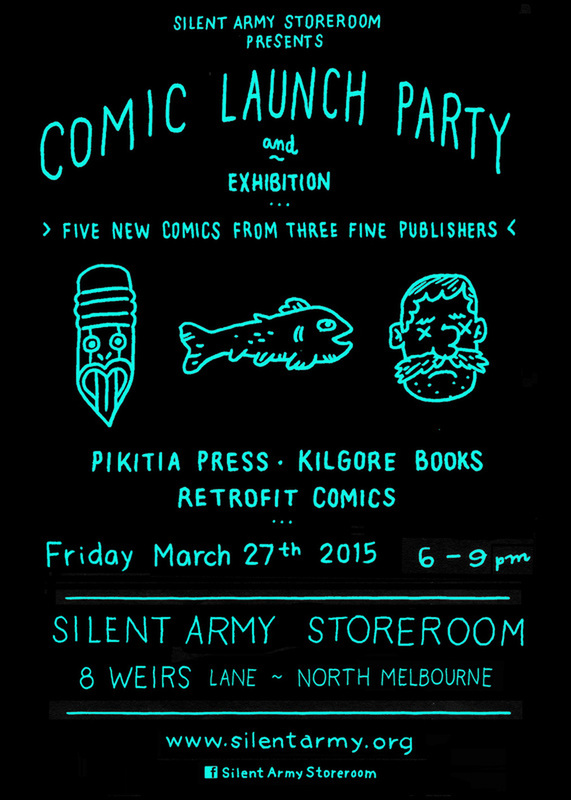 PIXIN is in Australia and doing a display/workshop at the Silent Army Storeroom on June 15th. 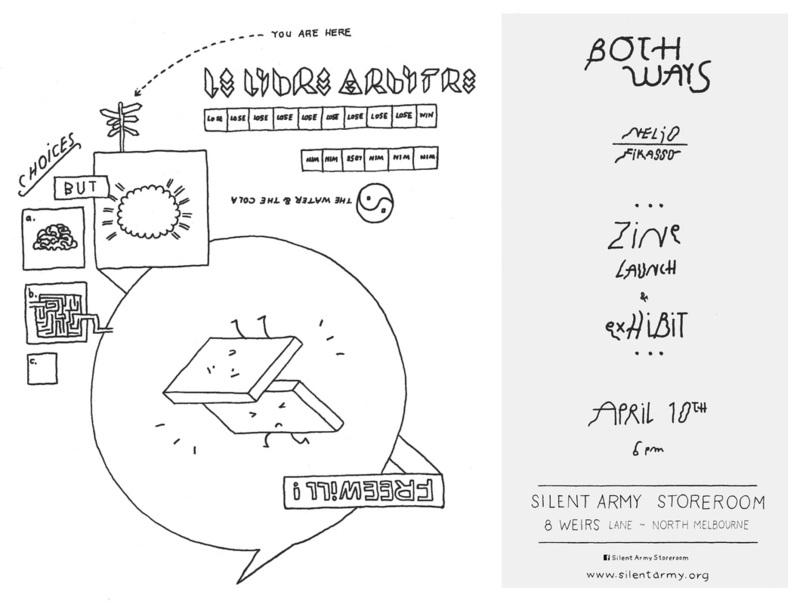 The latest Silent Army publication is an anthology of single pages called Bread & Roses printed by The Office of Public Works. 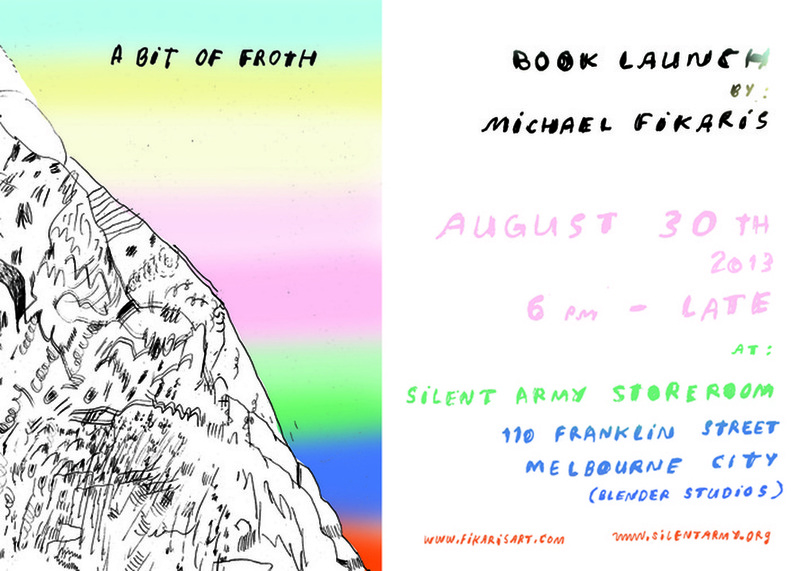 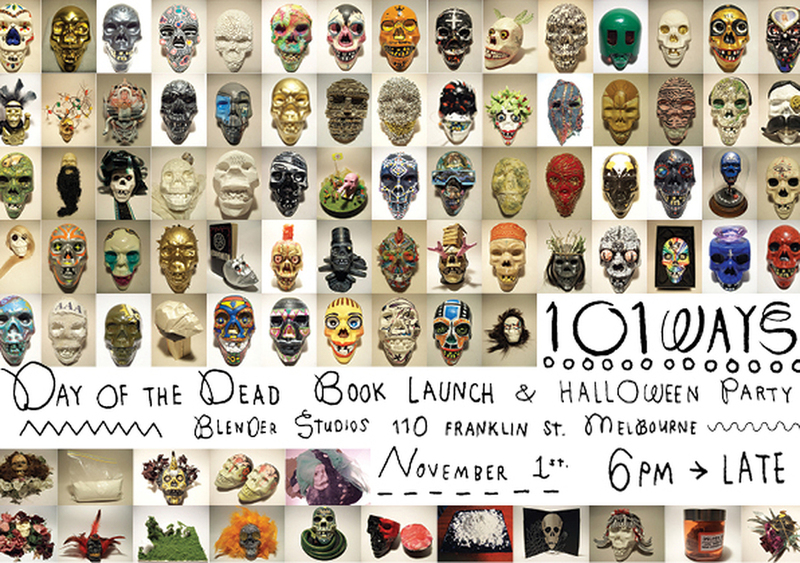 BOOK LAUNCH for new Silent Army Anthology 'Where do I belong?' 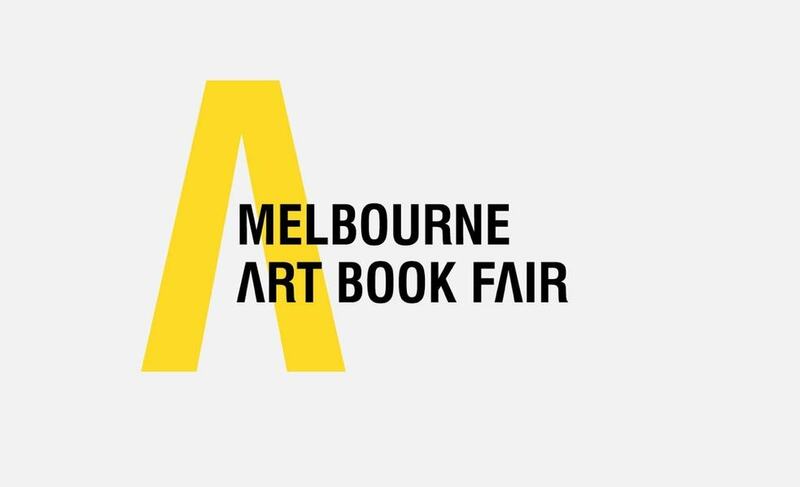 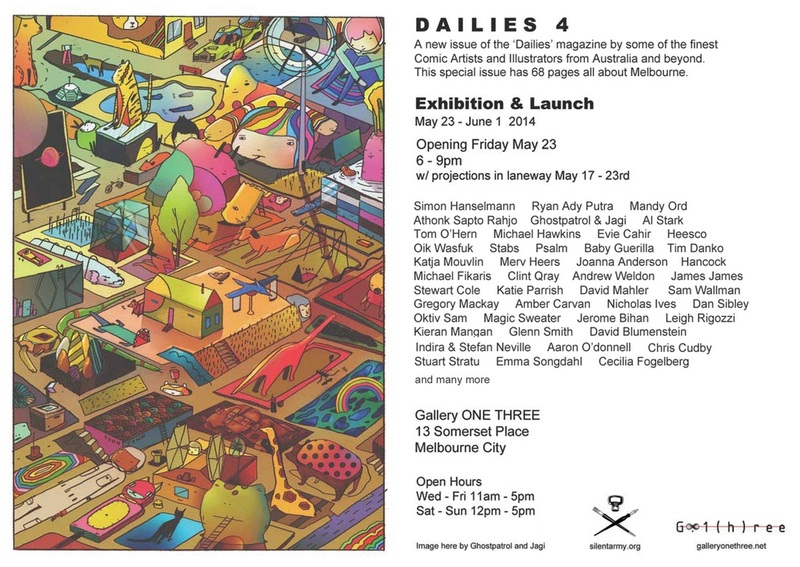 coming this month in Melbourne JULY 10 4-6pm at City Library on Flinders Lane. Prints available from the Refugee Art Project. 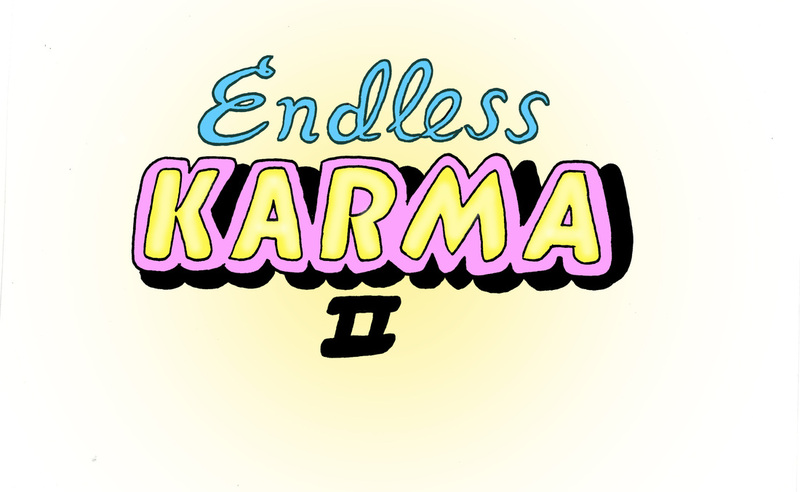 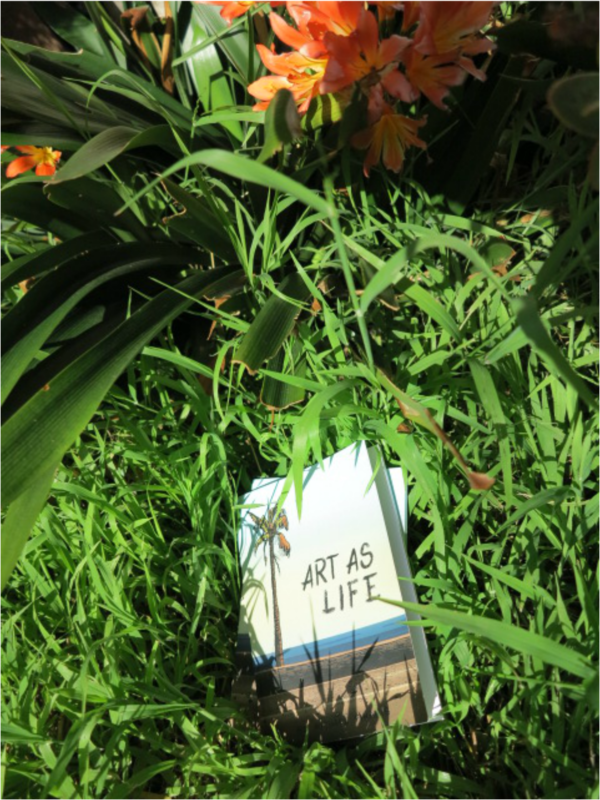 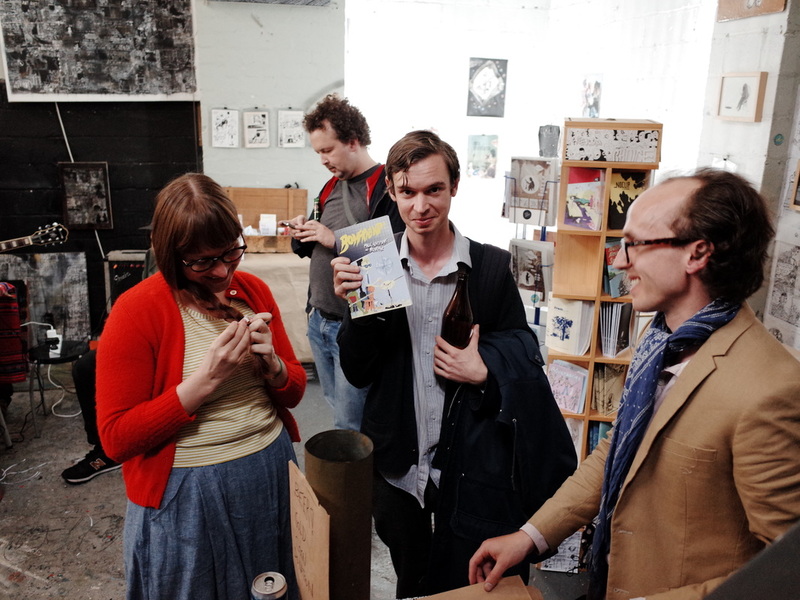 Book edited by Michael Fikaris, Sam Wallman and Safdar Ahmed. 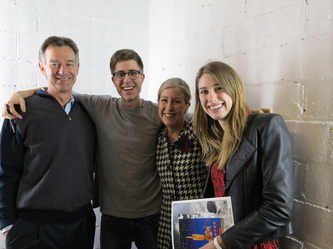 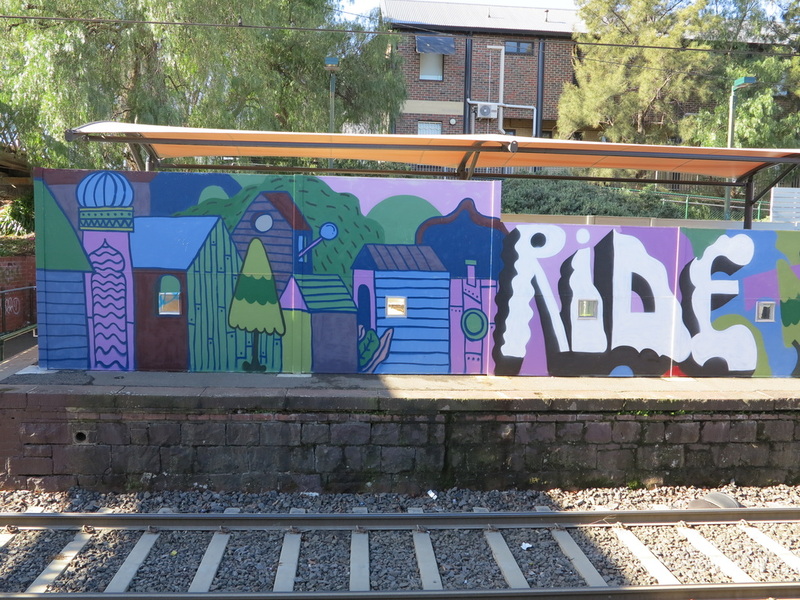 Fikaris and Heers of Silent Army completed a 120m mural at the South Melbourne light rail station late 2014. 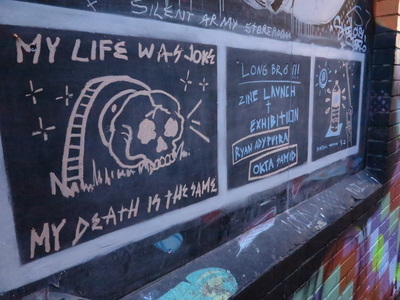 It reads "Hop on a train of knowledge and ride with it always." 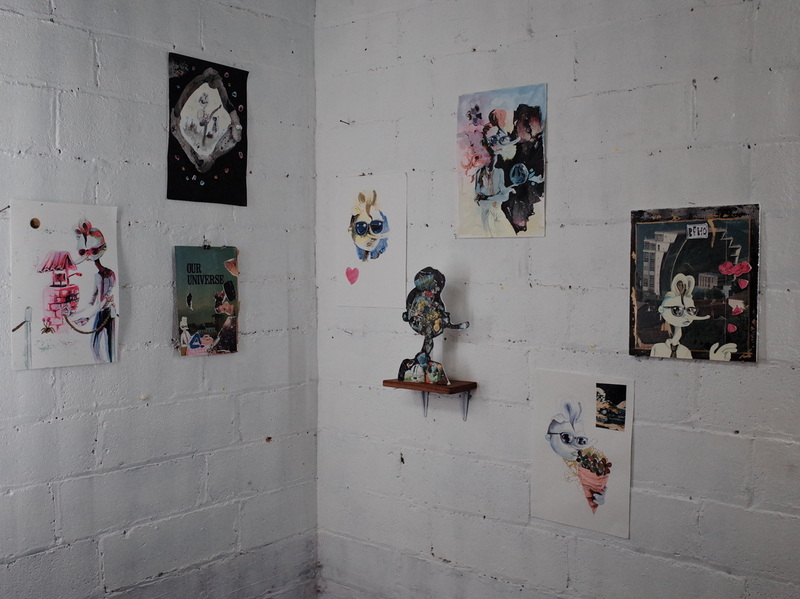 See more pics in PROJECTS. 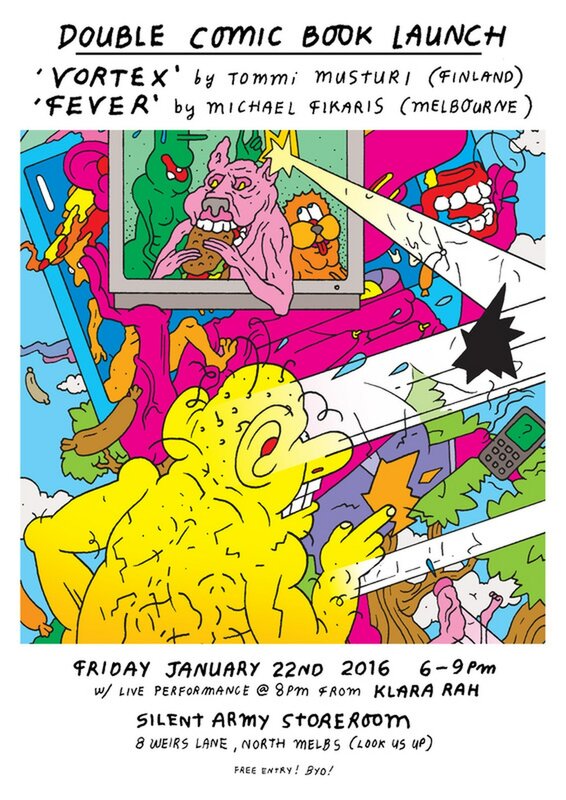 Our last event of the year is FRIDAY DECEMBER 27th. 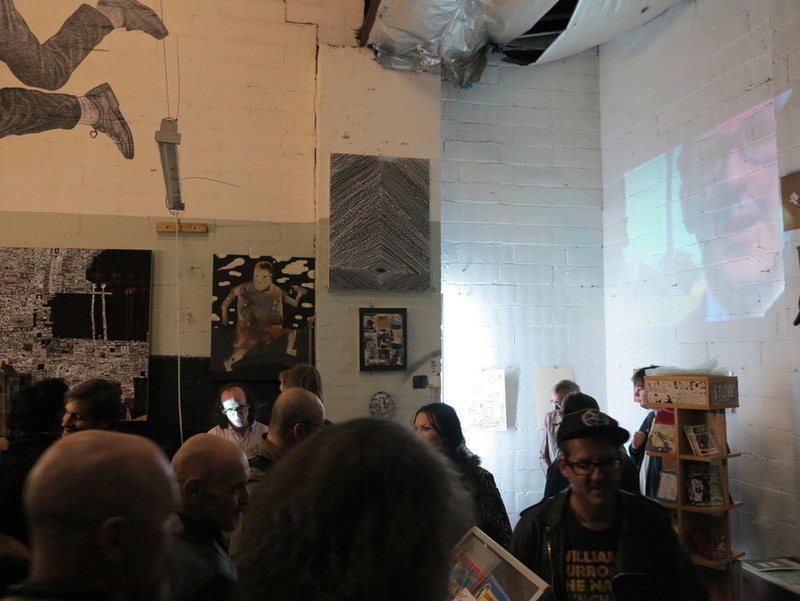 We'll be screening 'BEST OF HUFF' (Hamilton Underground Film Festival; curated by Snake Beings) from 8pm until about midnight. 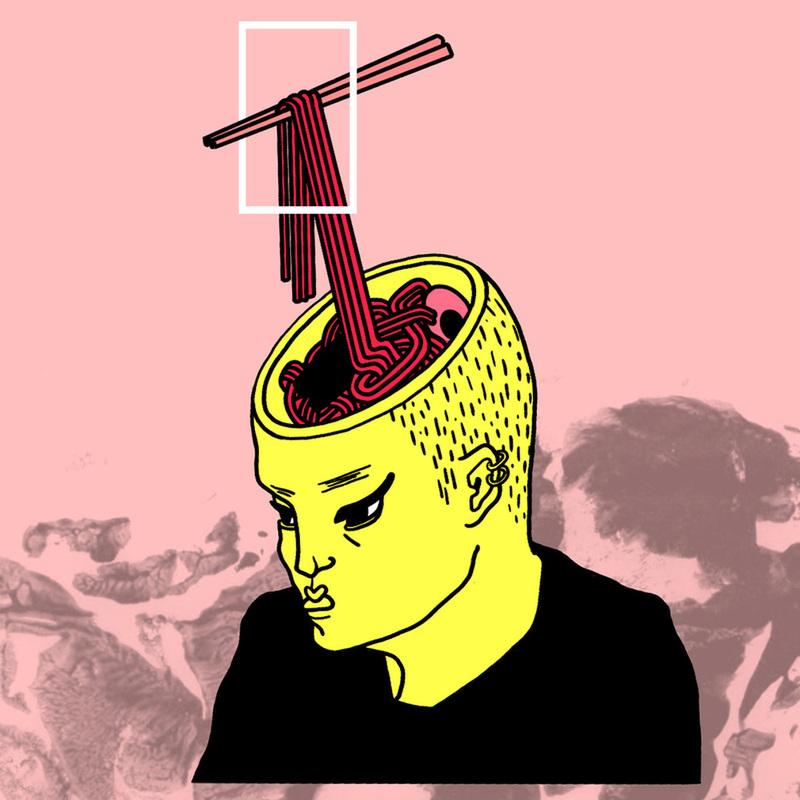 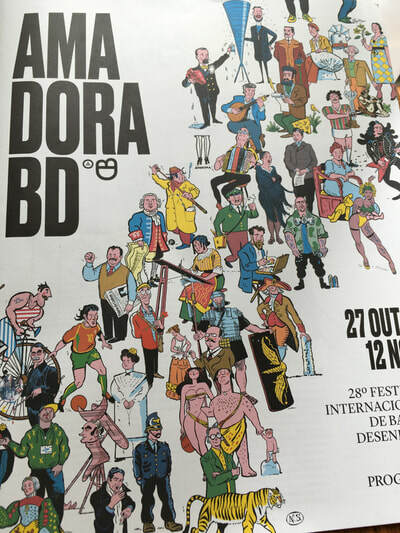 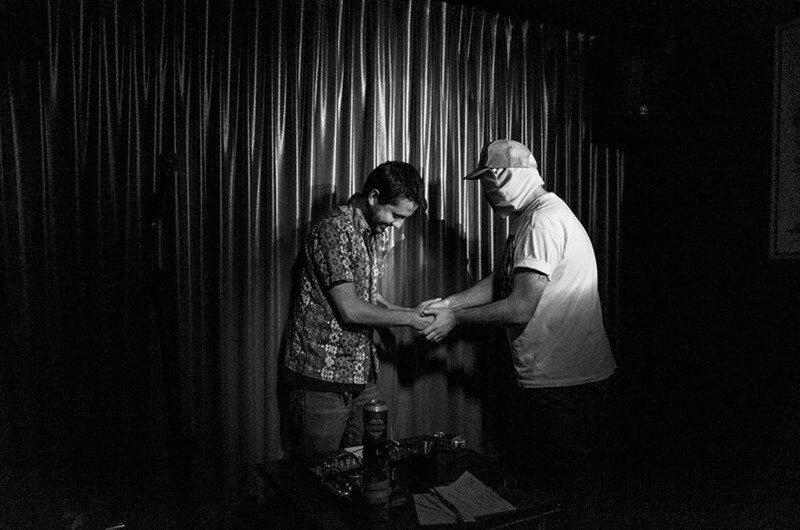 Film below (Hamburger Dandy - Afrika Psuedobruitisms) is included with 23 other unbeleviably ingenious and underground gems playing on loop with sound and a few refreshments to take us out. 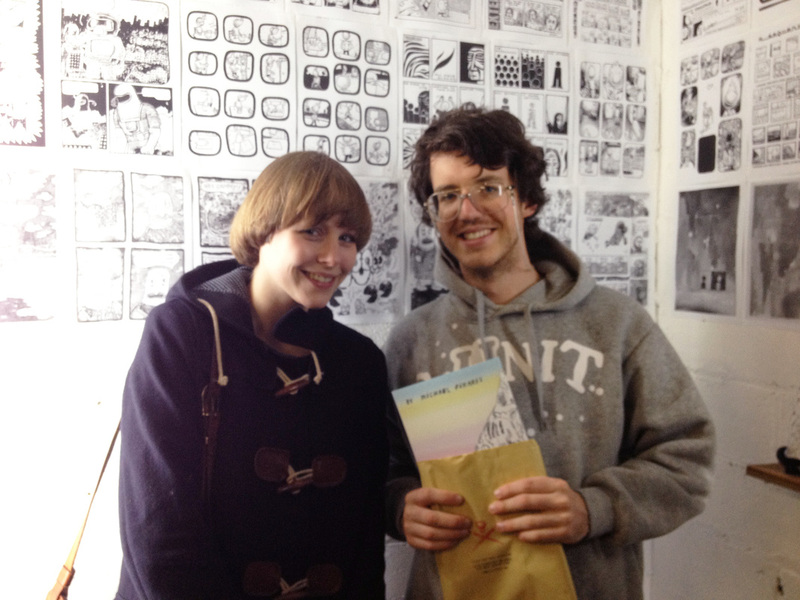 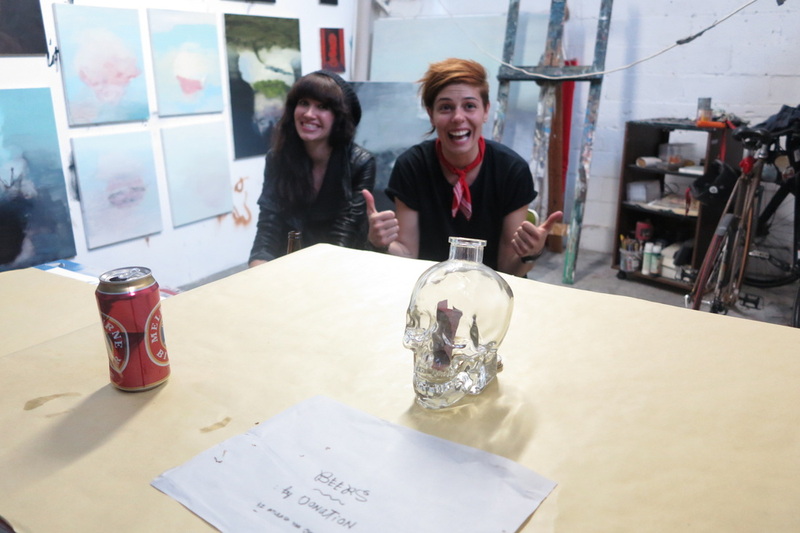 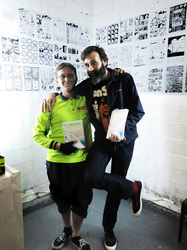 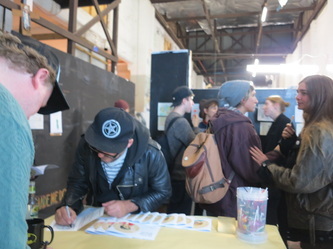 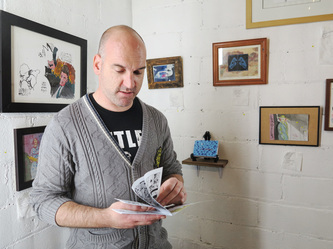 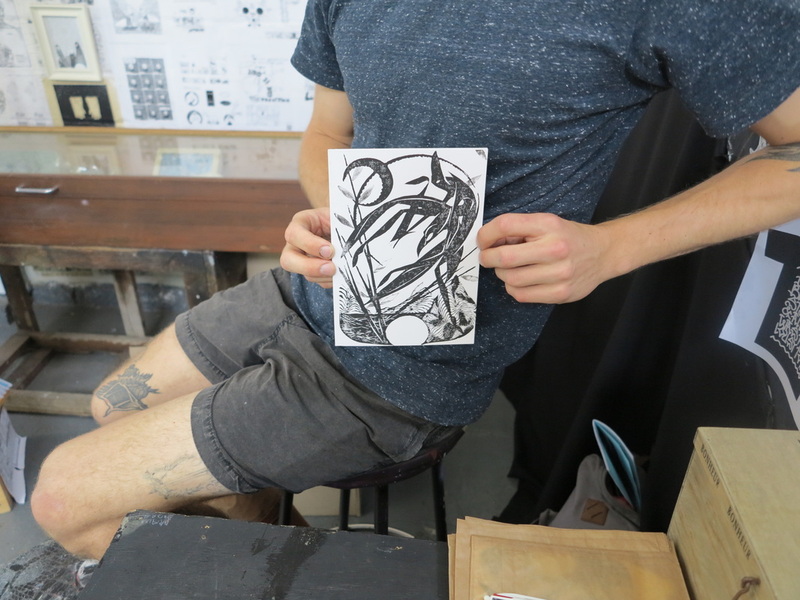 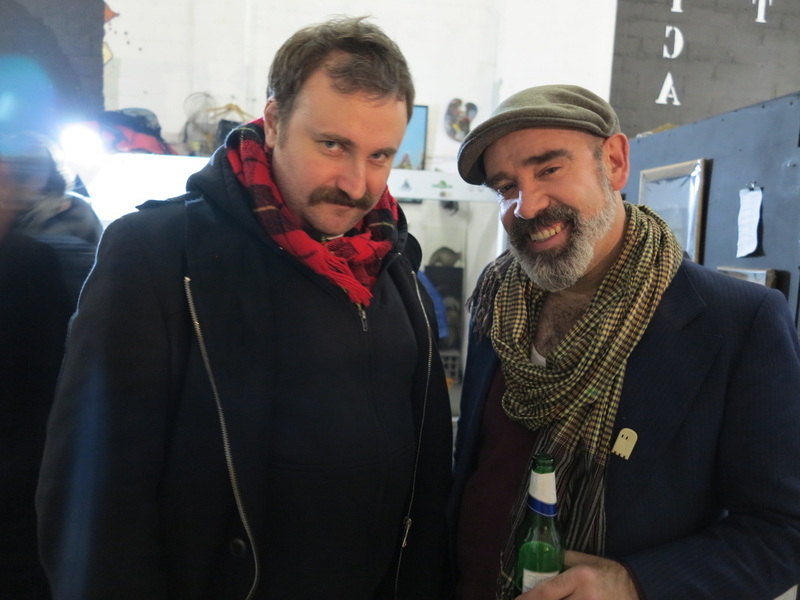 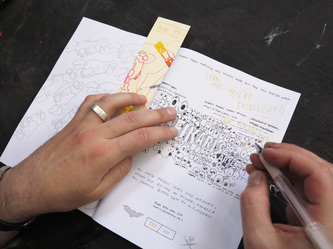 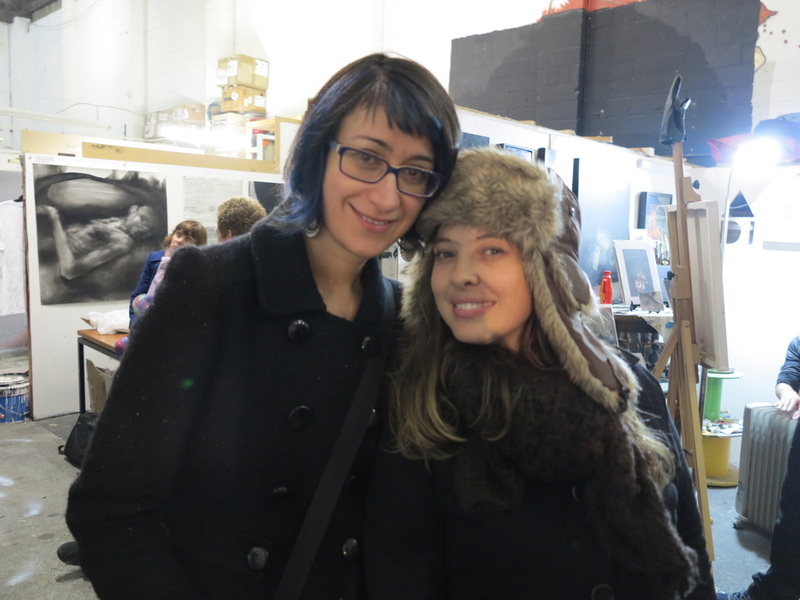 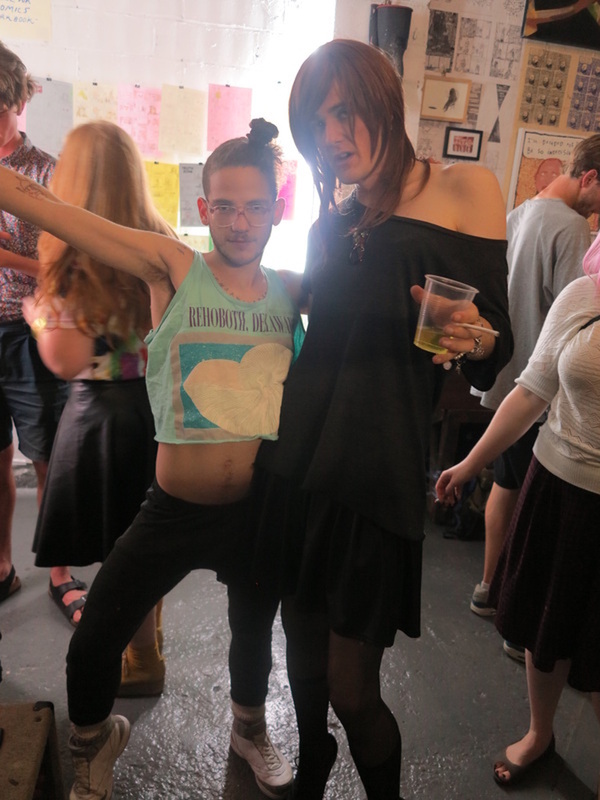 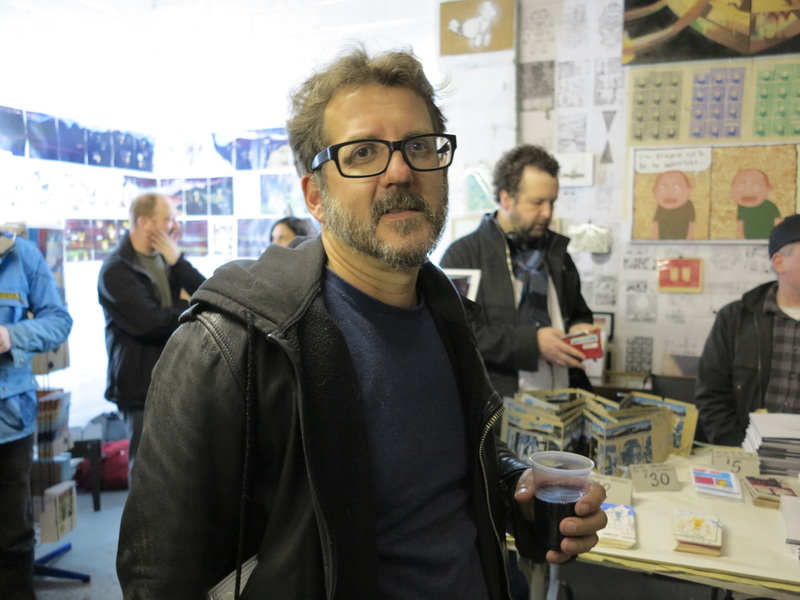 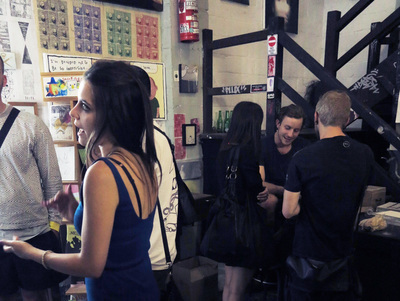 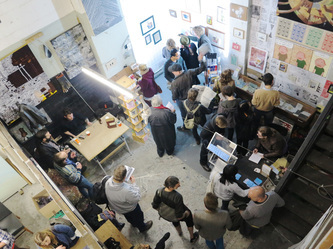 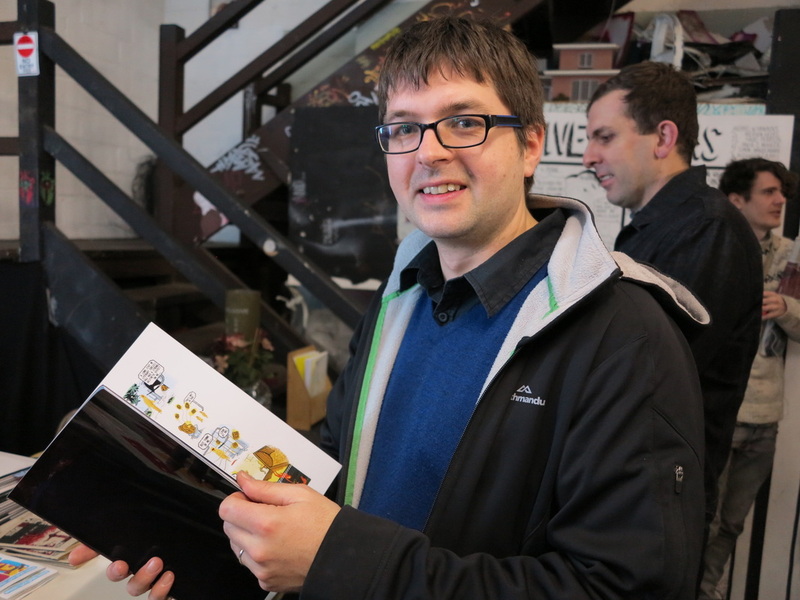 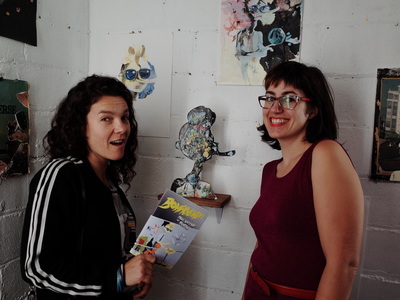 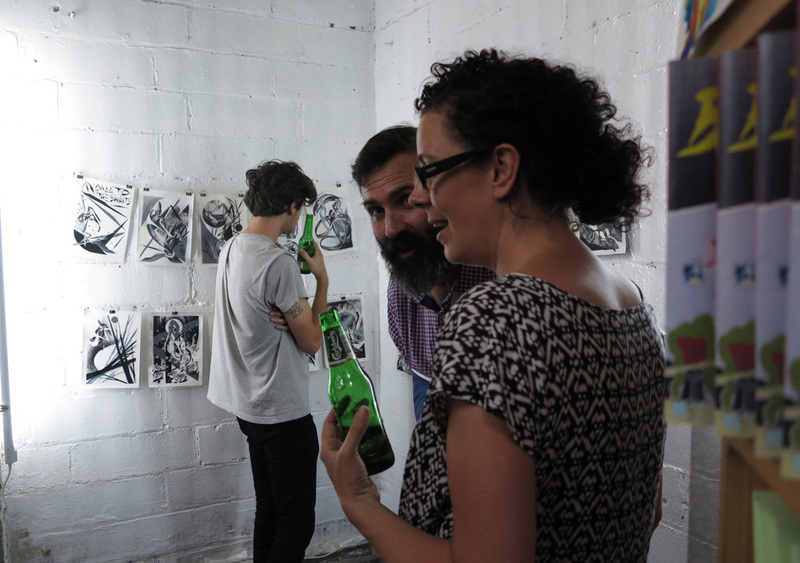 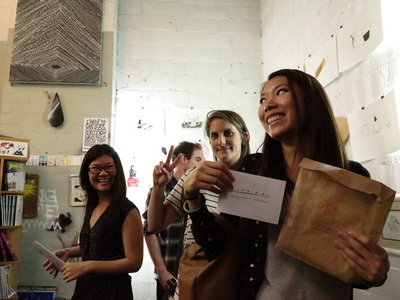 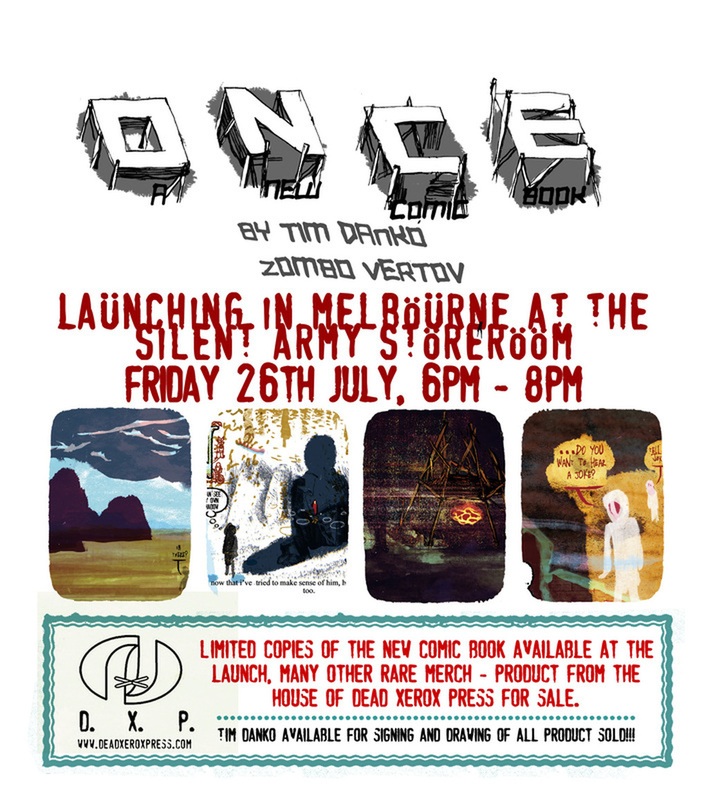 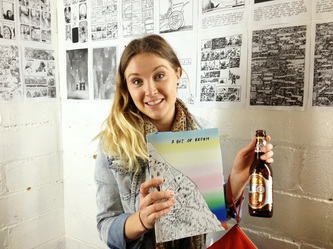 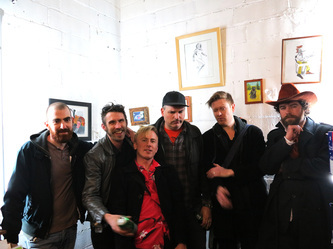 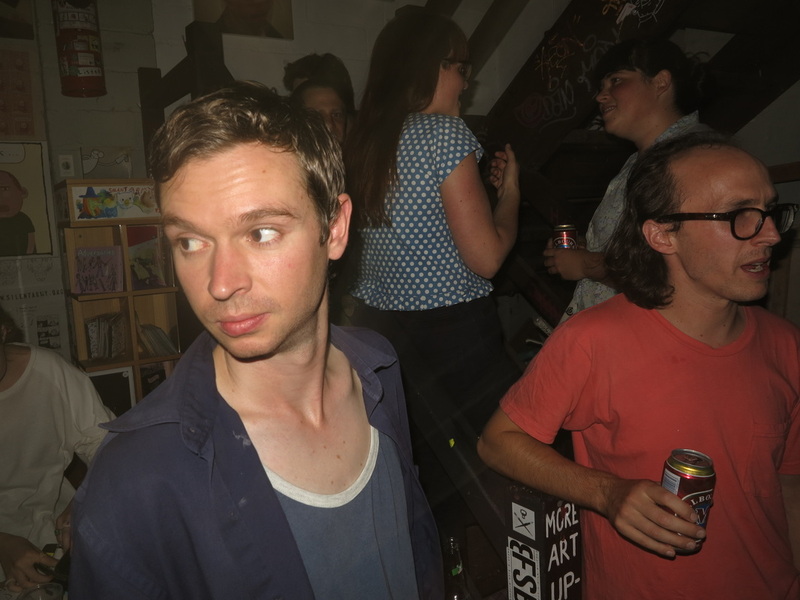 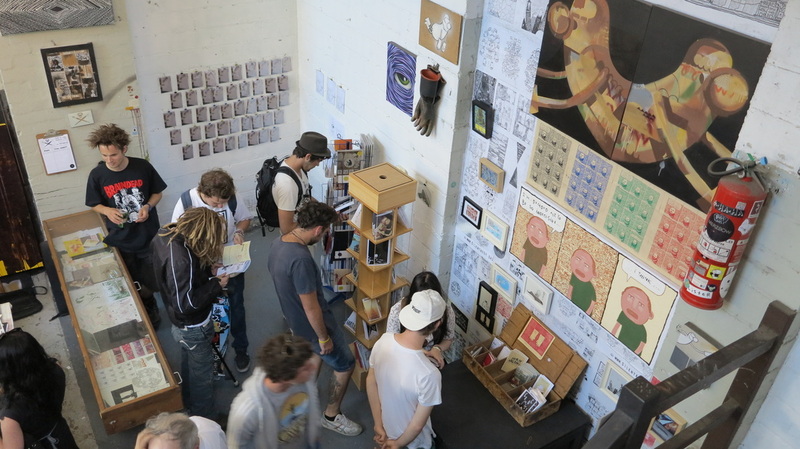 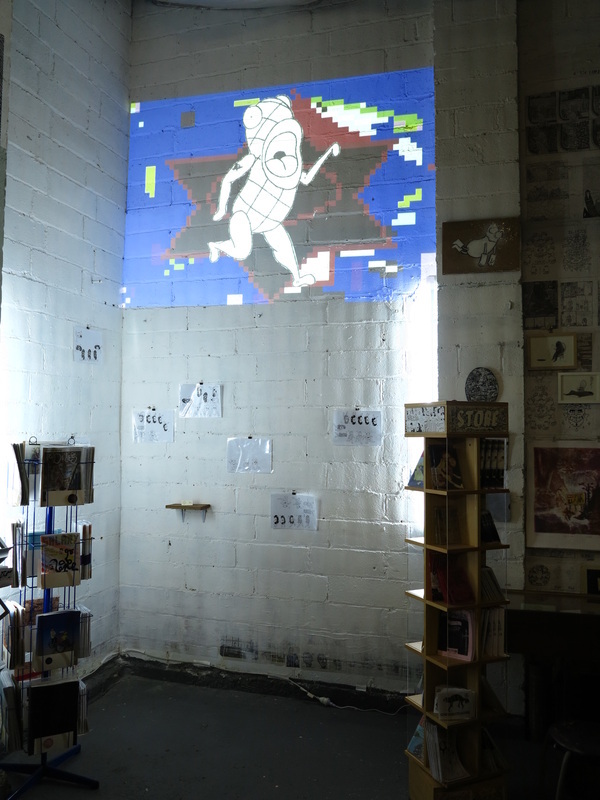 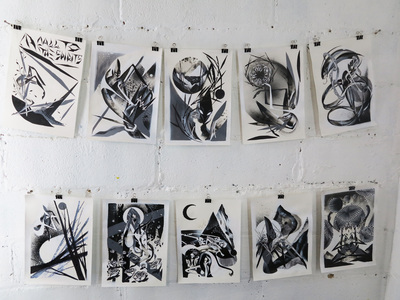 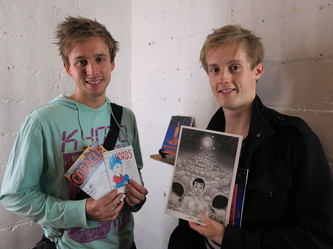 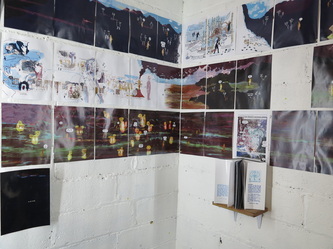 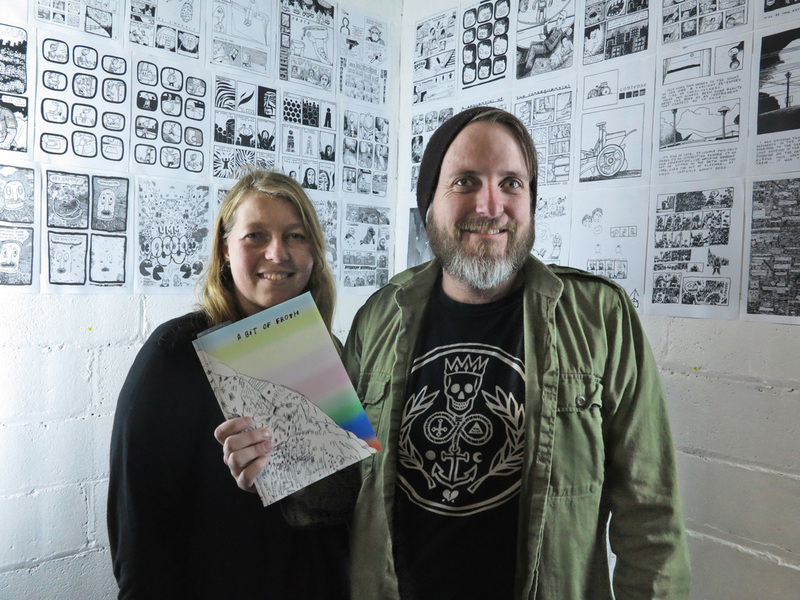 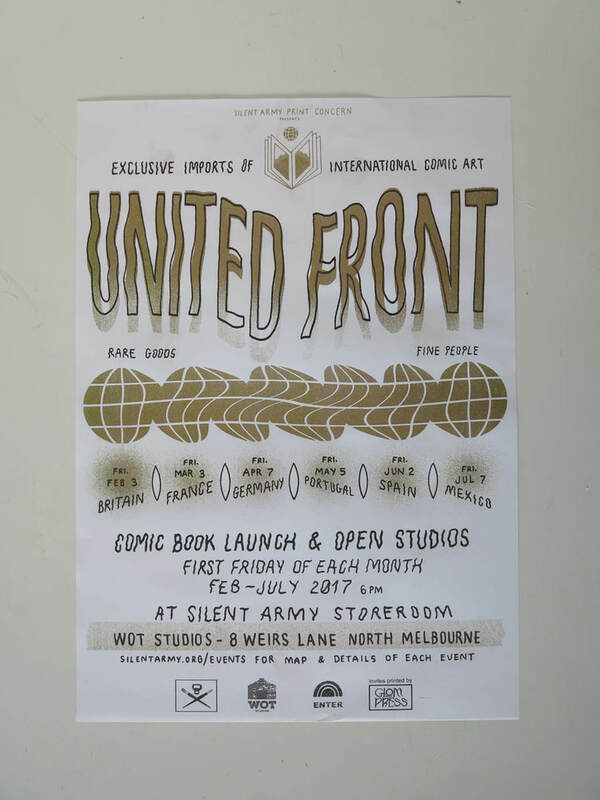 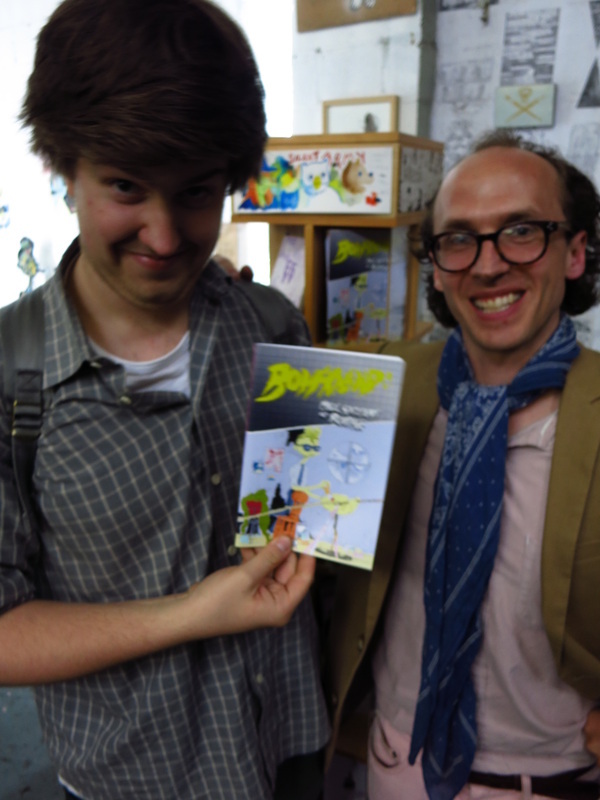 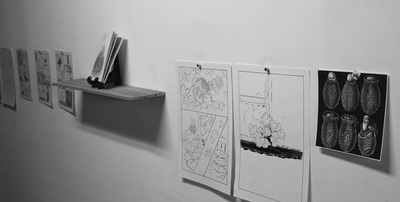 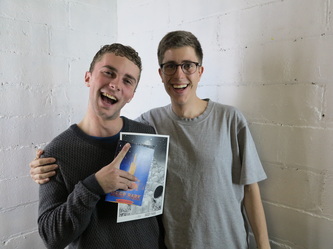 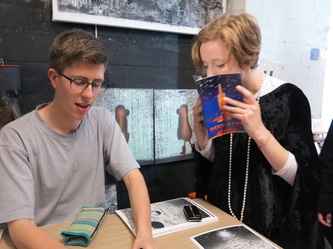 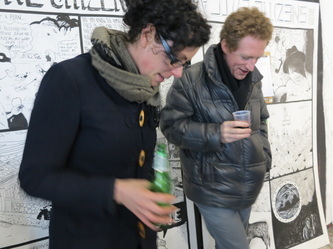 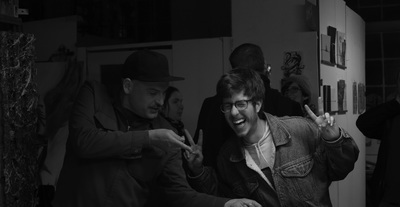 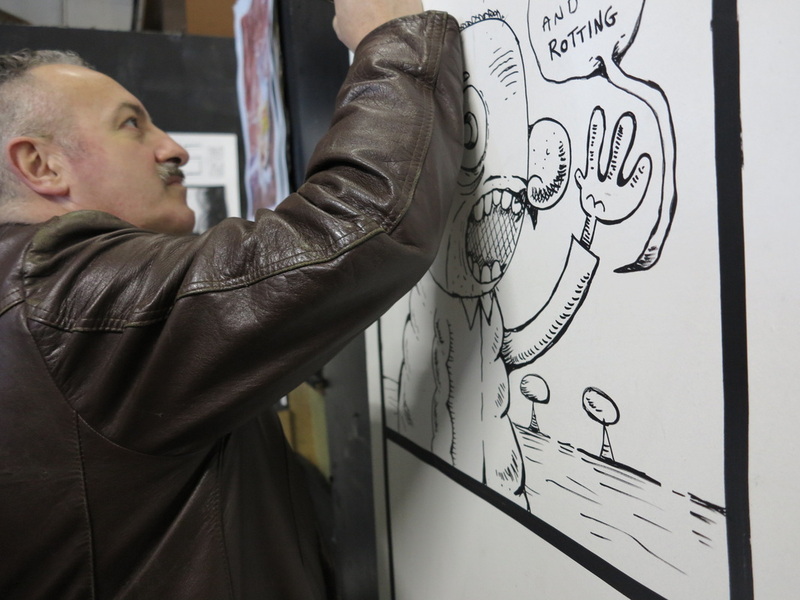 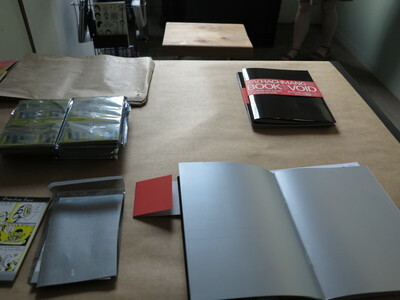 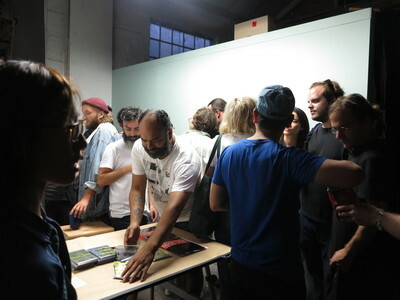 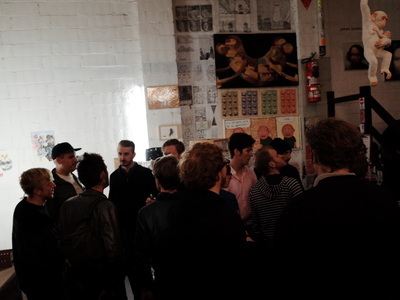 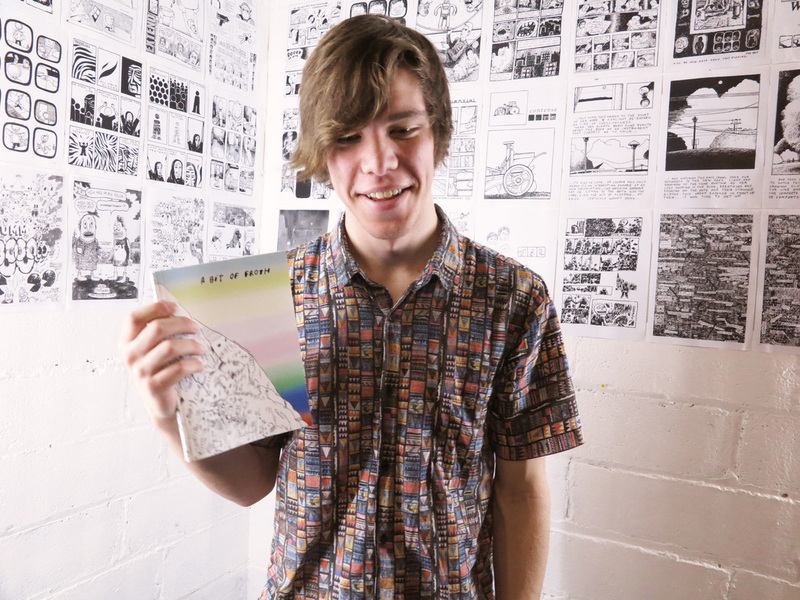 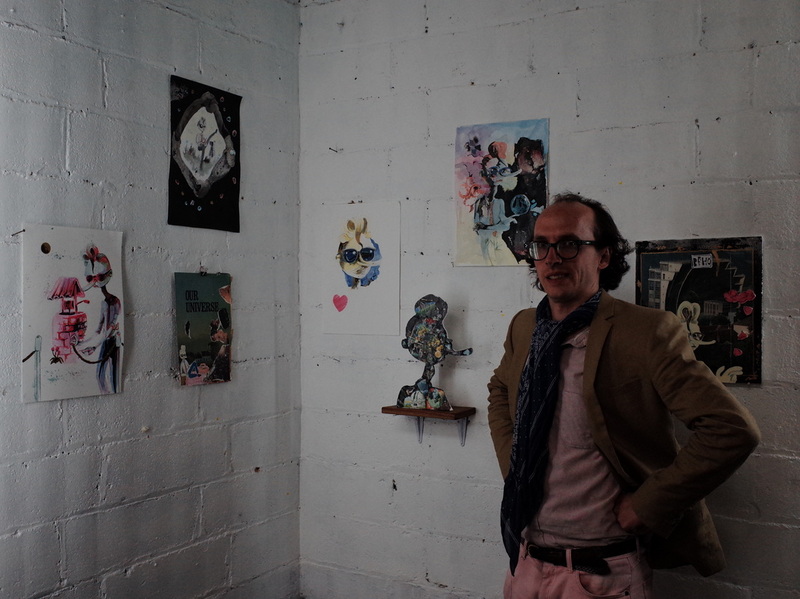 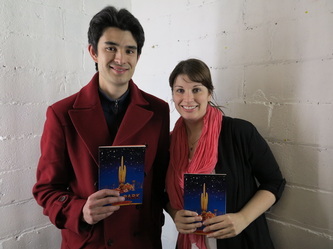 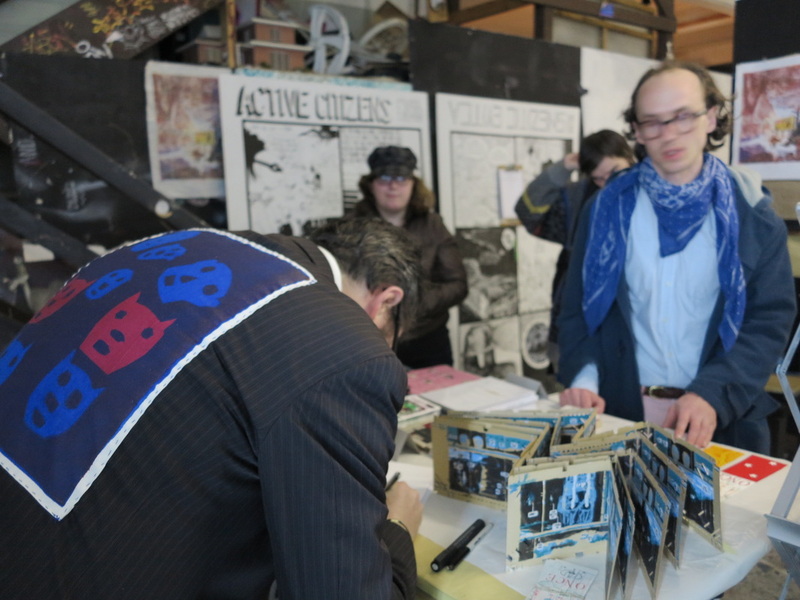 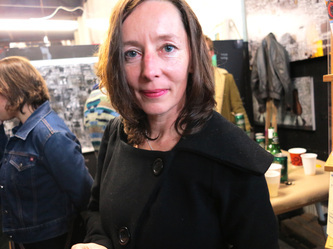 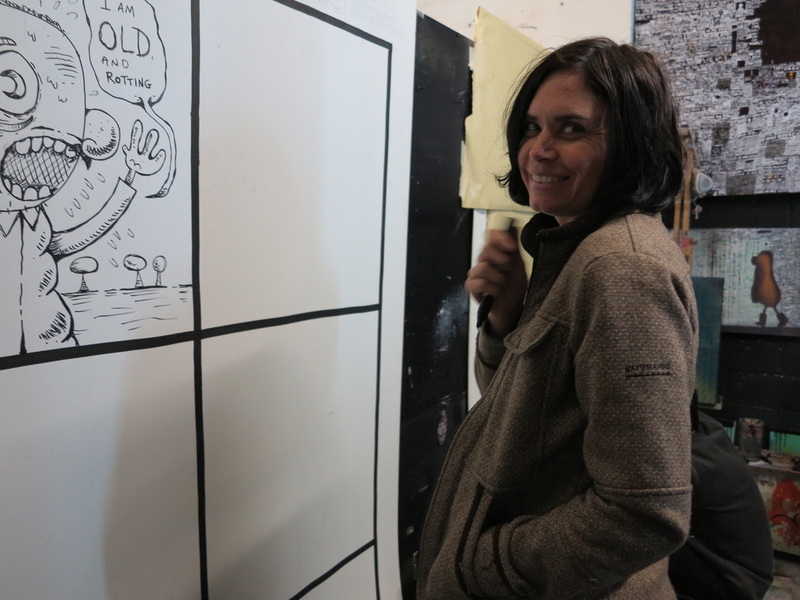 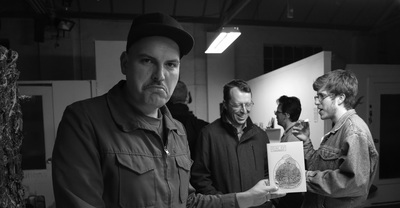 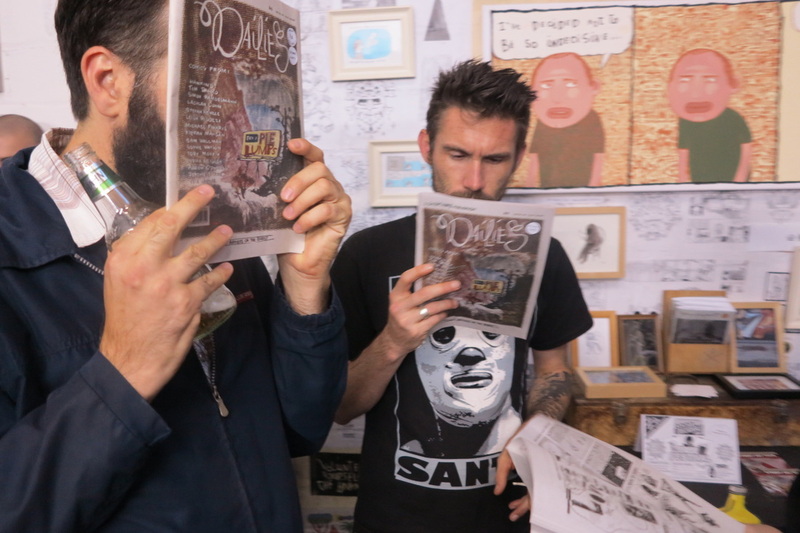 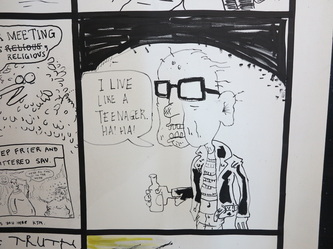 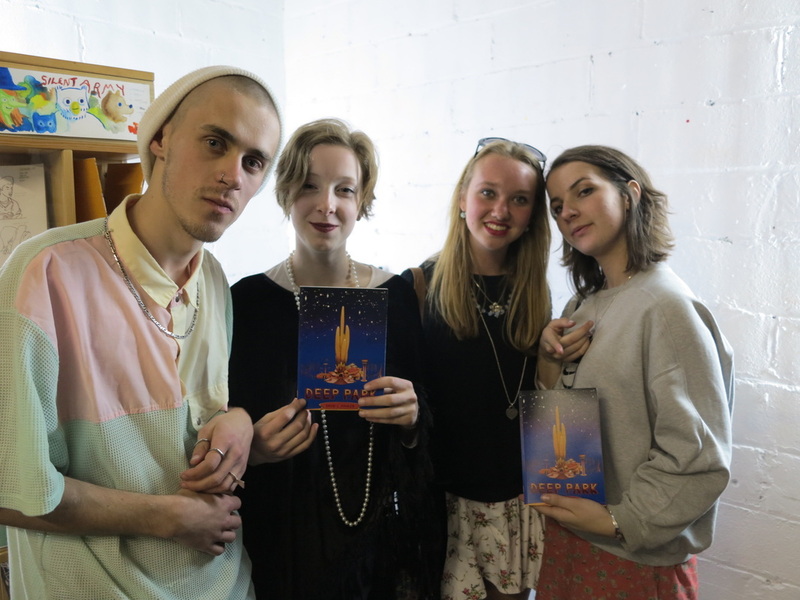 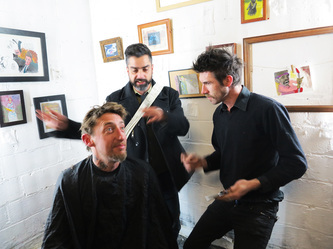 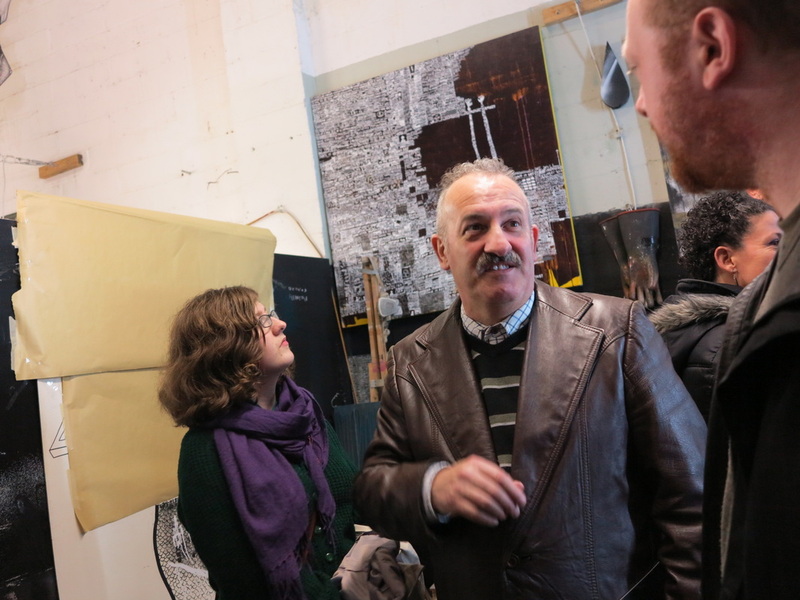 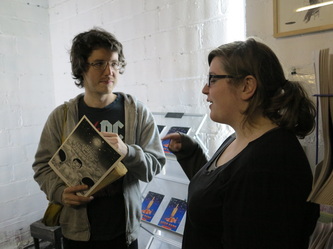 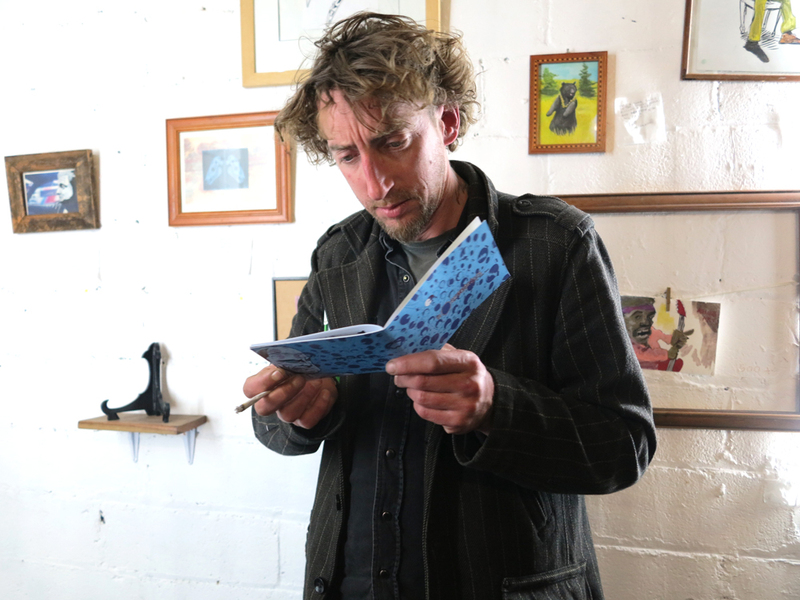 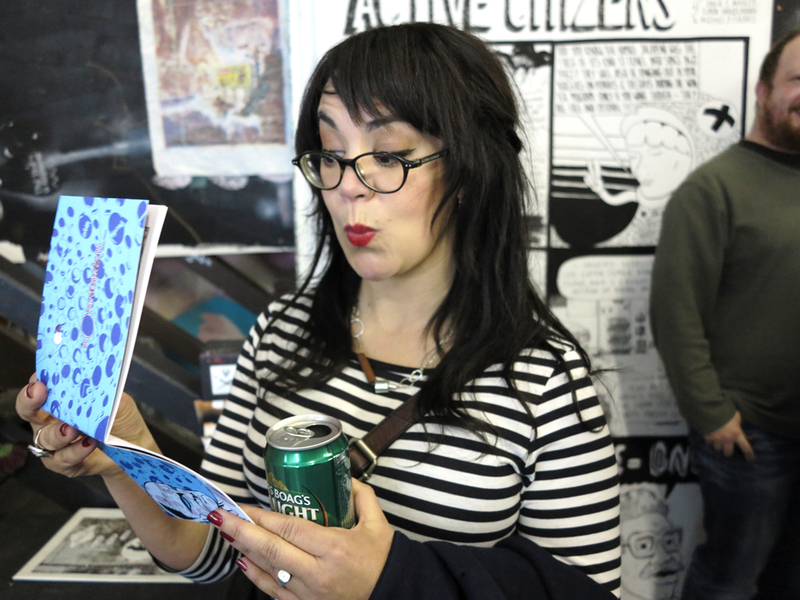 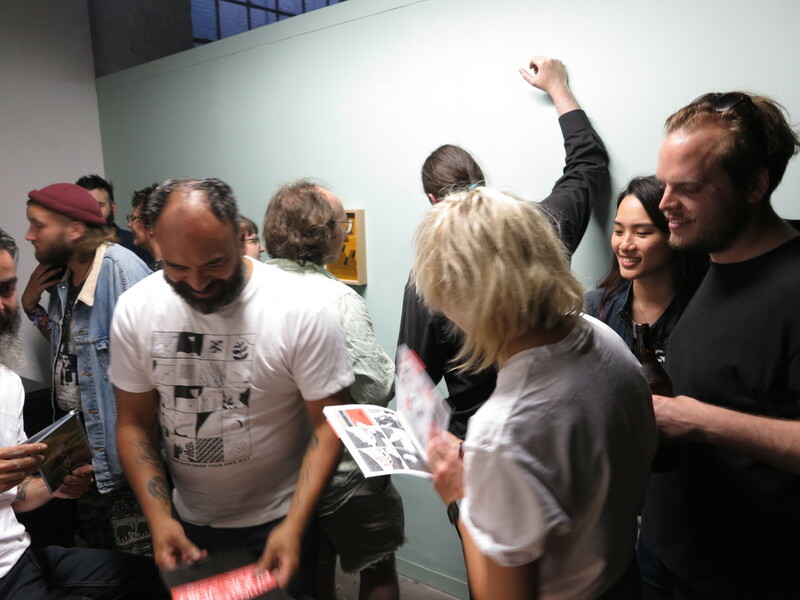 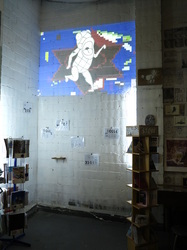 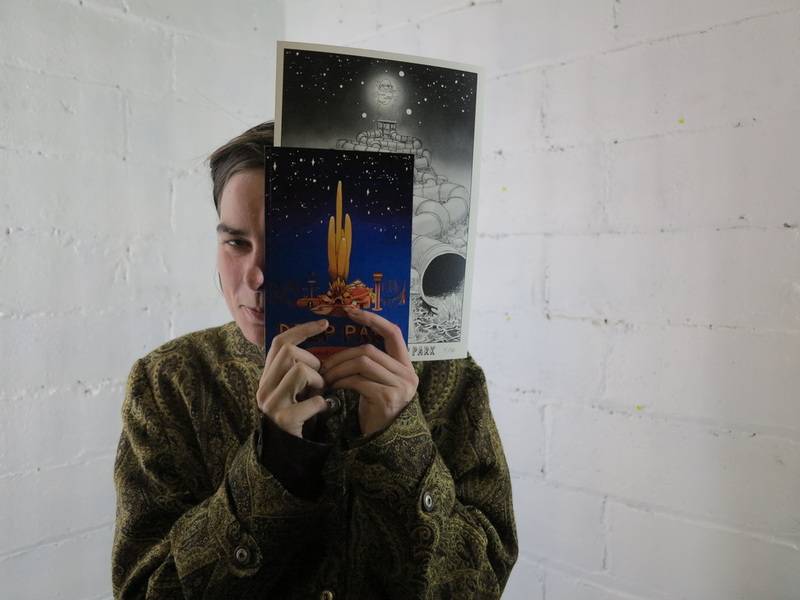 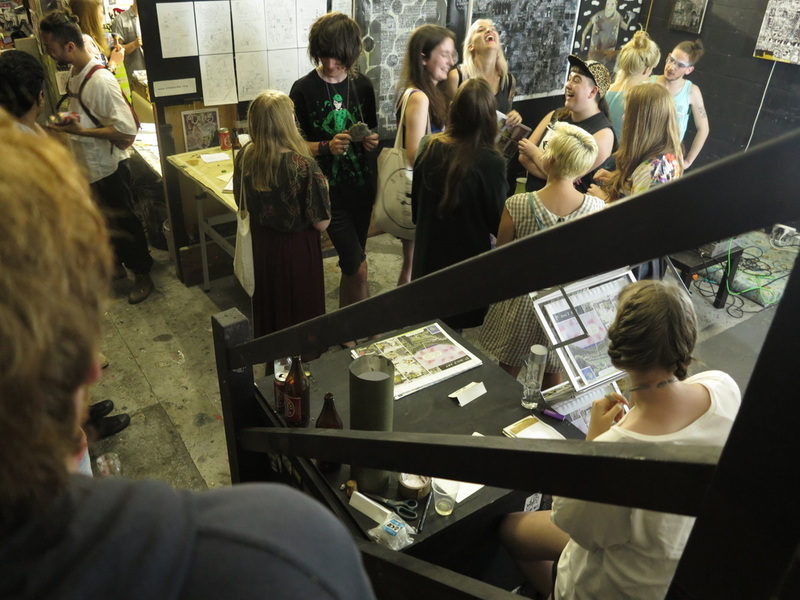 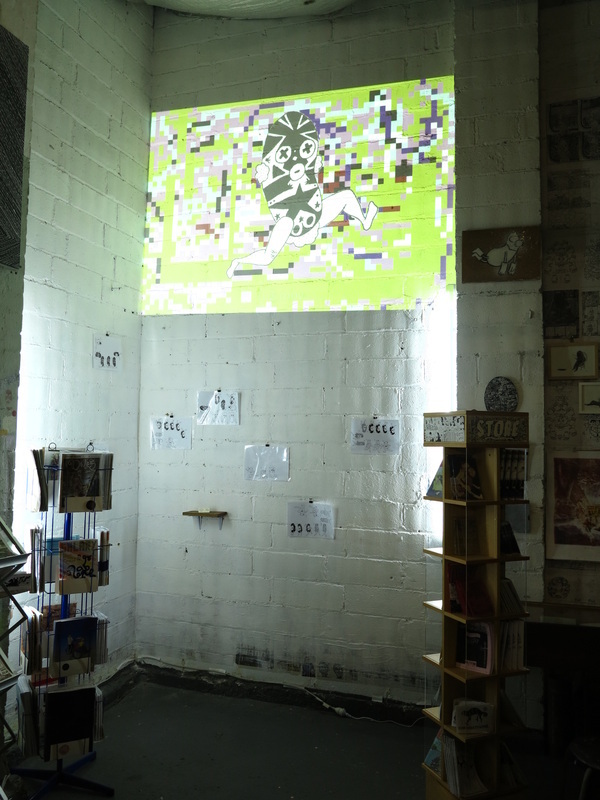 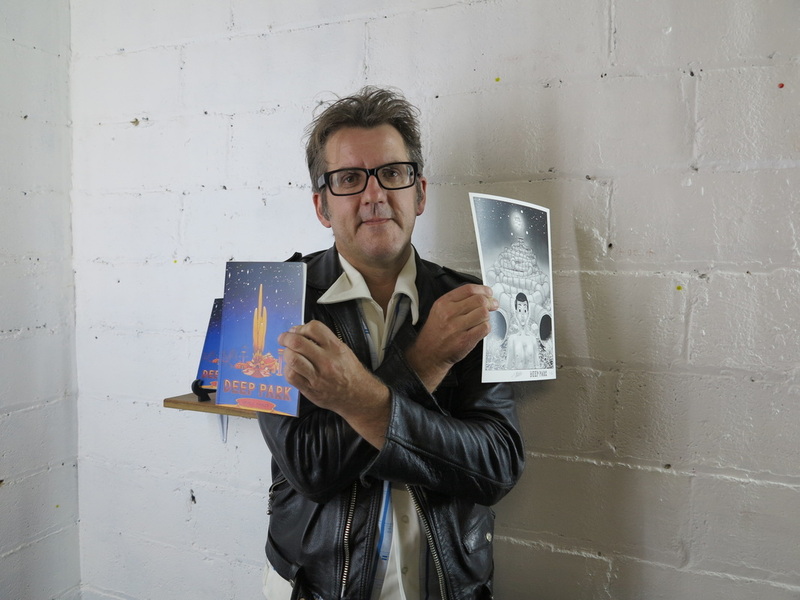 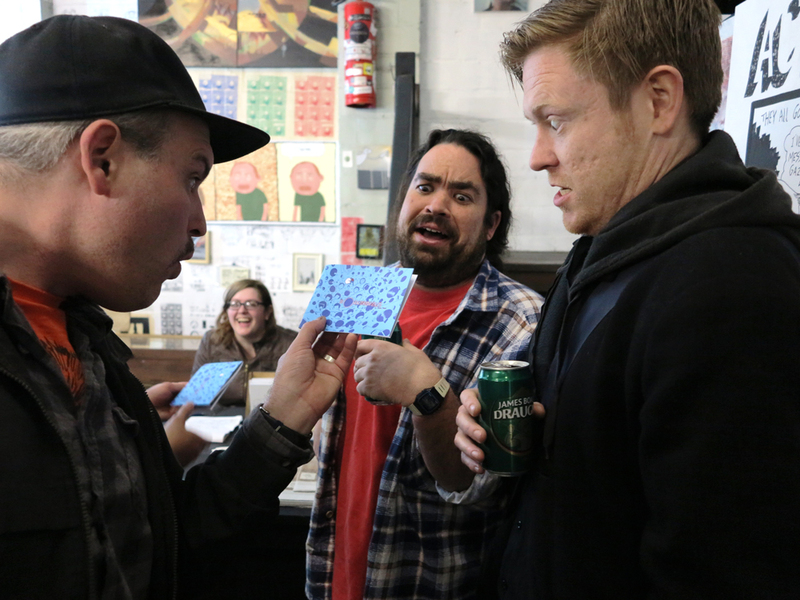 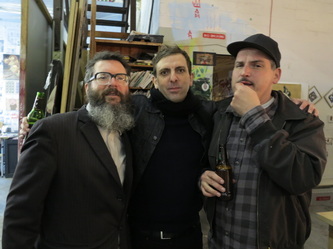 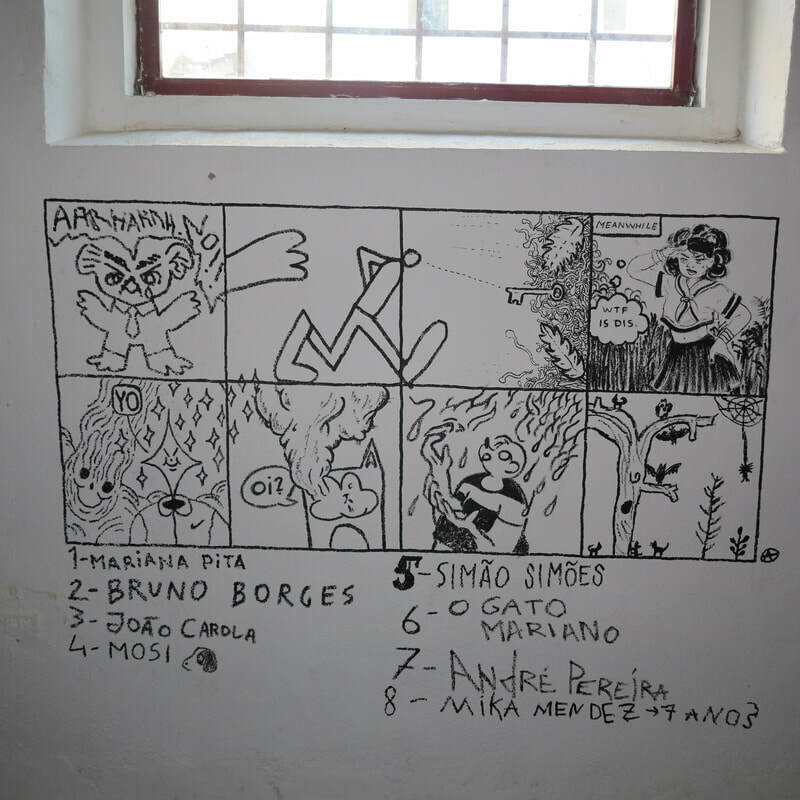 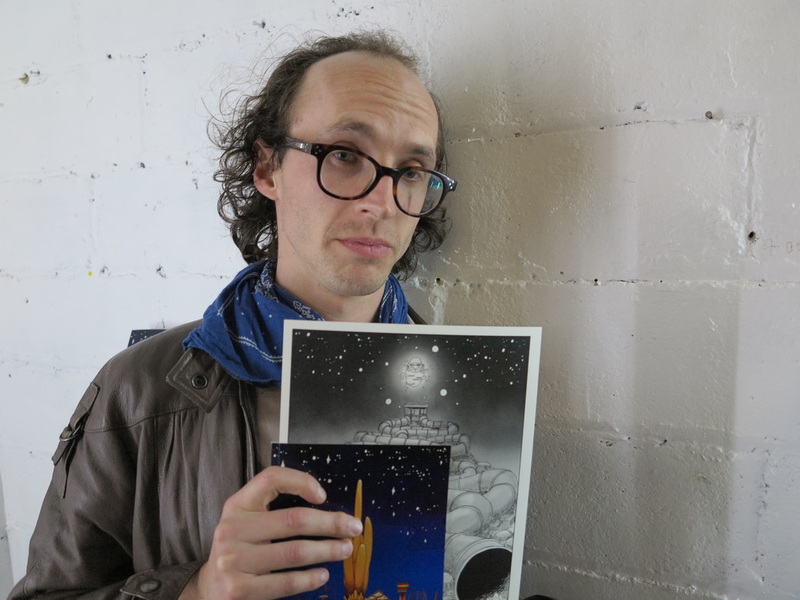 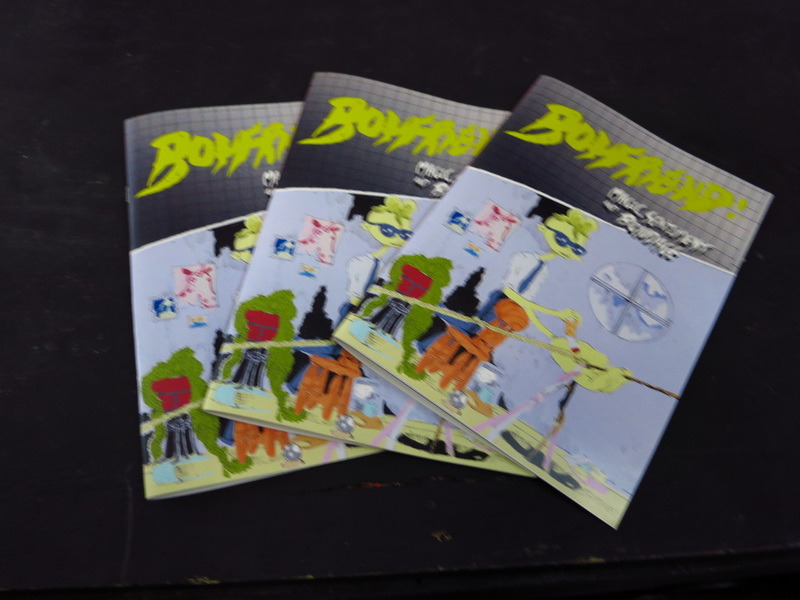 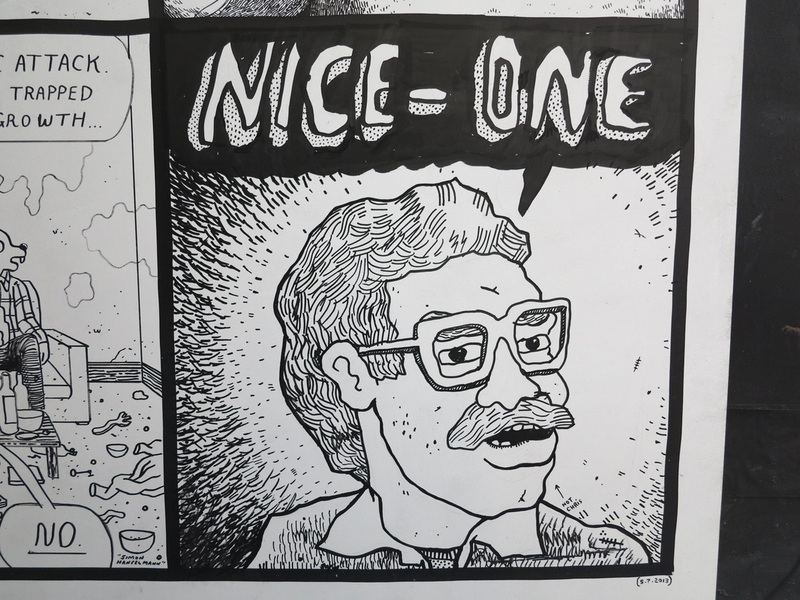 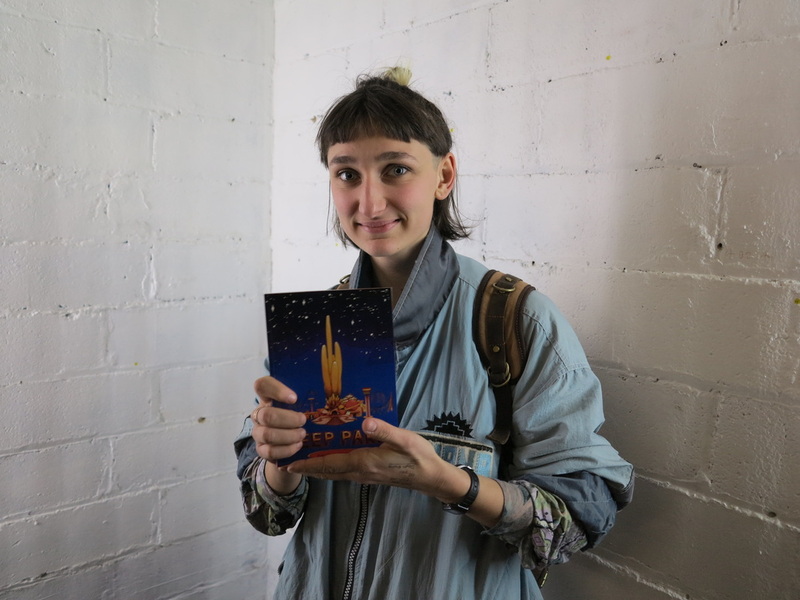 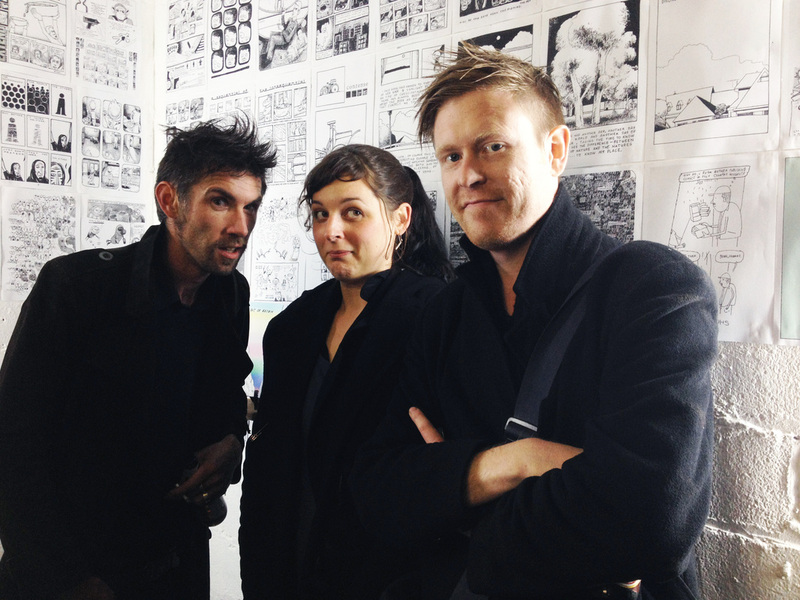 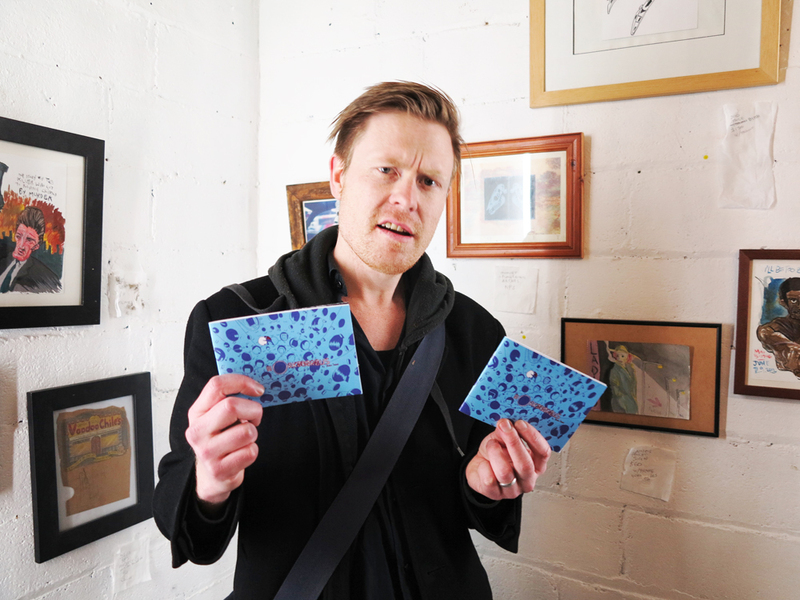 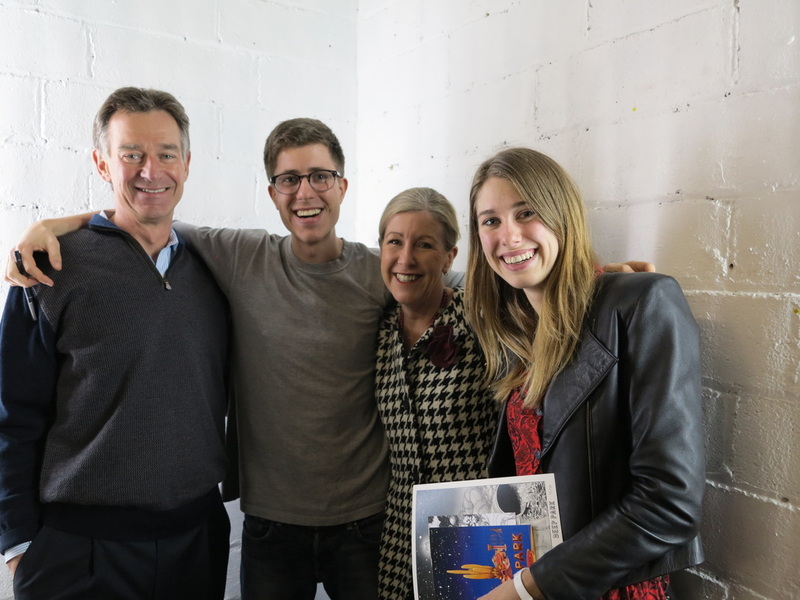 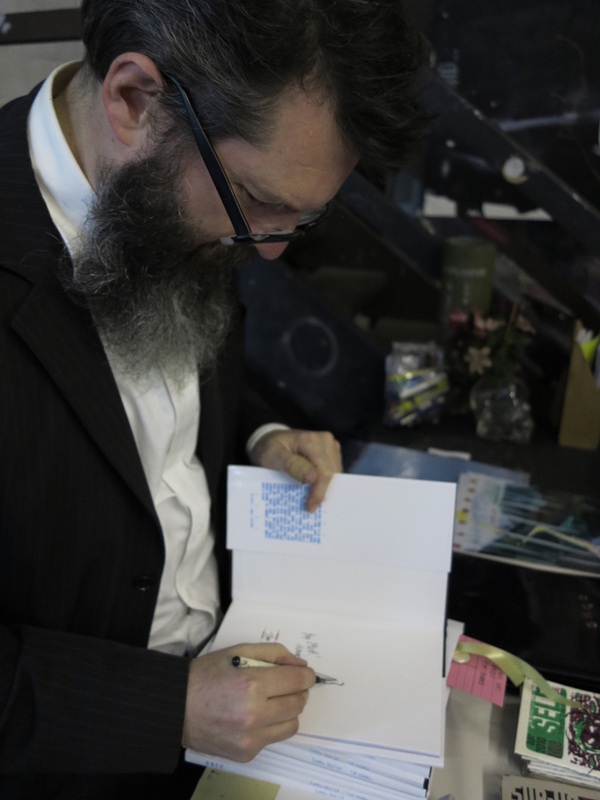 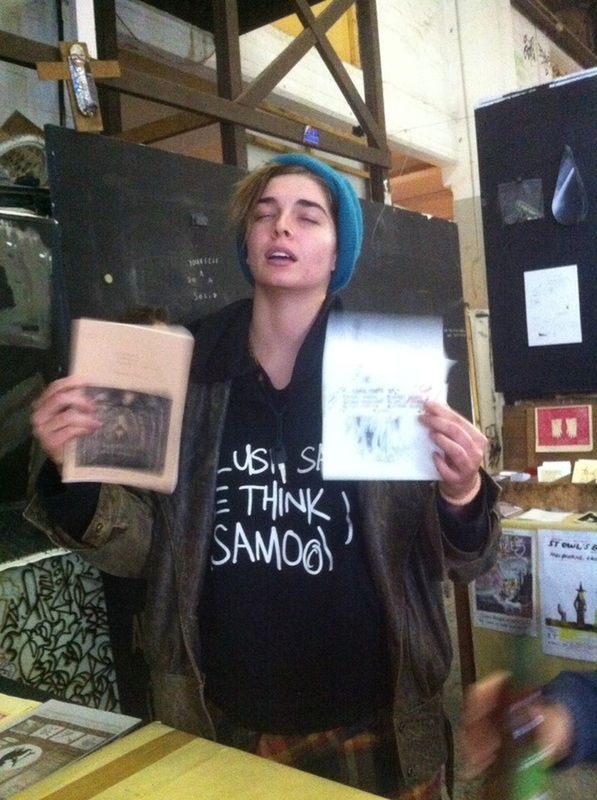 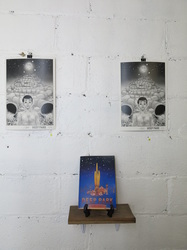 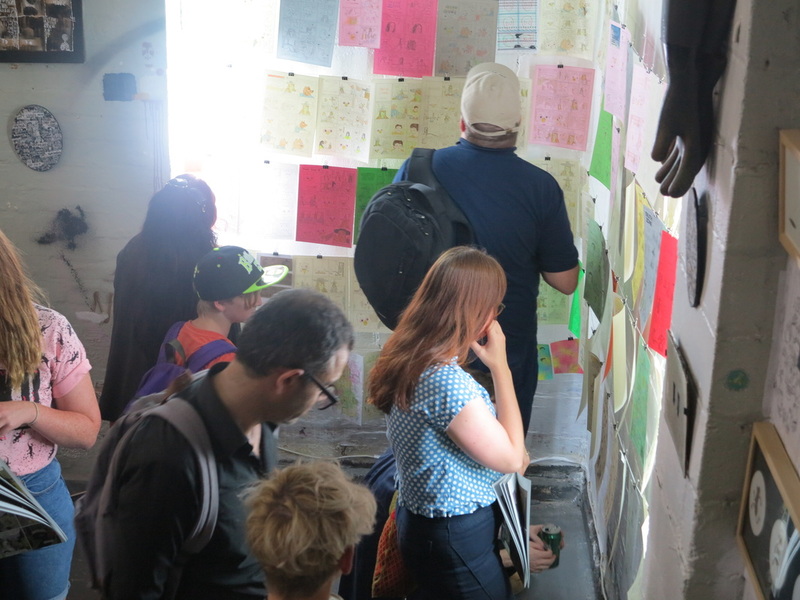 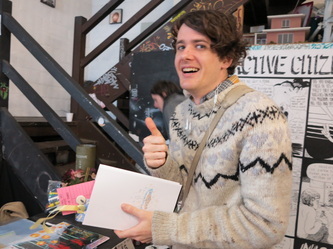 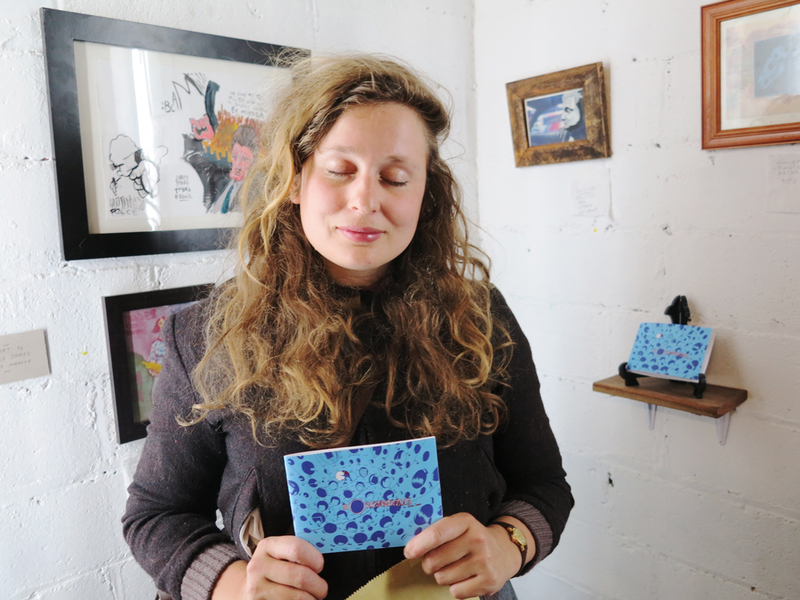 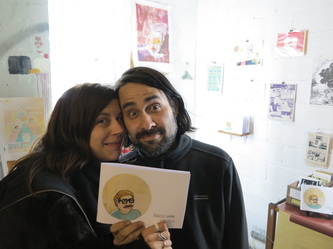 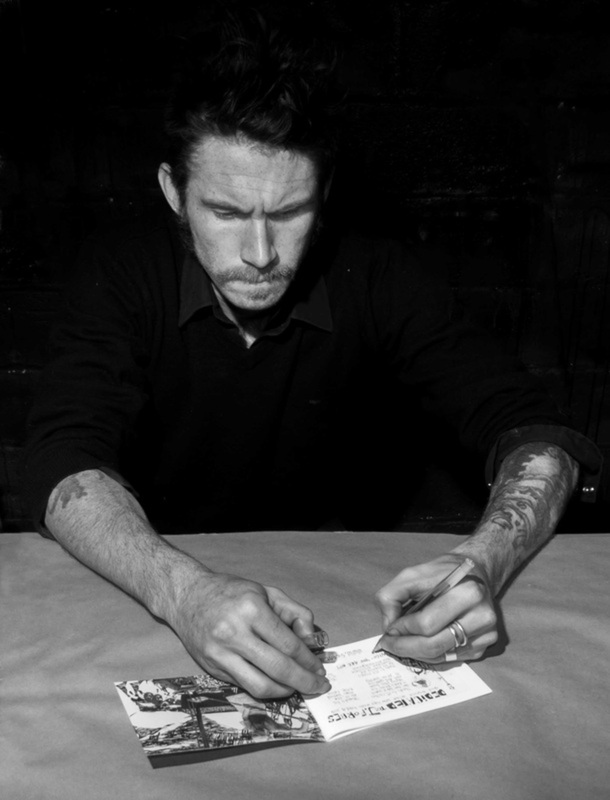 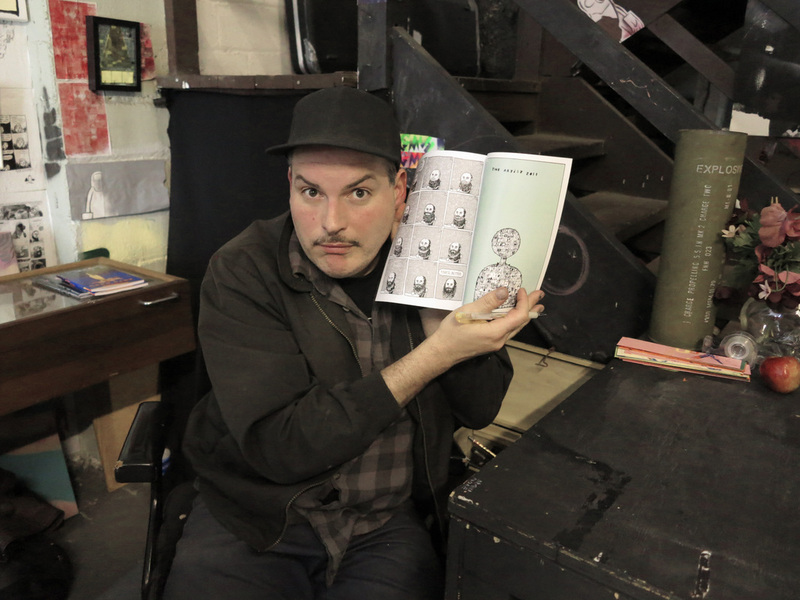 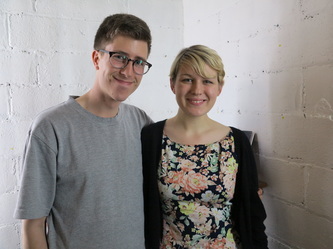 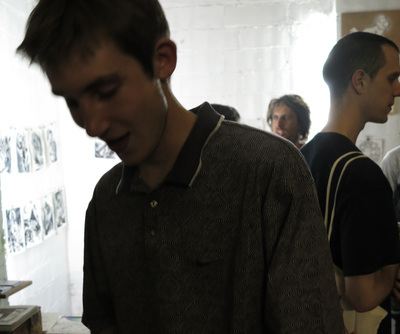 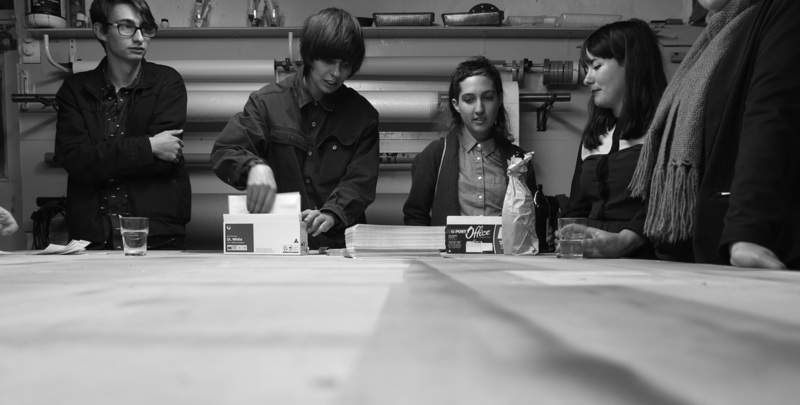 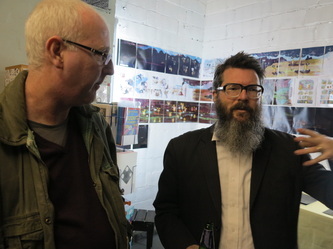 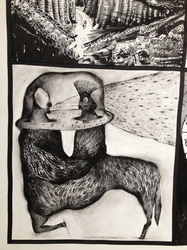 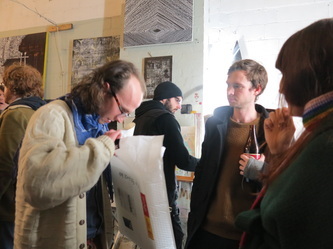 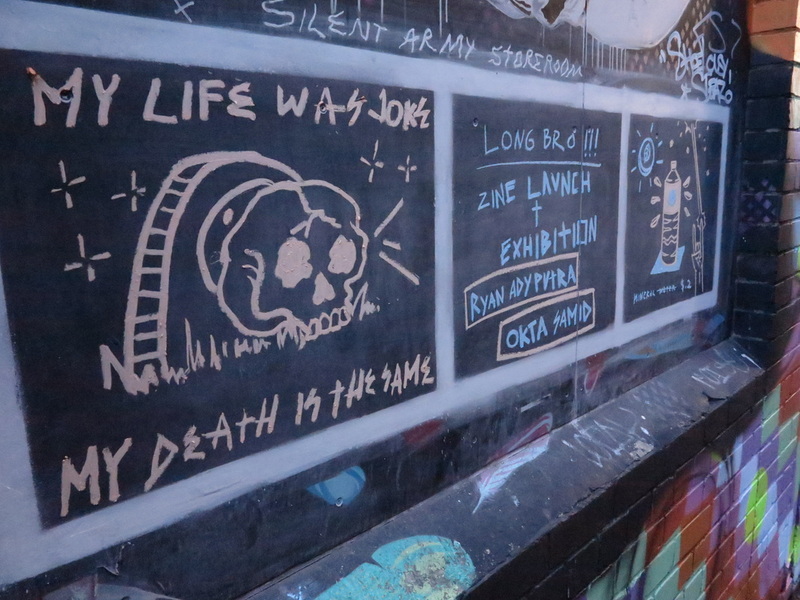 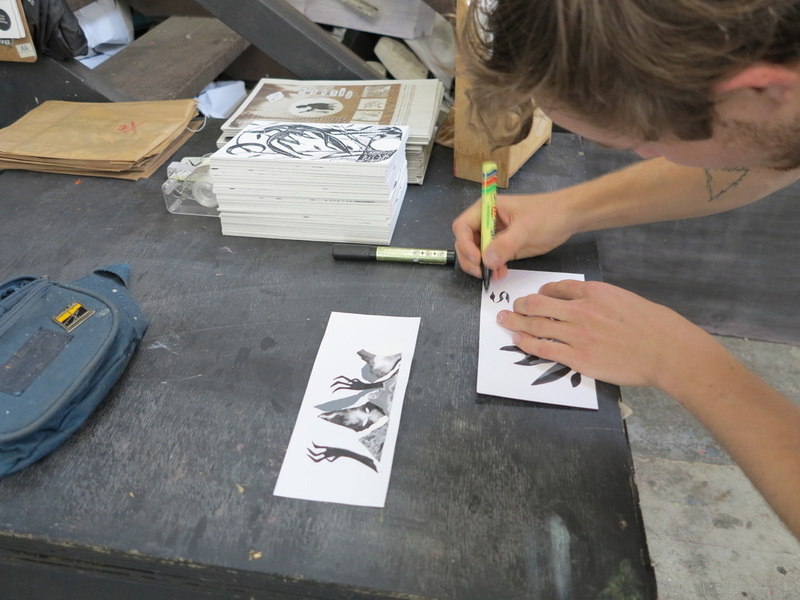 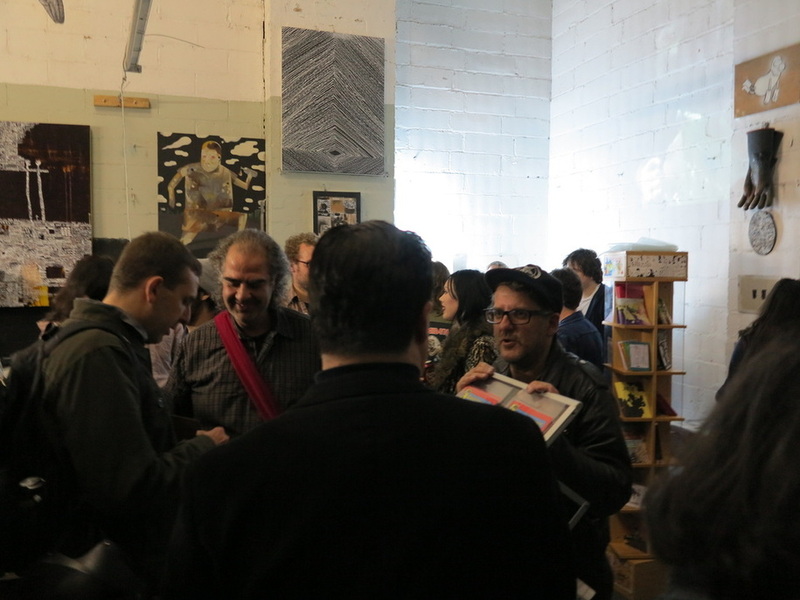 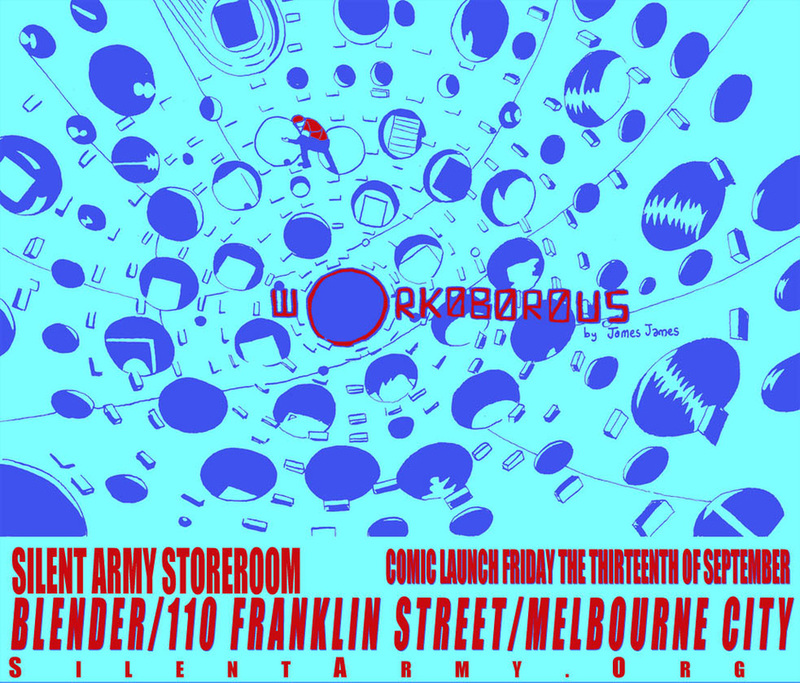 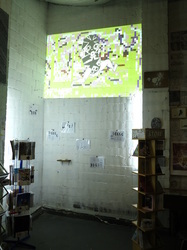 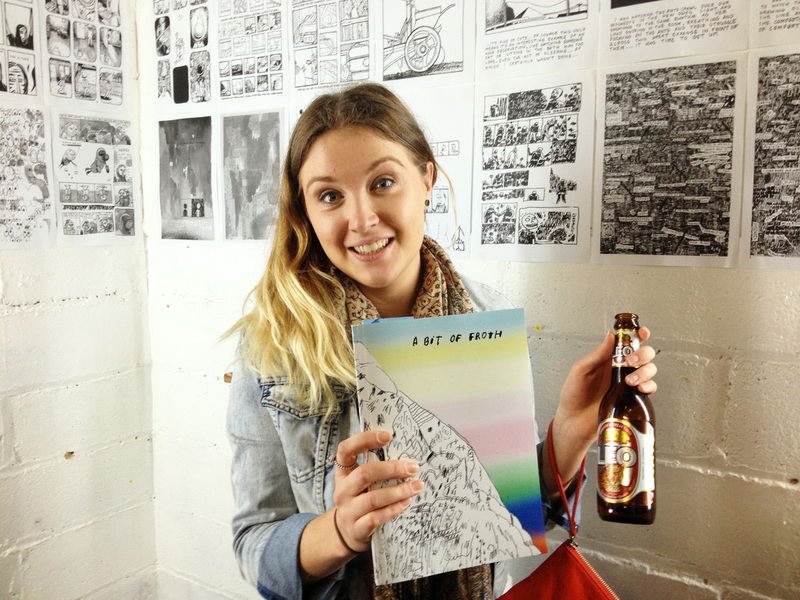 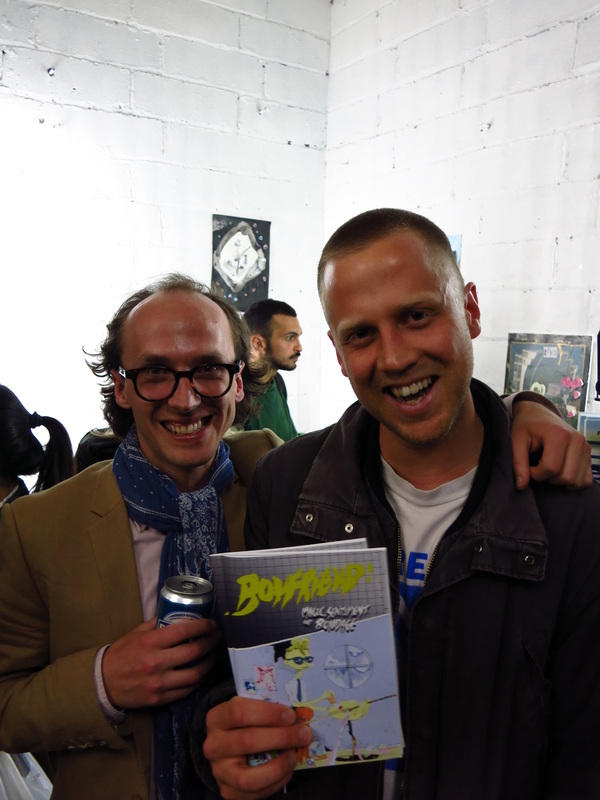 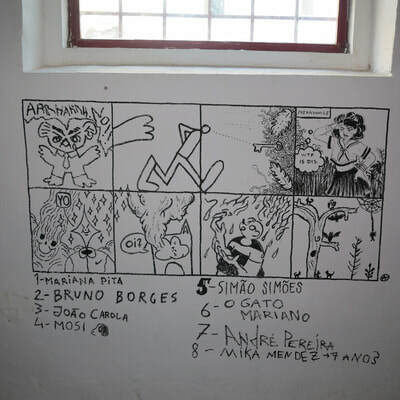 Photos above from 'Once' comic book launch at Silent Army Storeroom July 26th. 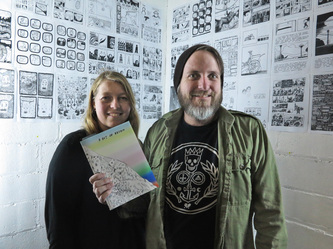 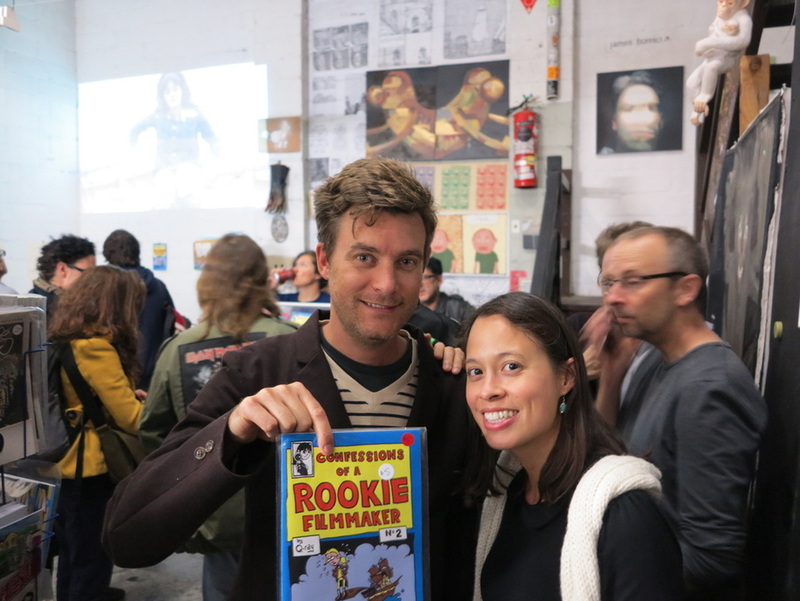 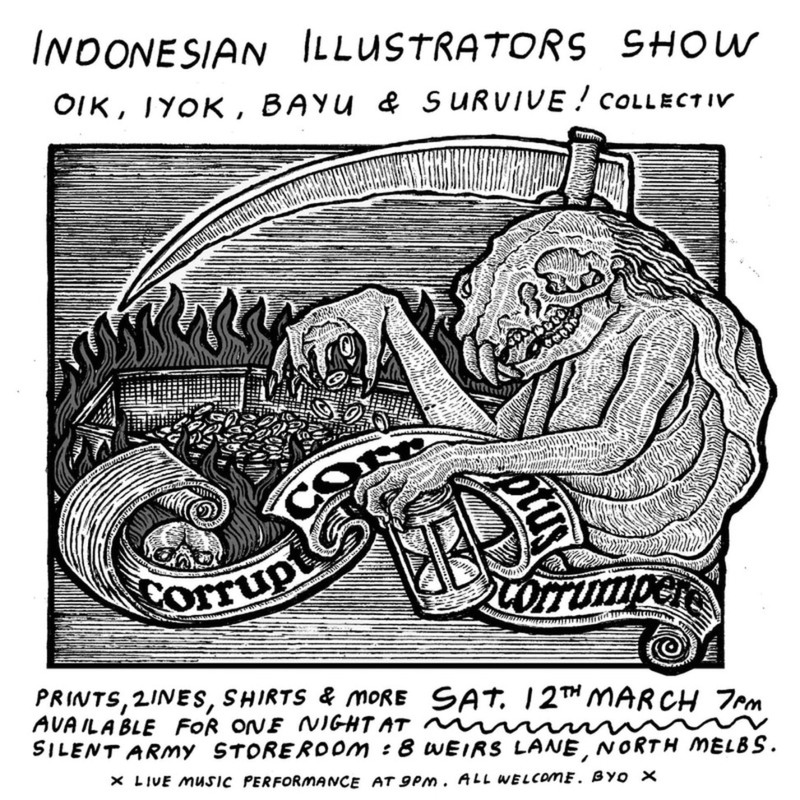 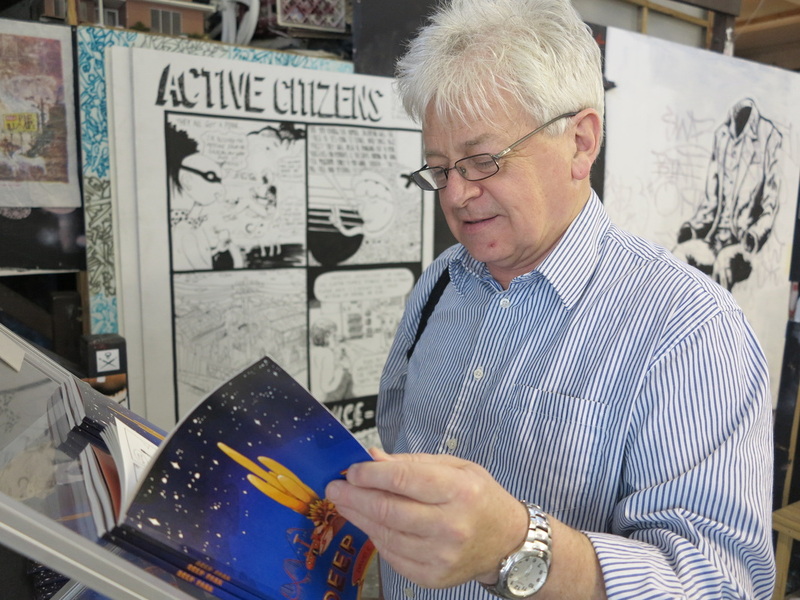 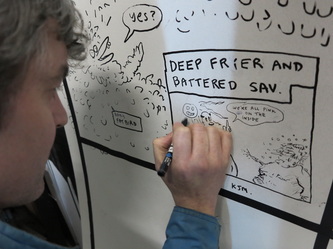 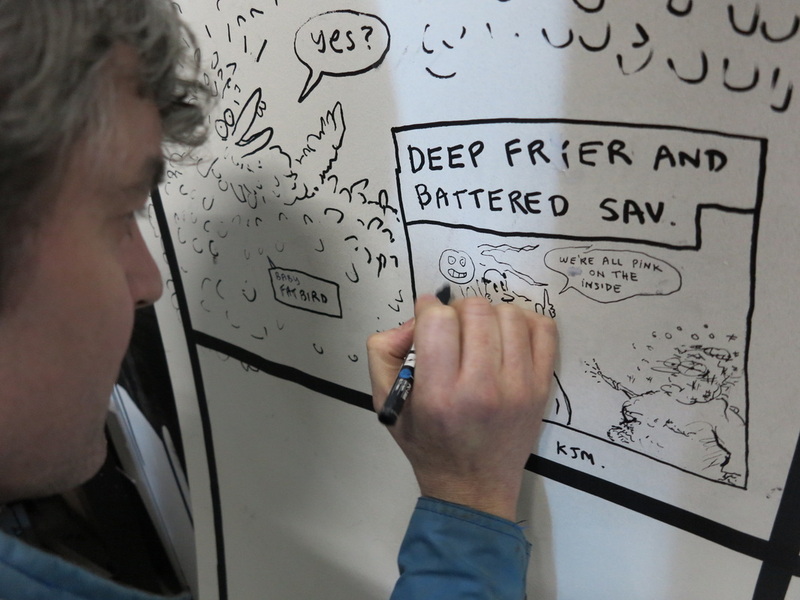 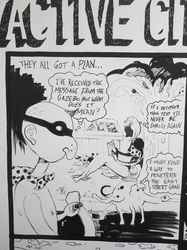 Another fine occassion with the last installment of the Giant Wooden Comic Book drawn live for the people who came throughout the night to meet Tim Danko, snap up his fine 58 page colour comic. 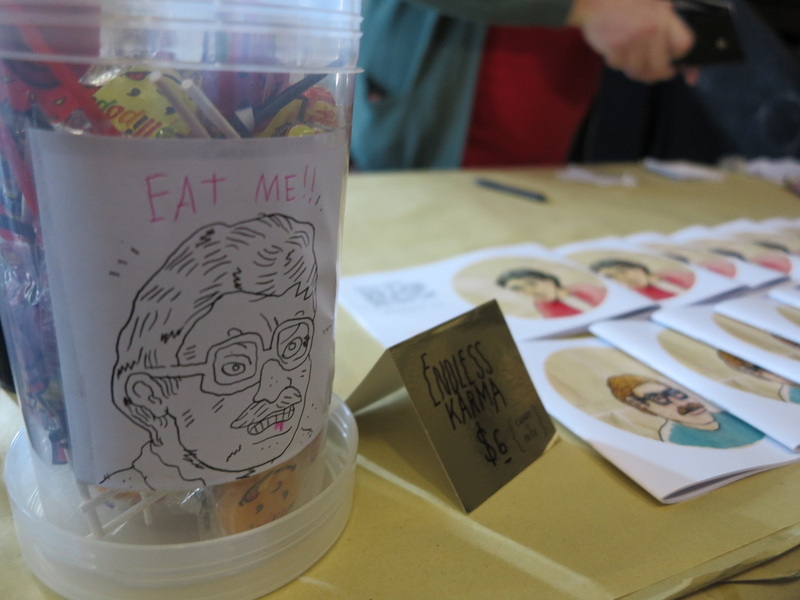 Listen up you little freaks ! 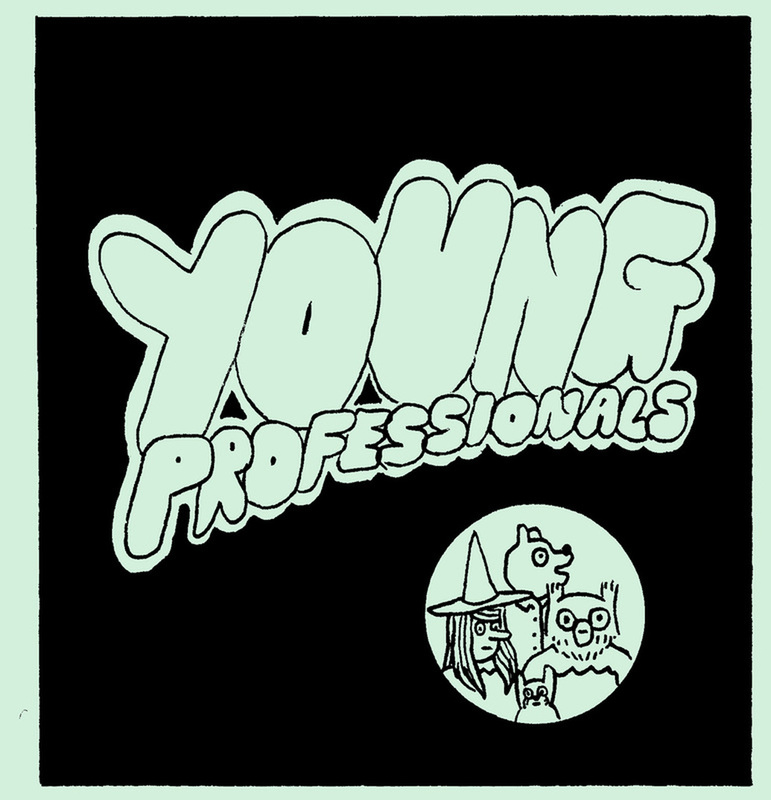 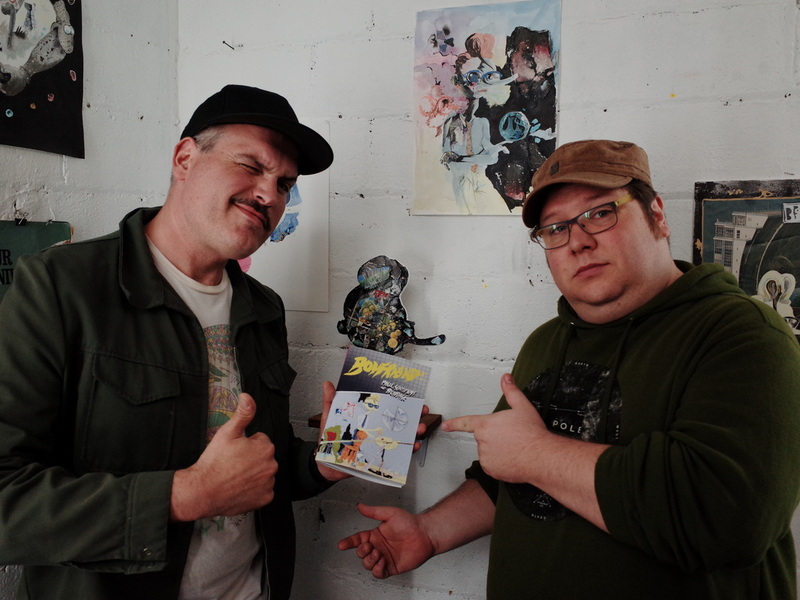 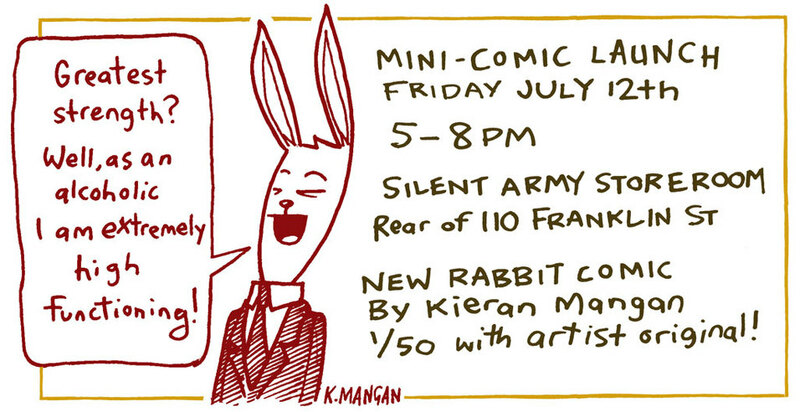 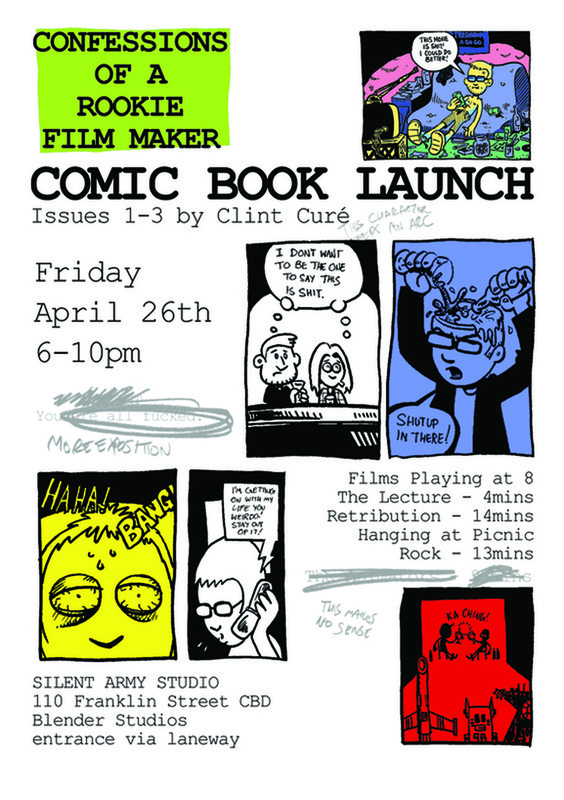 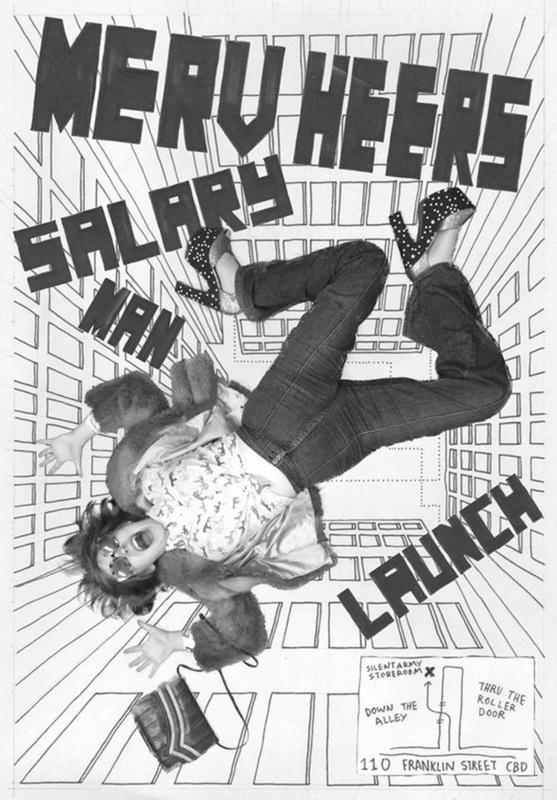 Wednesday May 29th at 6pm Merv Heers will be launching ONE full size salary man comic as well as an attention seeking SEVEN mini comics ! 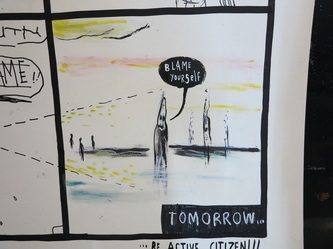 That's right ma'am. The big kahuna. 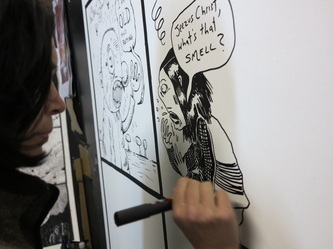 Outta sight ! 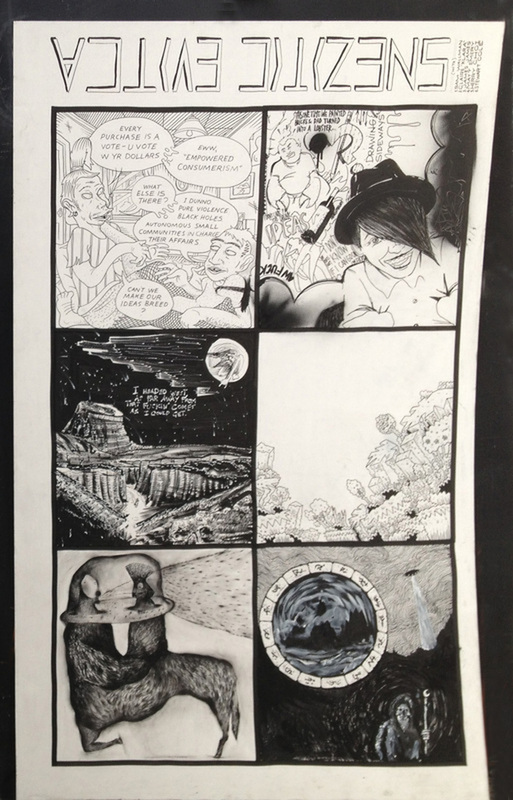 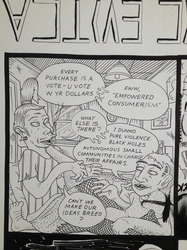 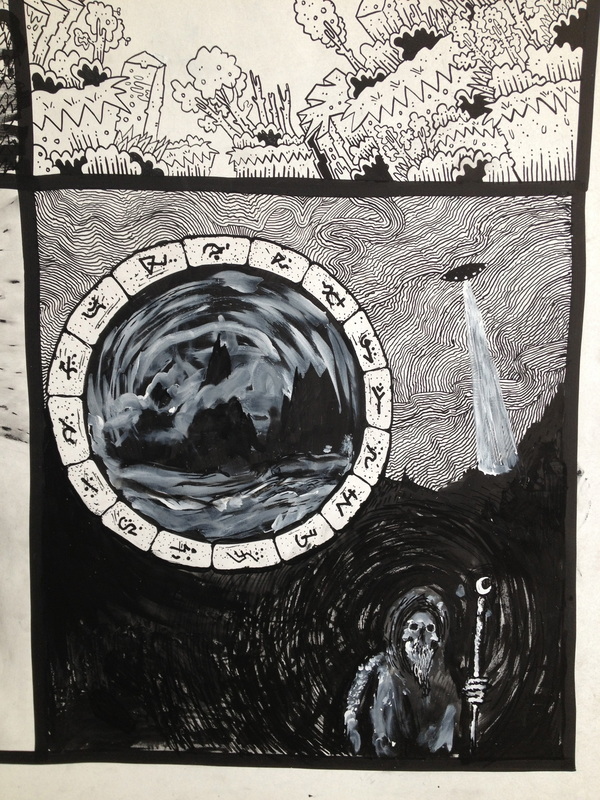 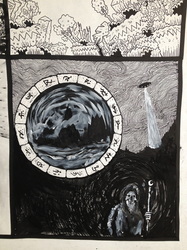 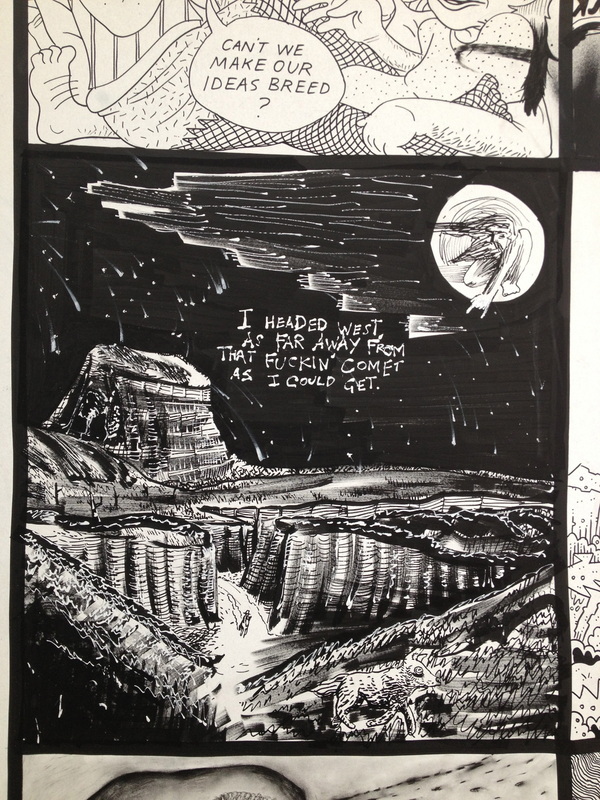 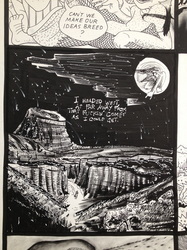 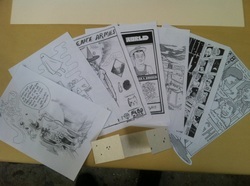 PRINT SET of 6 NEW comic art pages put together by Merv Heers. 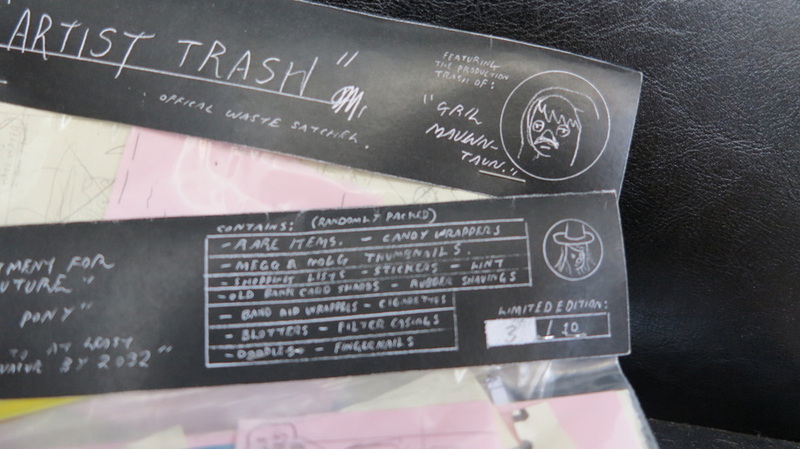 A copy of Dailies 1 and lil bits. 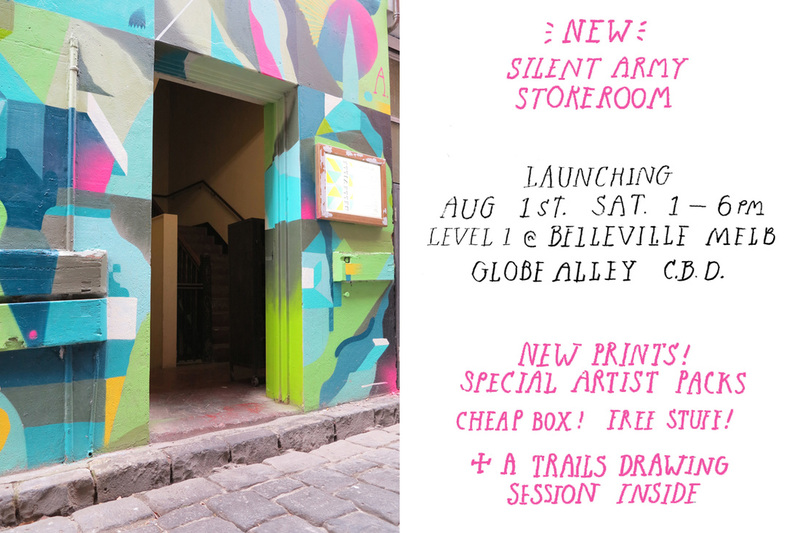 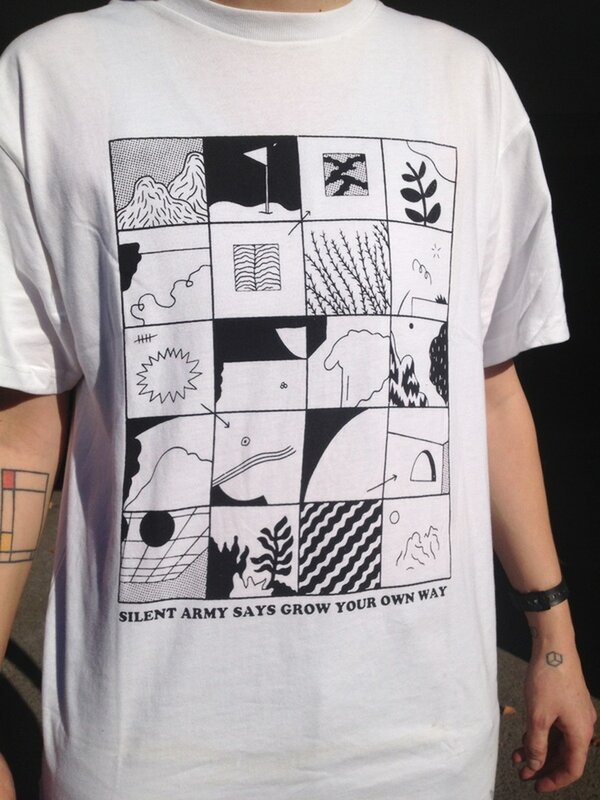 Silent Army Storeroom / Rear of 110 Franklin st. Melbourne CBD Open 12 - 8pm. 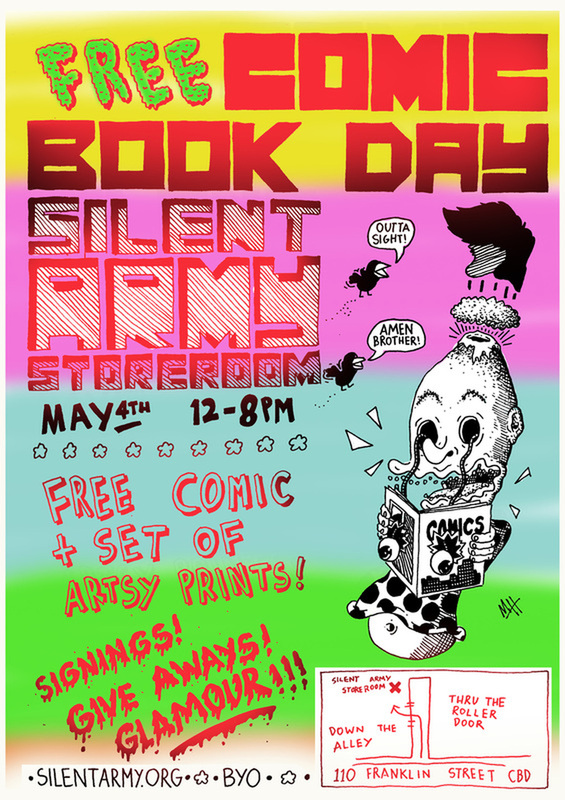 There was free stuff all day on May 4th with signings and print packs, a new Anthology and more with a light in the corner. 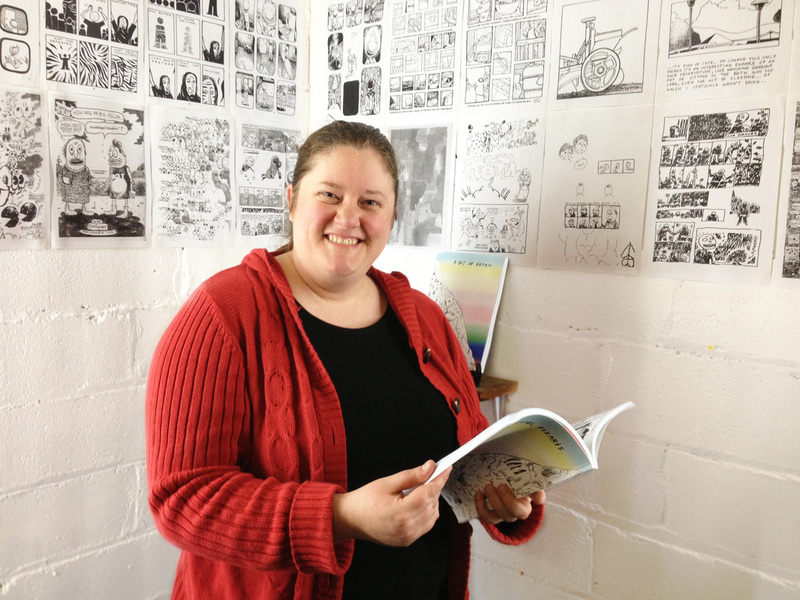 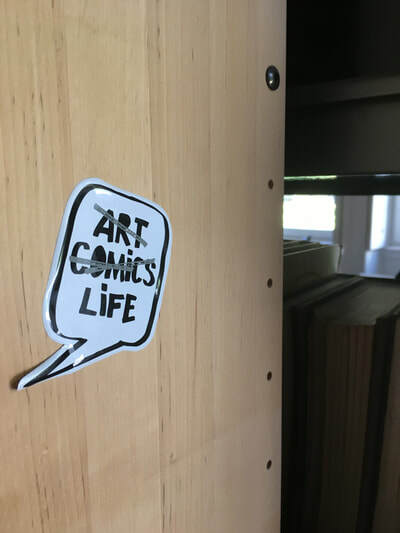 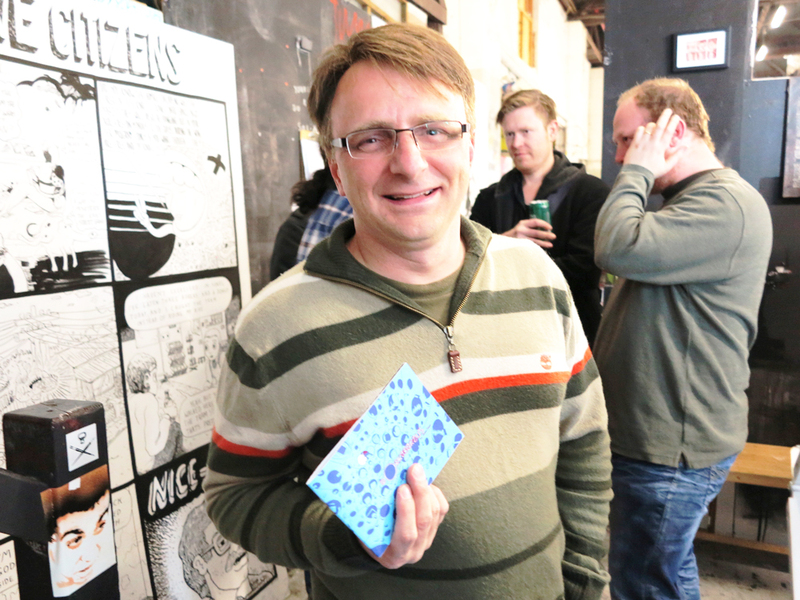 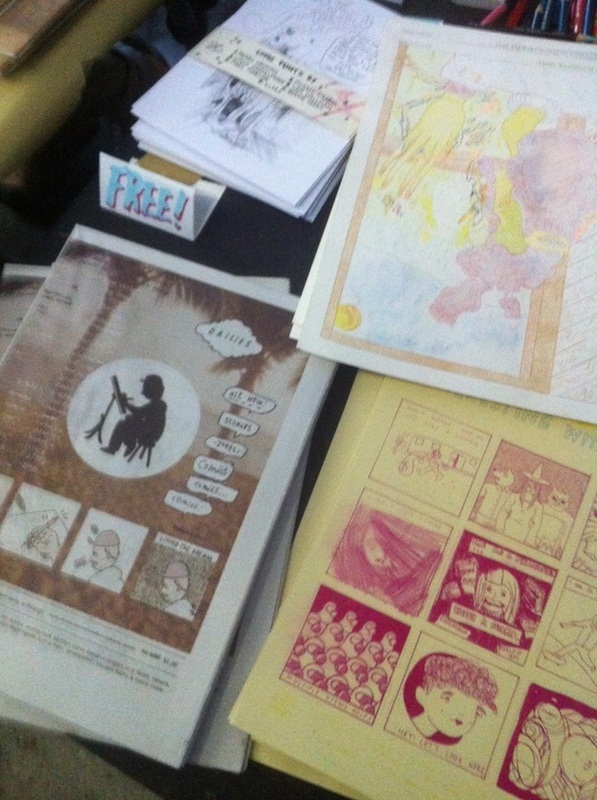 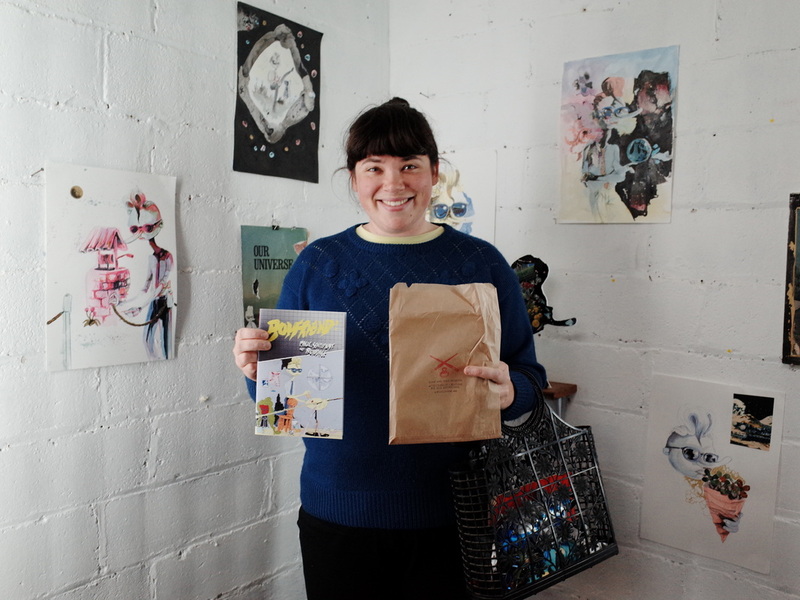 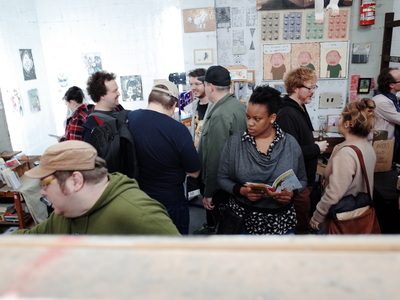 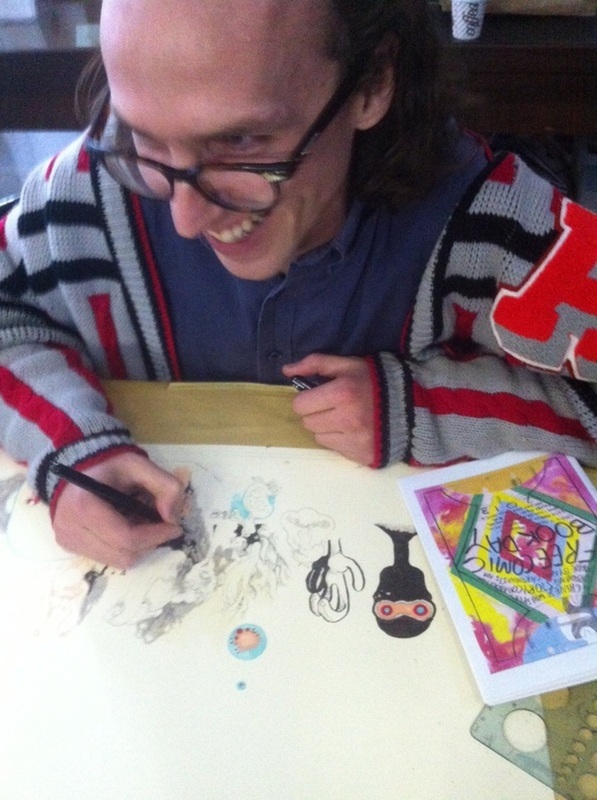 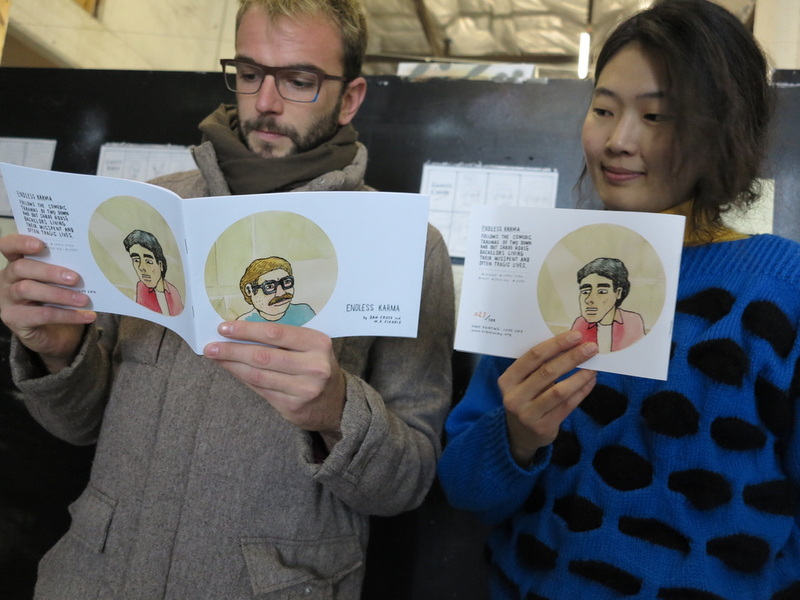 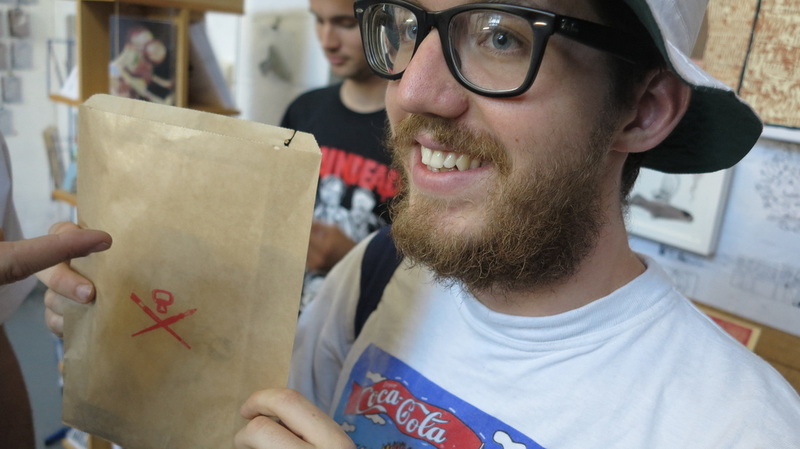 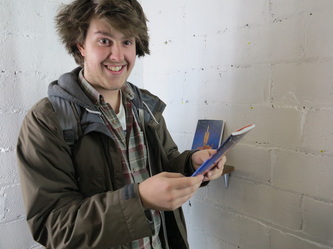 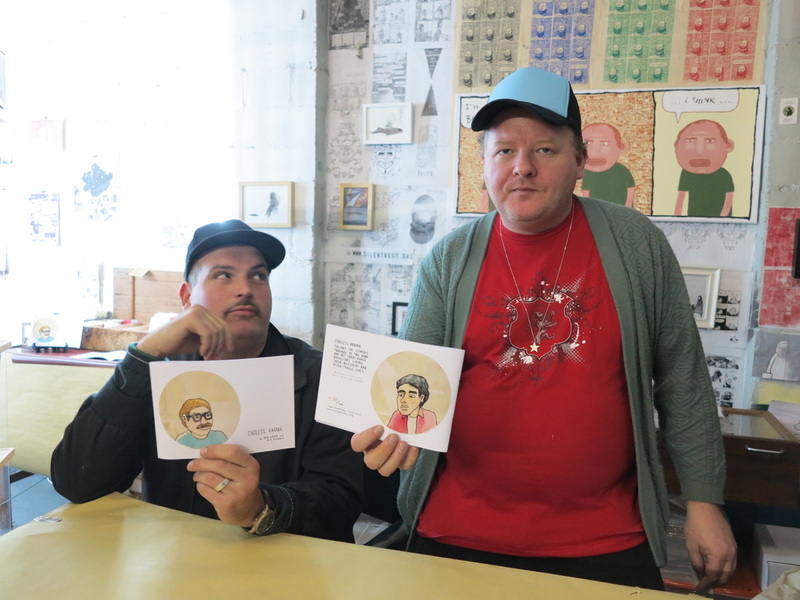 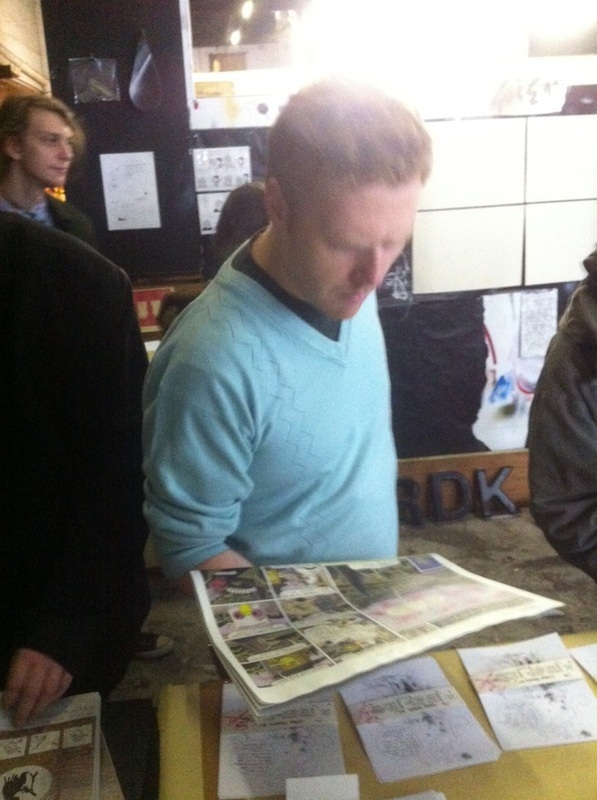 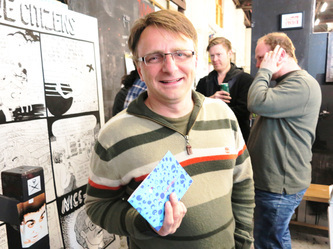 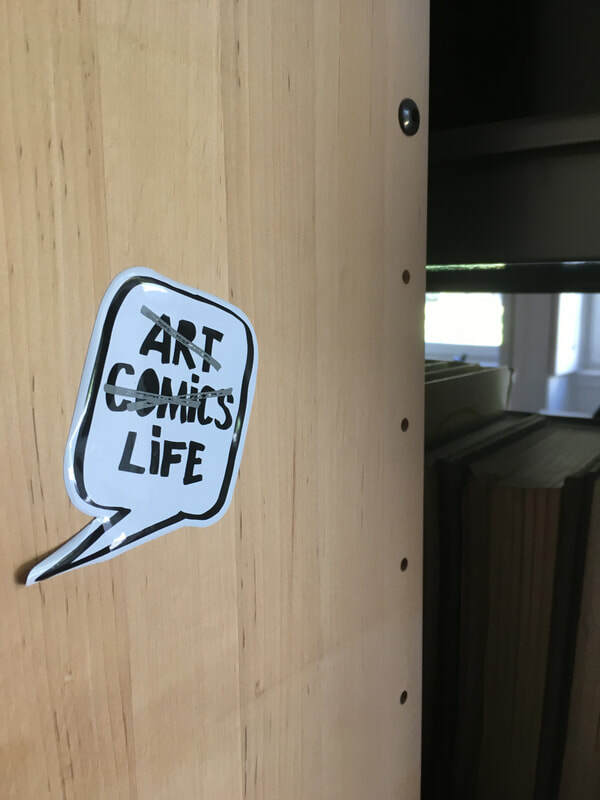 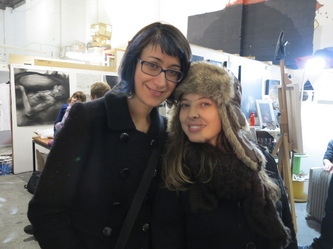 FREE COMIC ART DAY at the storeroom people loved it and we wish we could just give it away everyday! 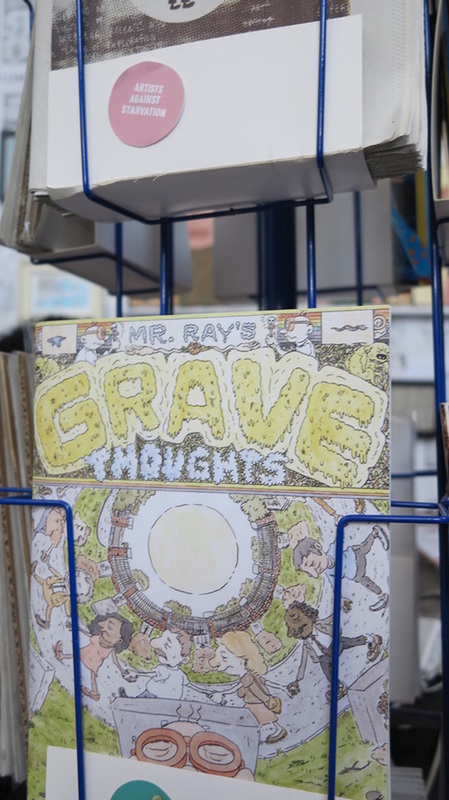 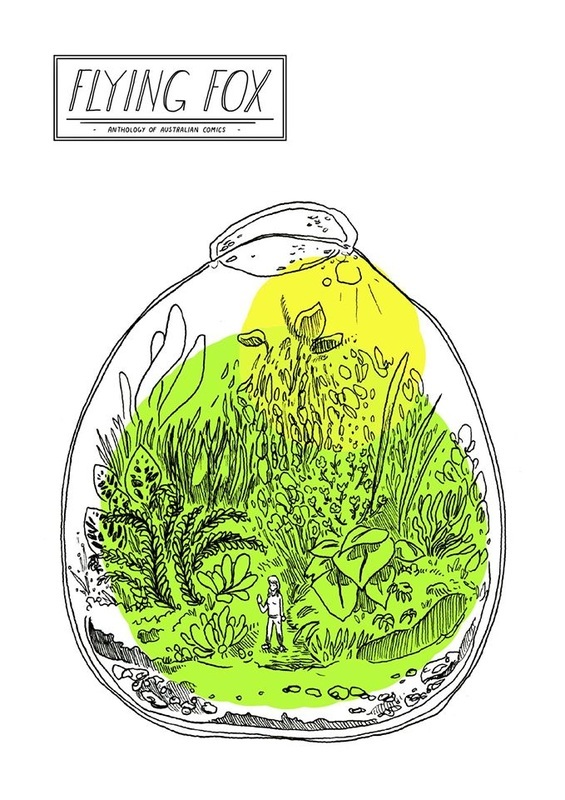 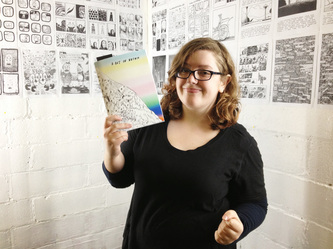 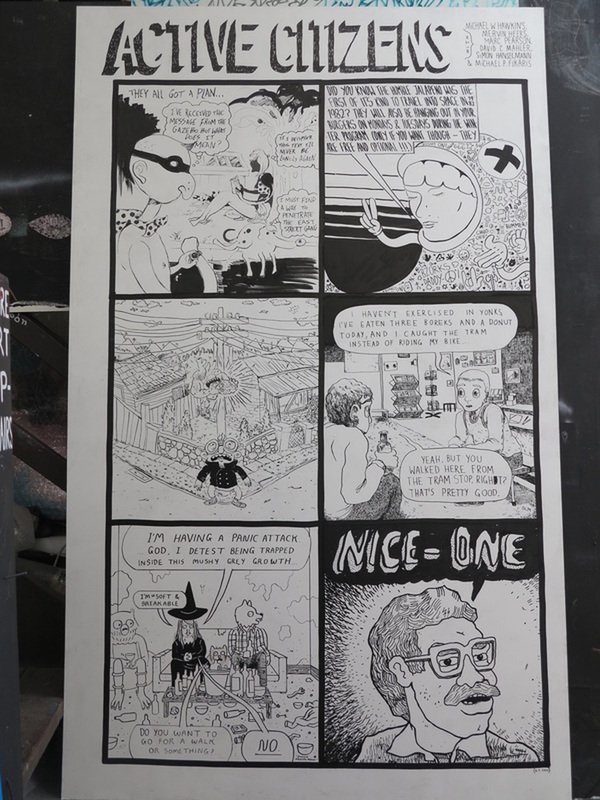 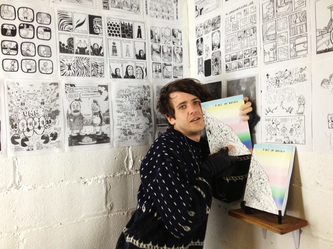 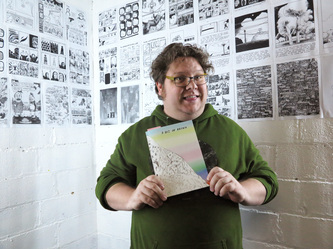 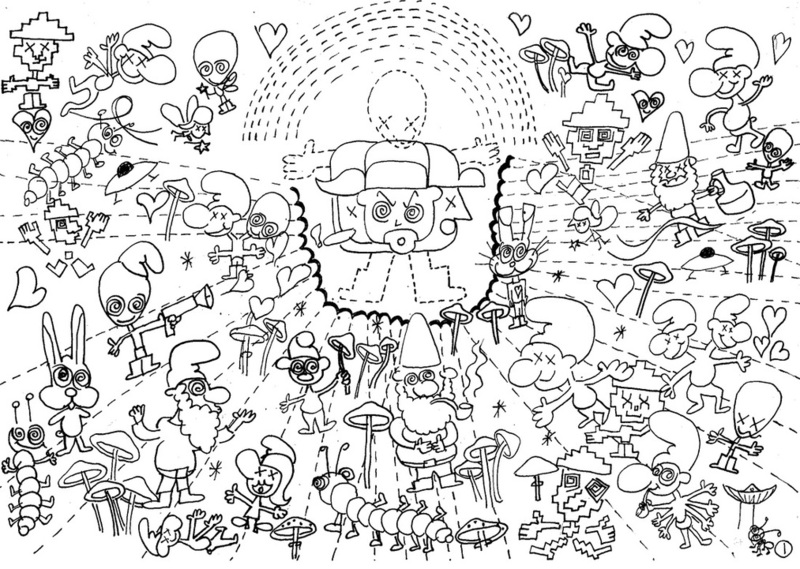 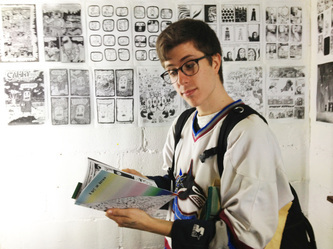 St. Owls Bay is a gigantic full - colour 8 page broadseet comic book published by Floating World, Portland, Oregon in Feb. 2013. 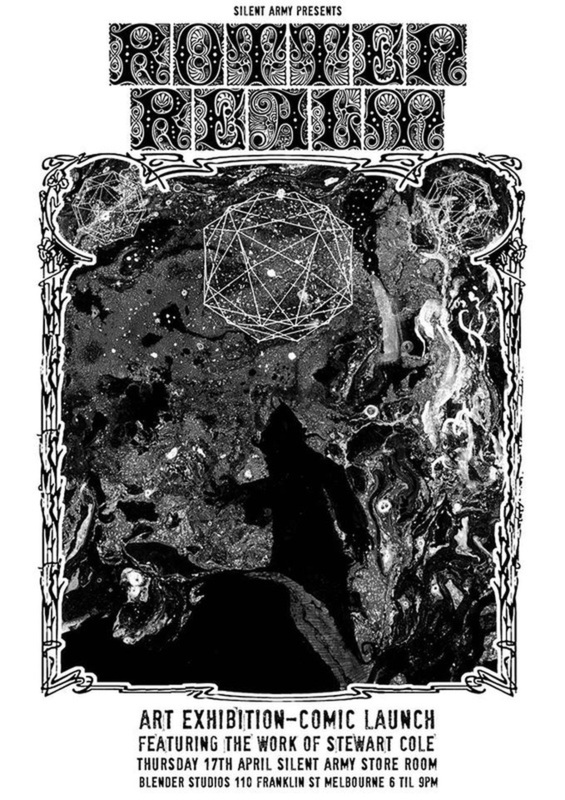 Edition of 1000. 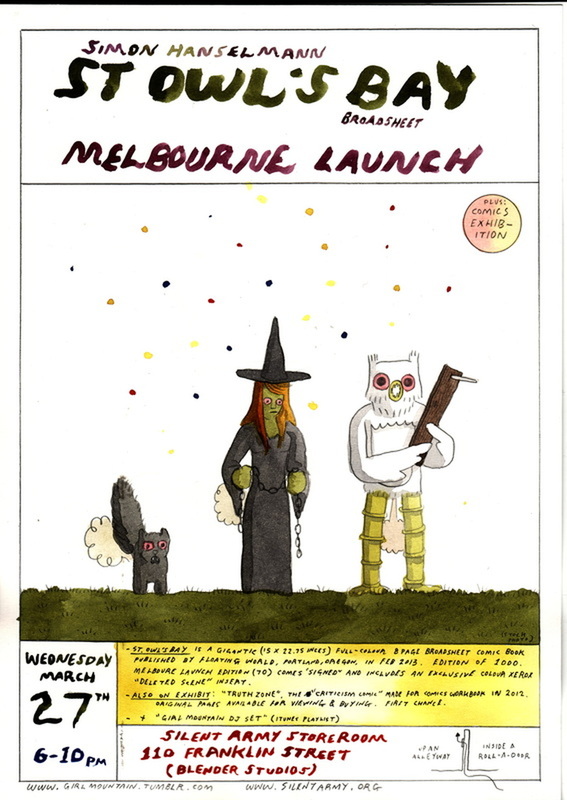 Melbourne, Australia Launch Edition (70) comes 'signed'. 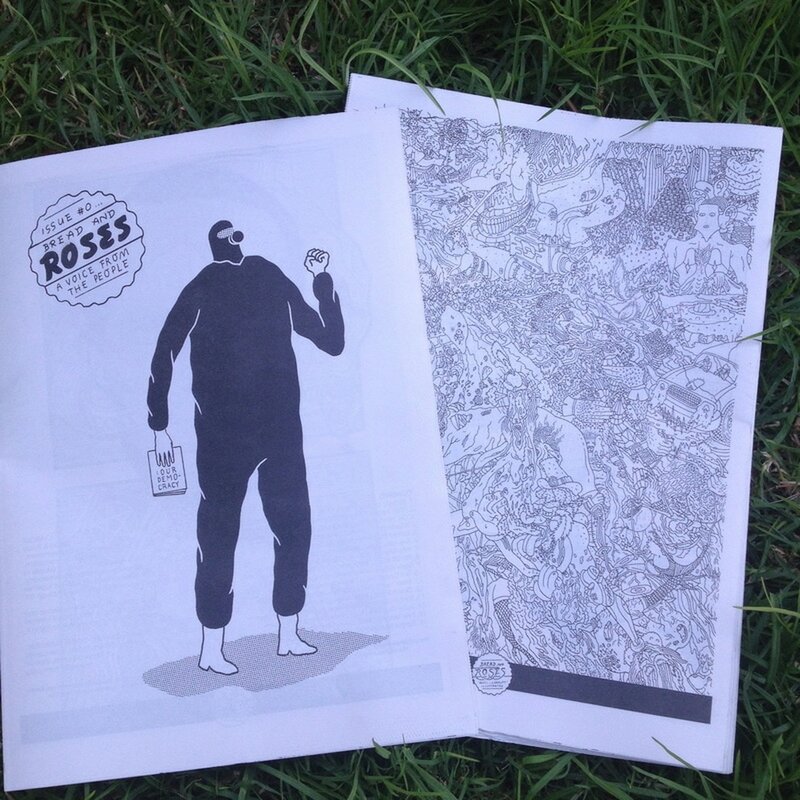 Includes an exclusive colour xerox 'deleted scene' insert. 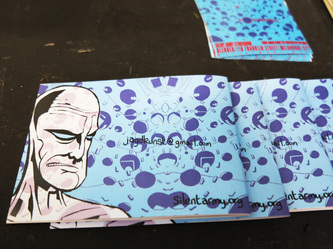 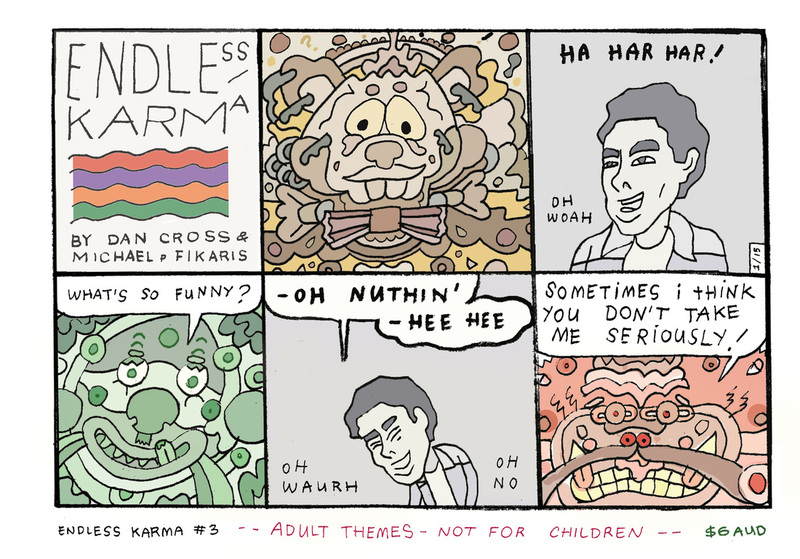 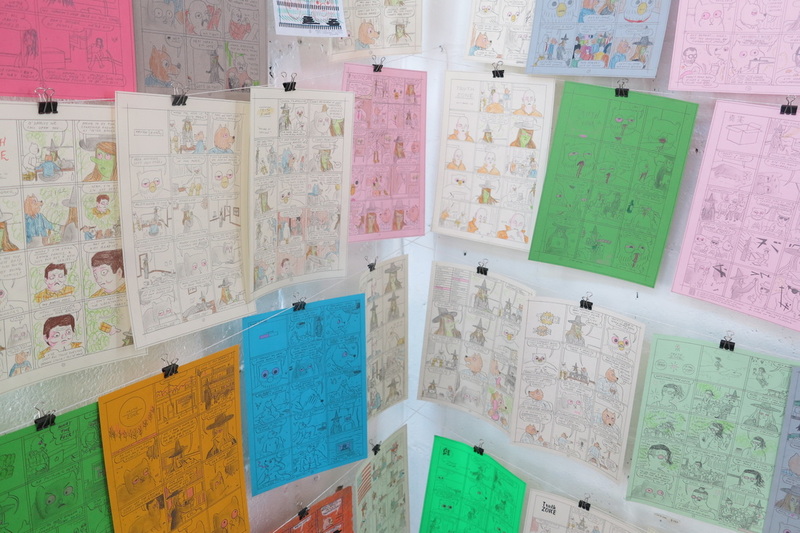 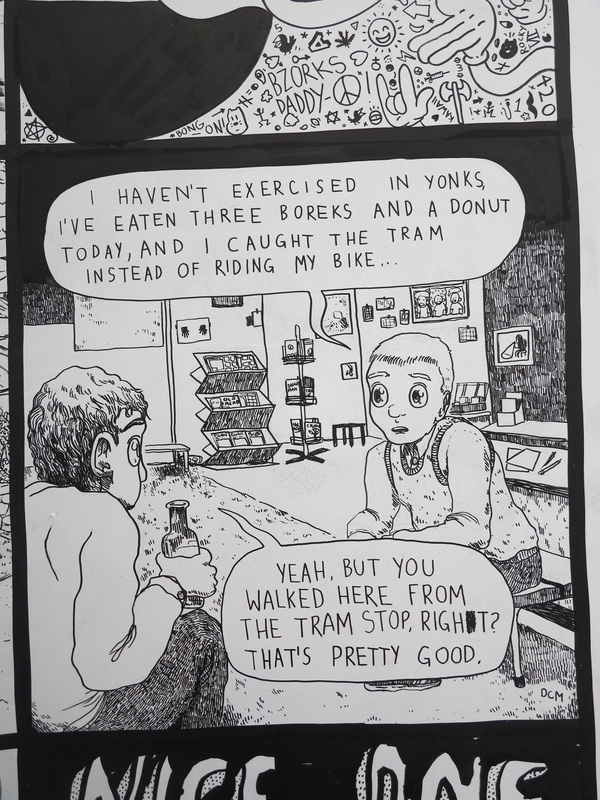 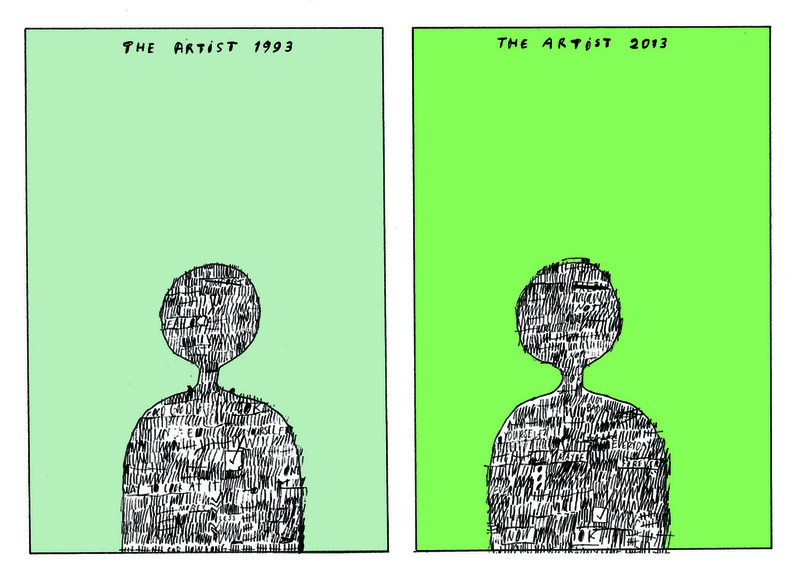 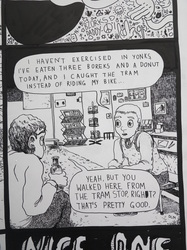 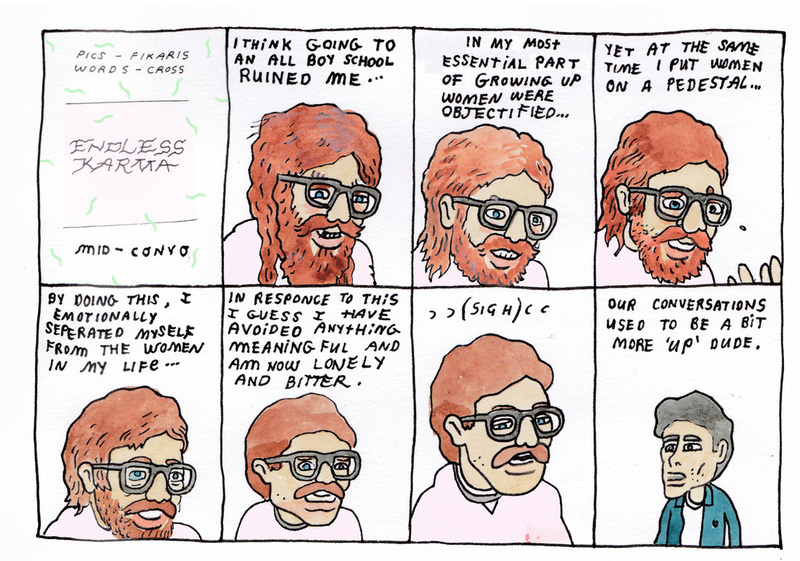 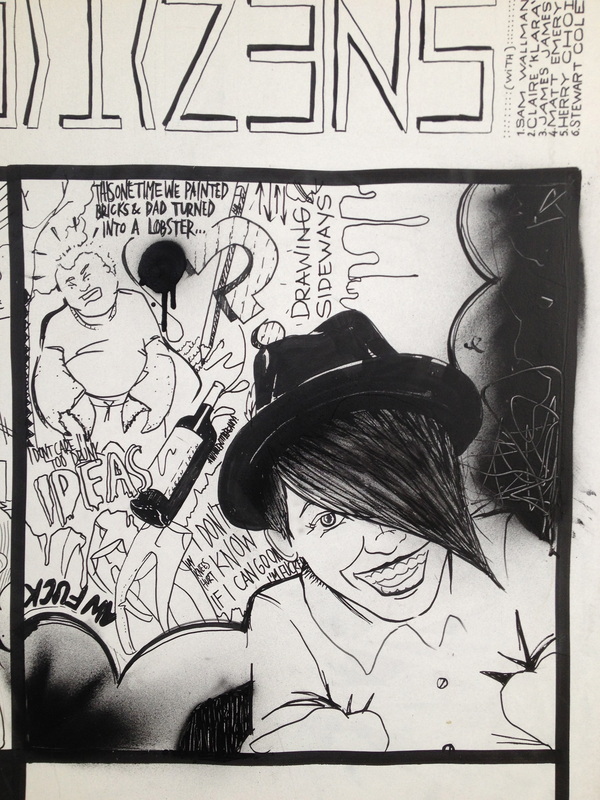 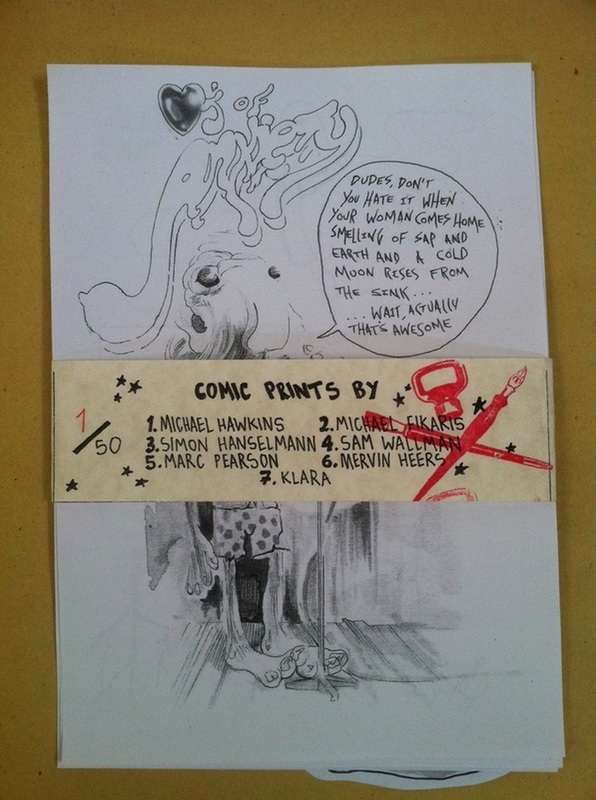 Also on Exhibit 'Truth Zone' the 'criticism comic' made for comics workbook in 2012. 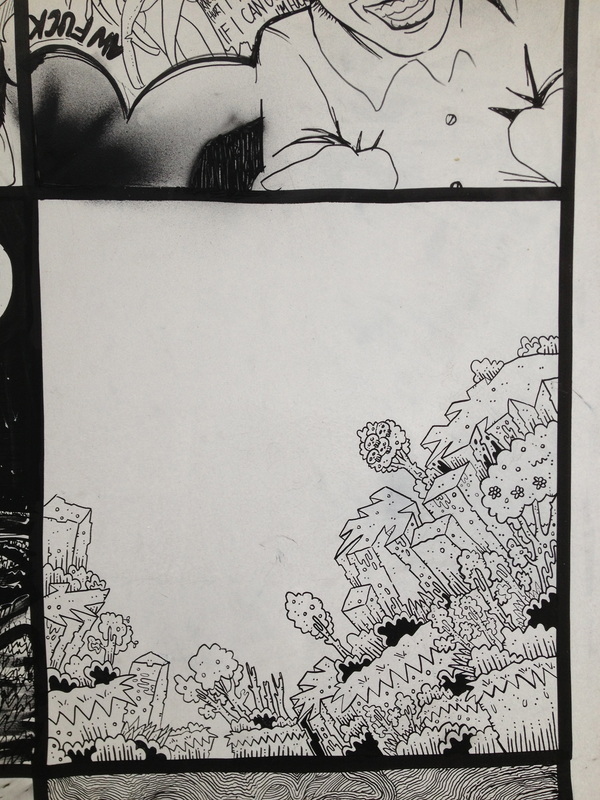 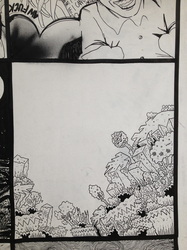 Original pages available for viewing and buying. 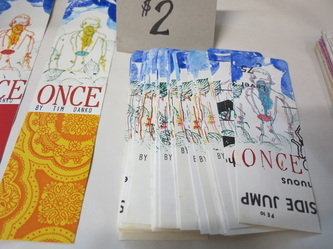 first chance! 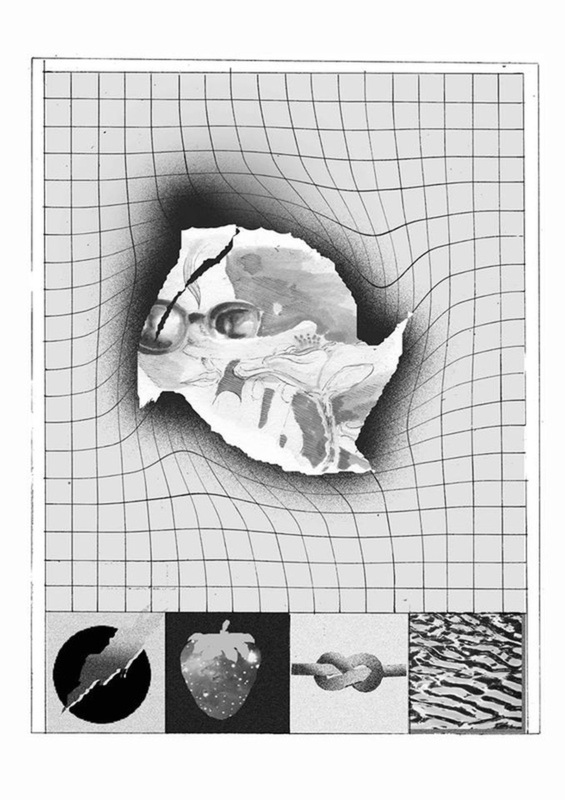 PLUS (now decided) live set w/ special guest HTML FLOWERS. 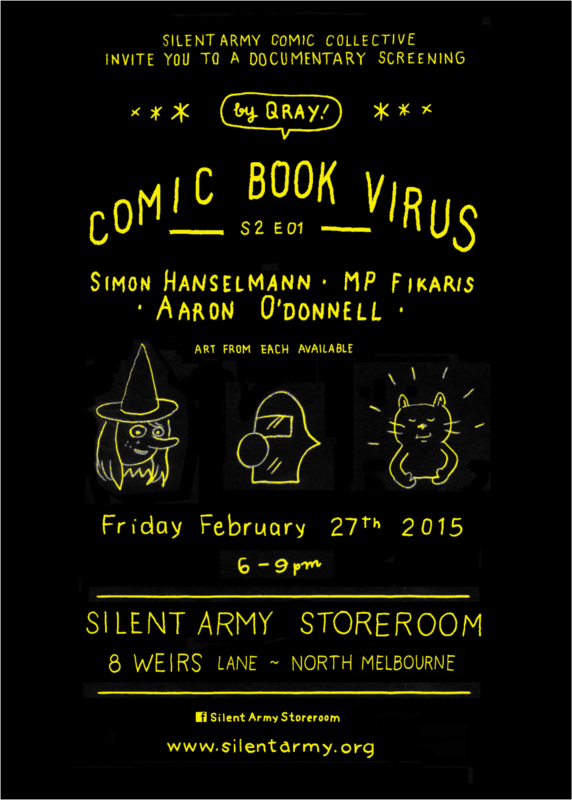 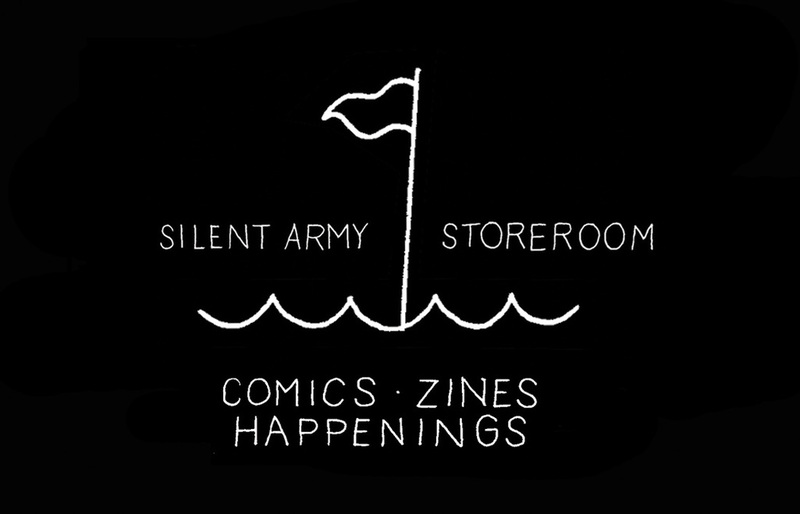 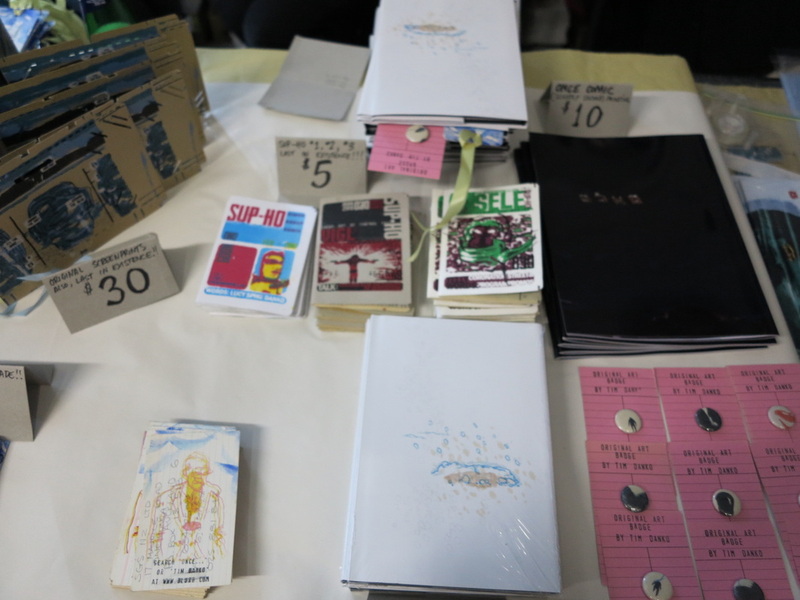 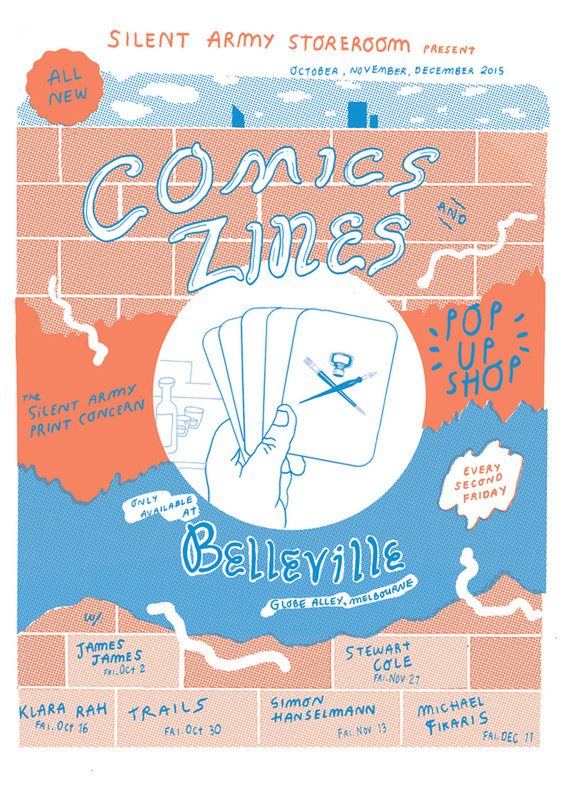 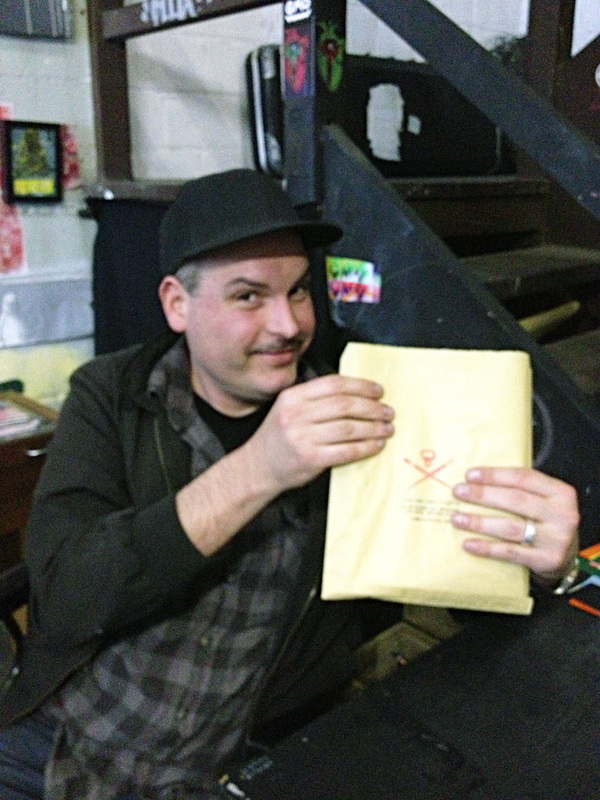 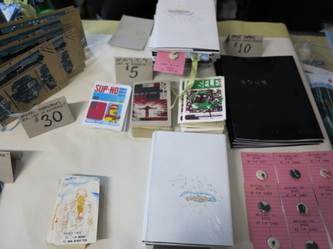 DAILIES Issue 3 – Second Launch at the Storeroom on February.27 The comic anthology of variety from Silent Army publishing. 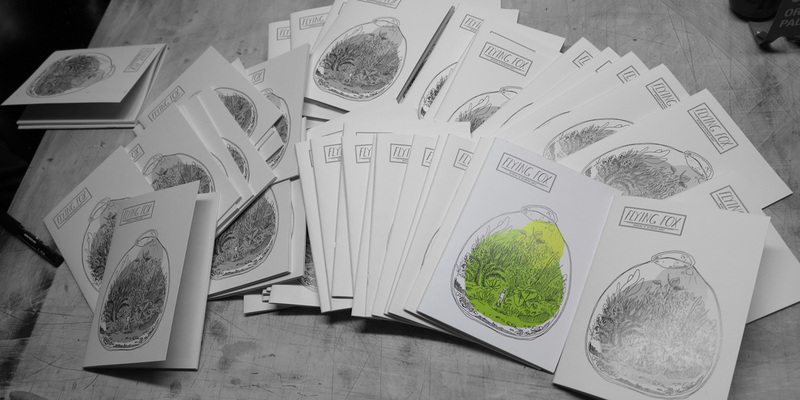 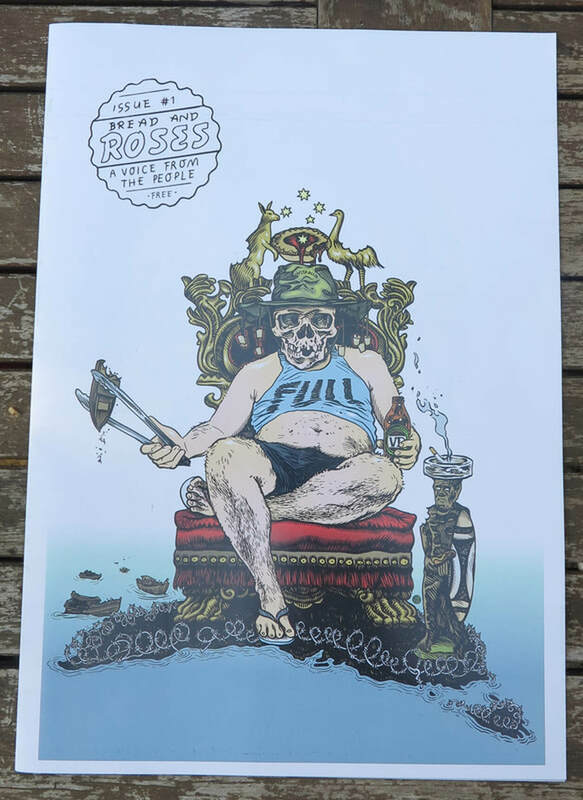 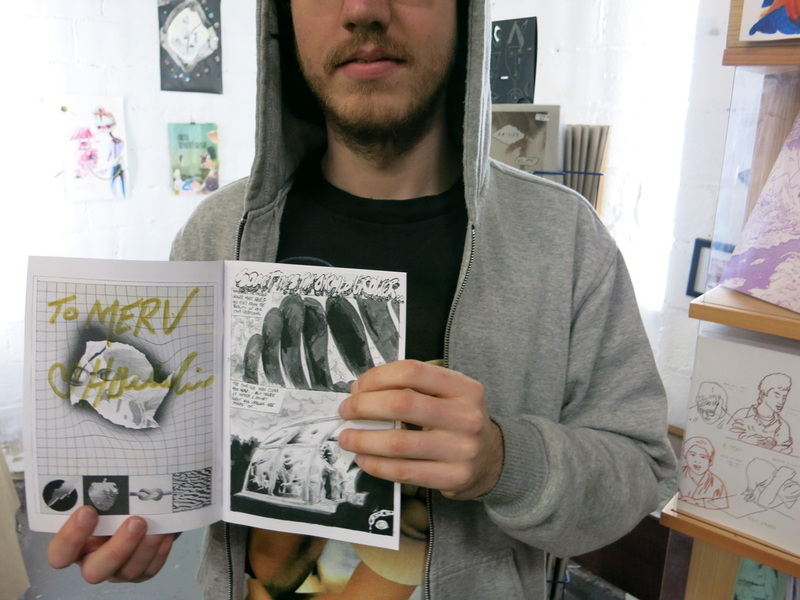 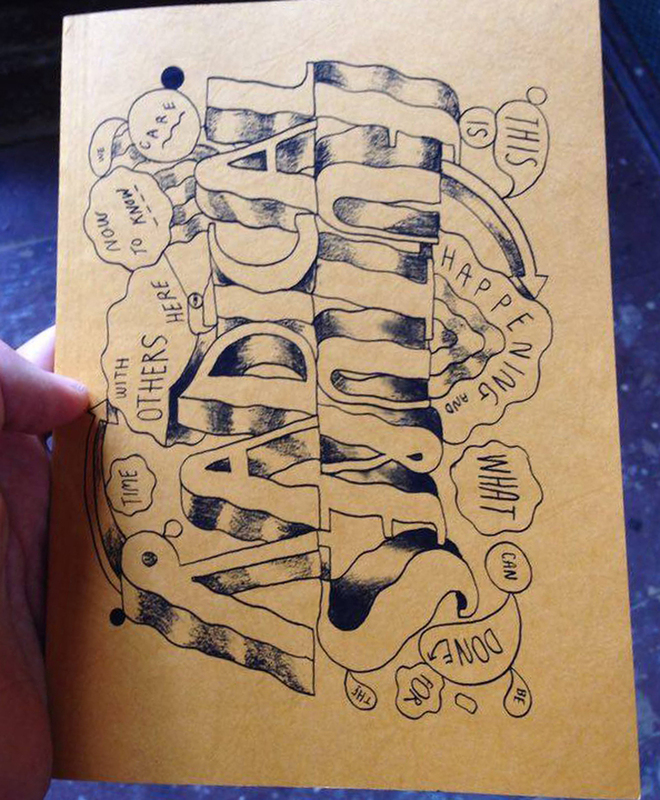 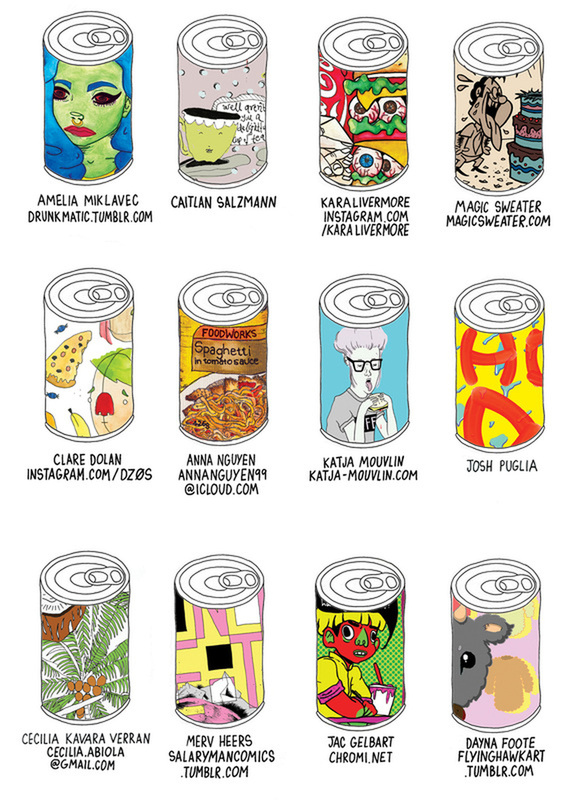 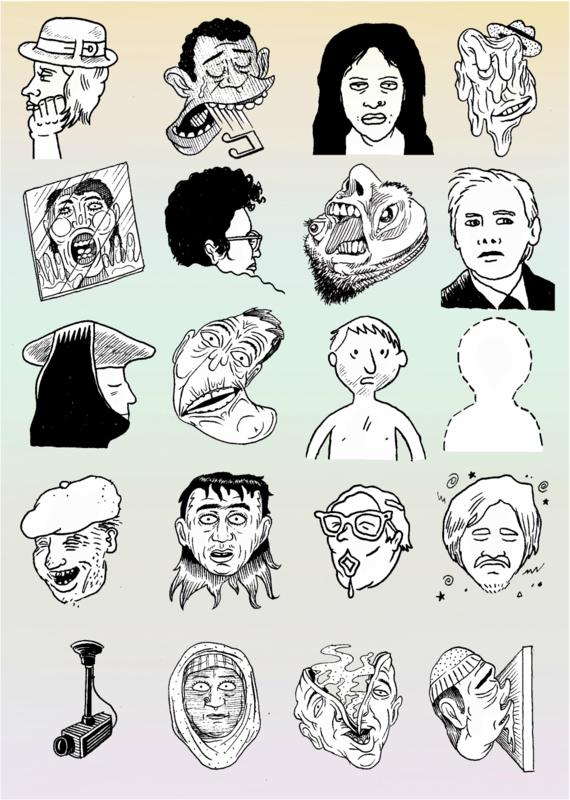 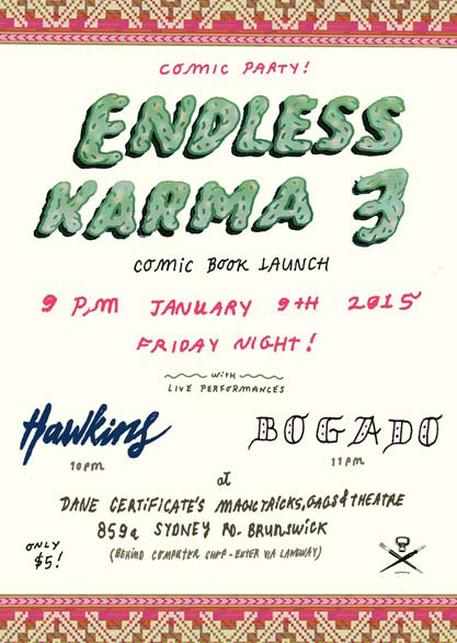 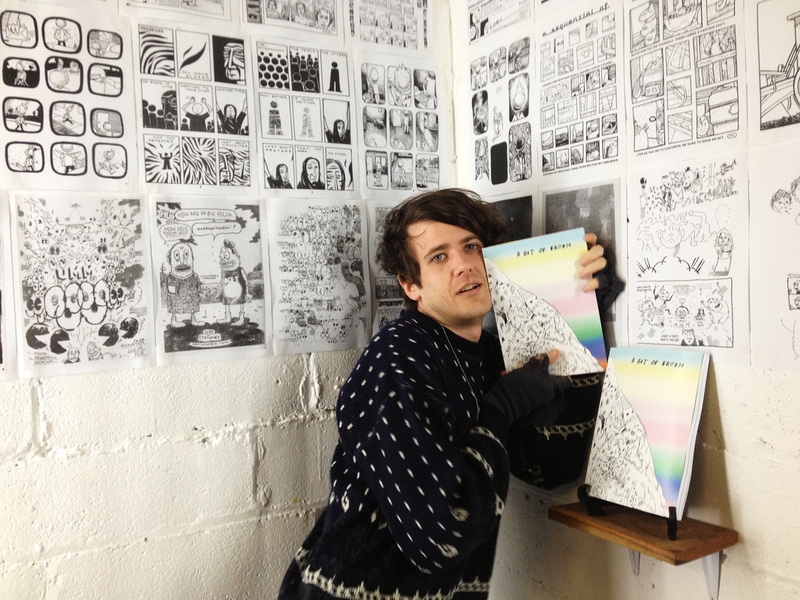 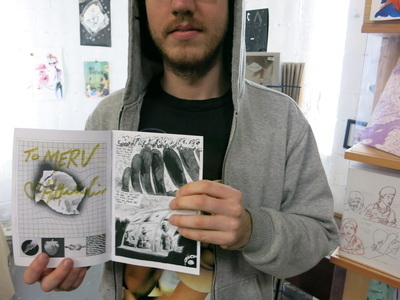 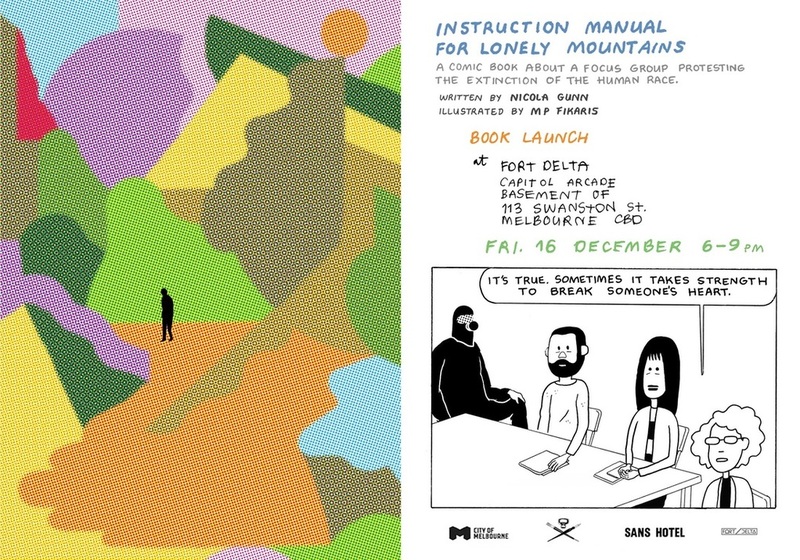 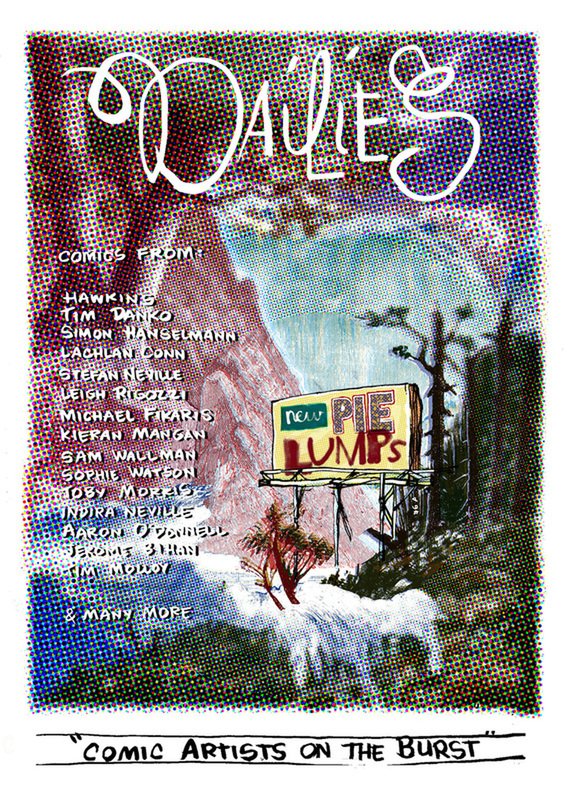 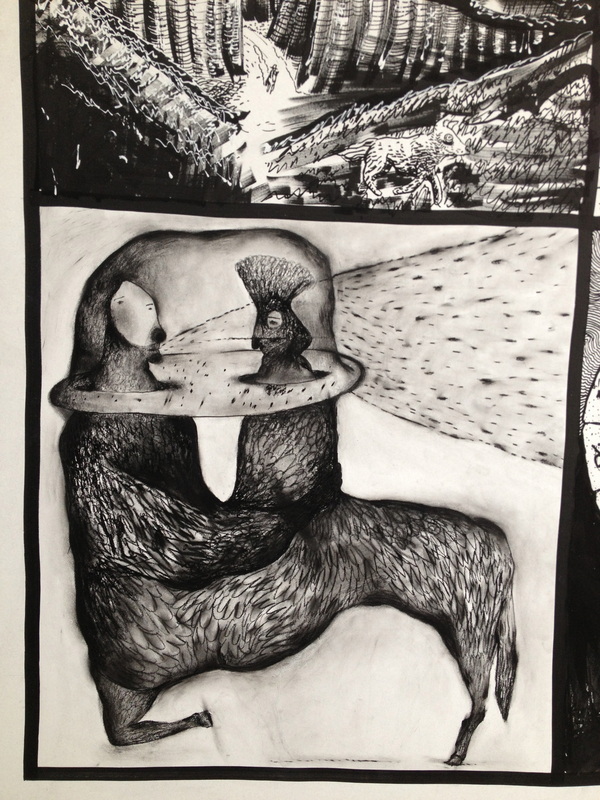 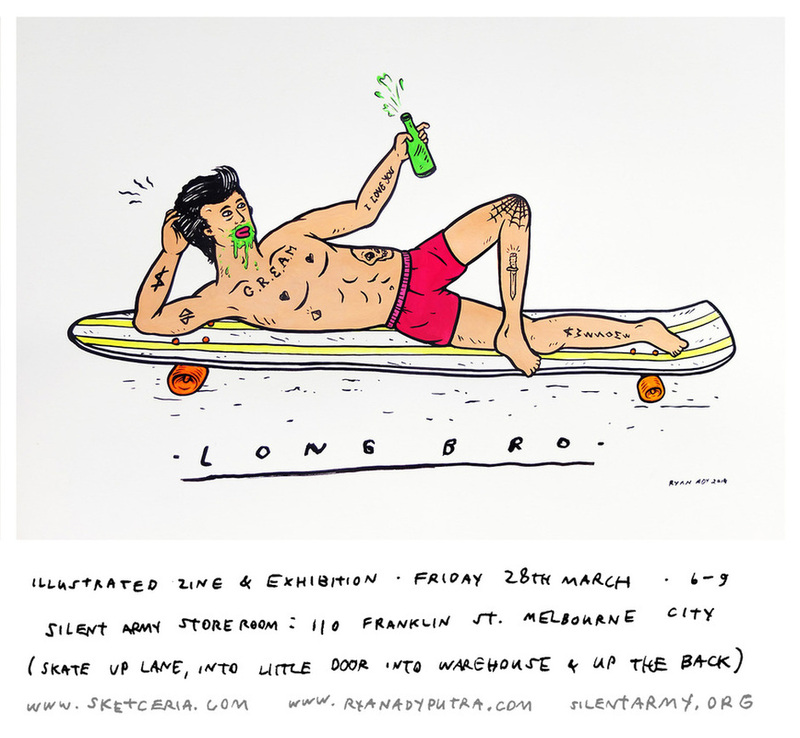 NZ special co-edited with over 40 artists across 64 pages.First 20 through the door get a free poster.